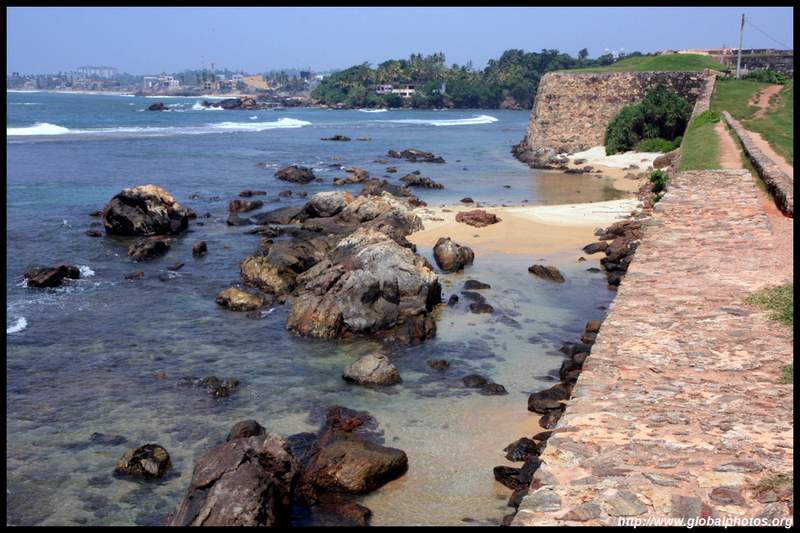 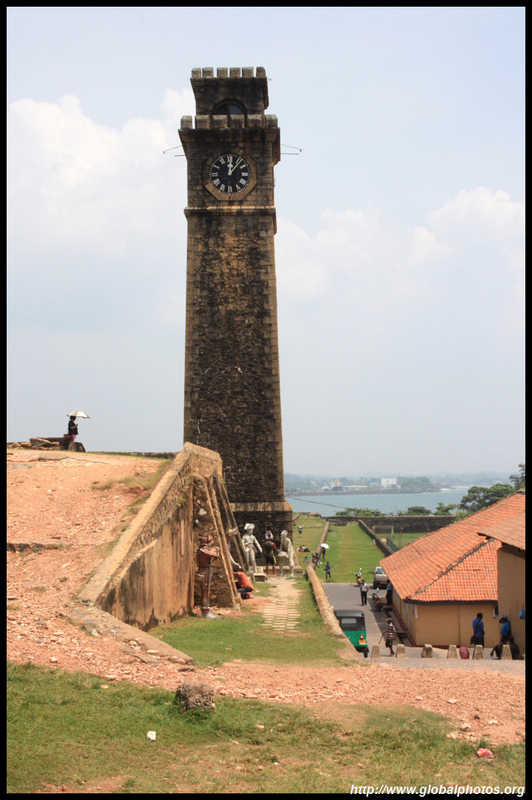 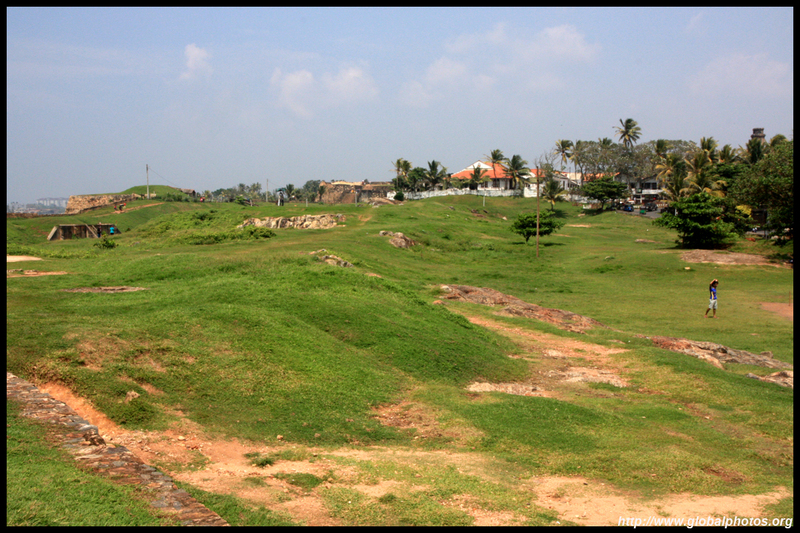 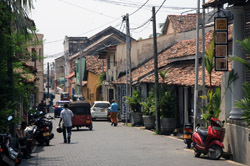 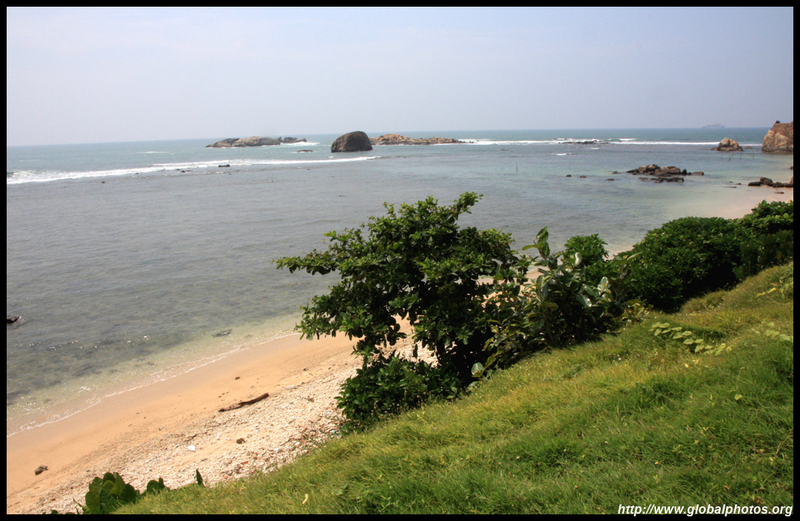 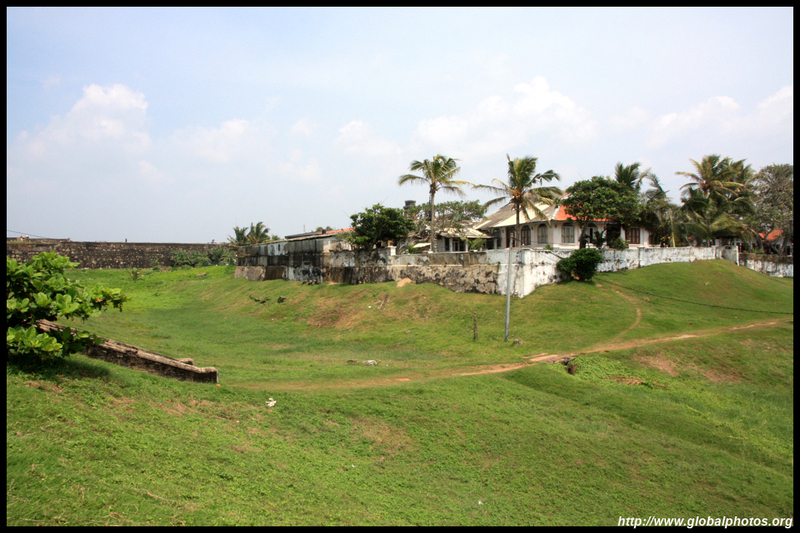 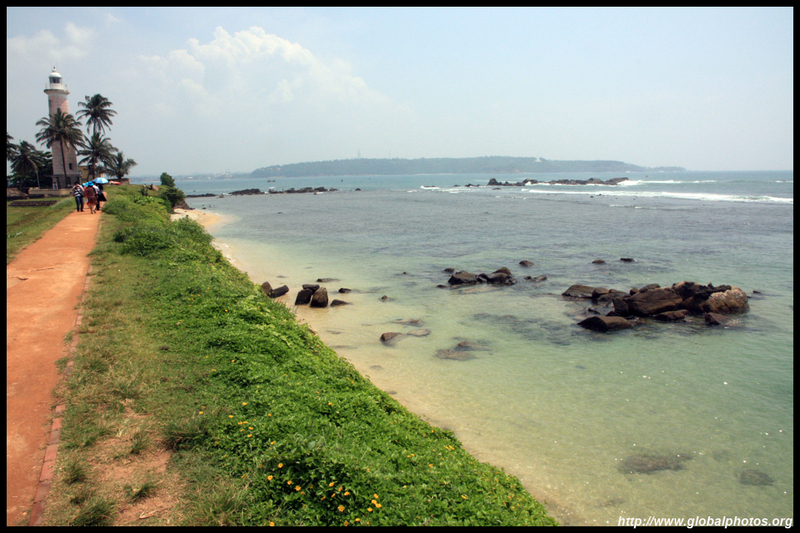 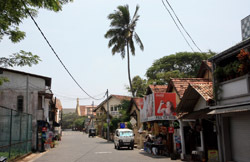 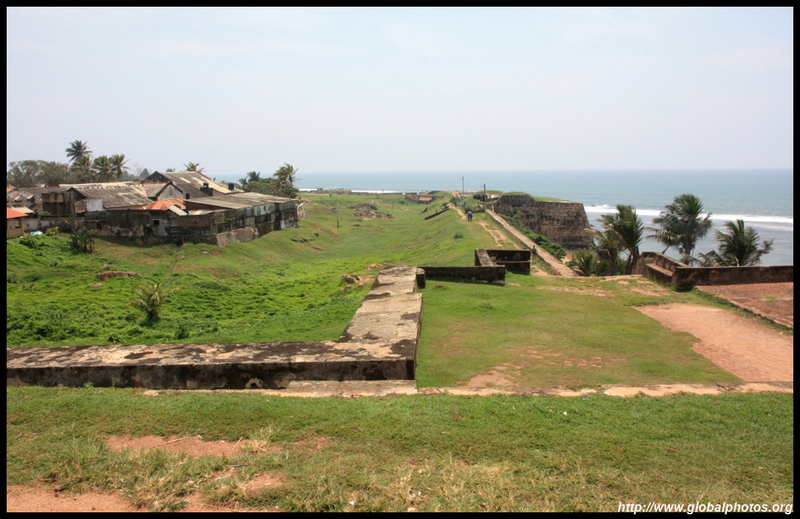 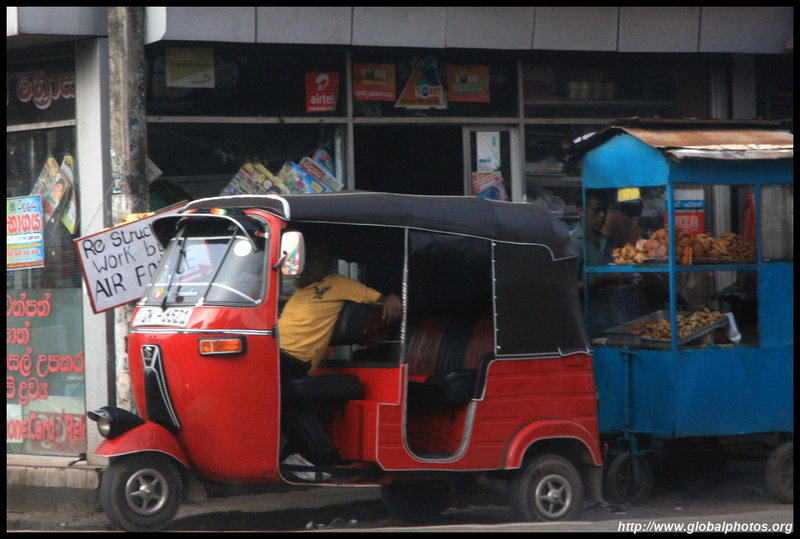 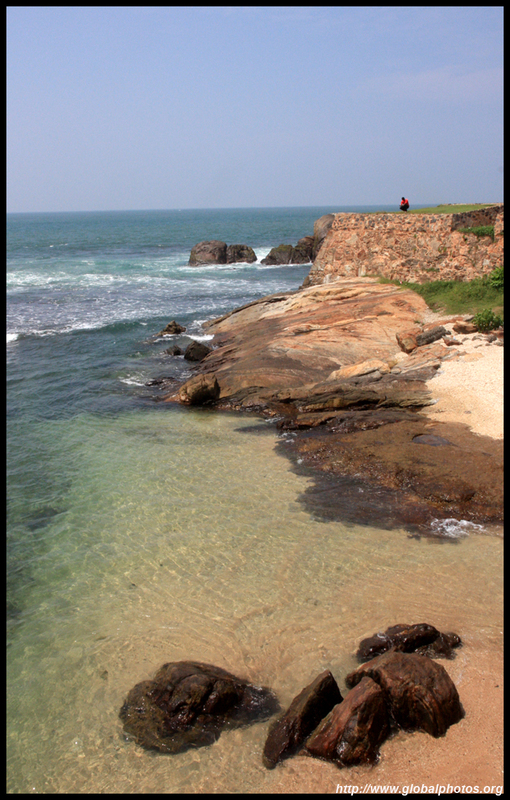 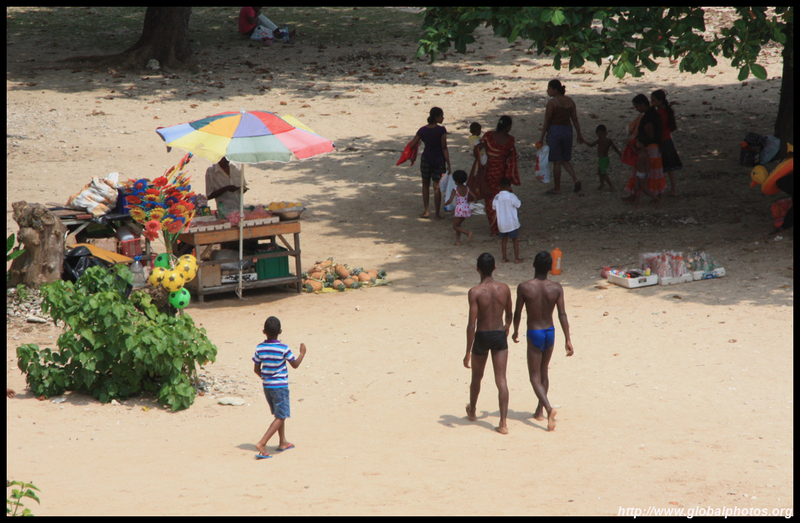 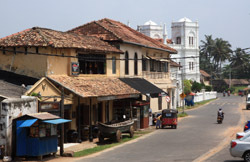 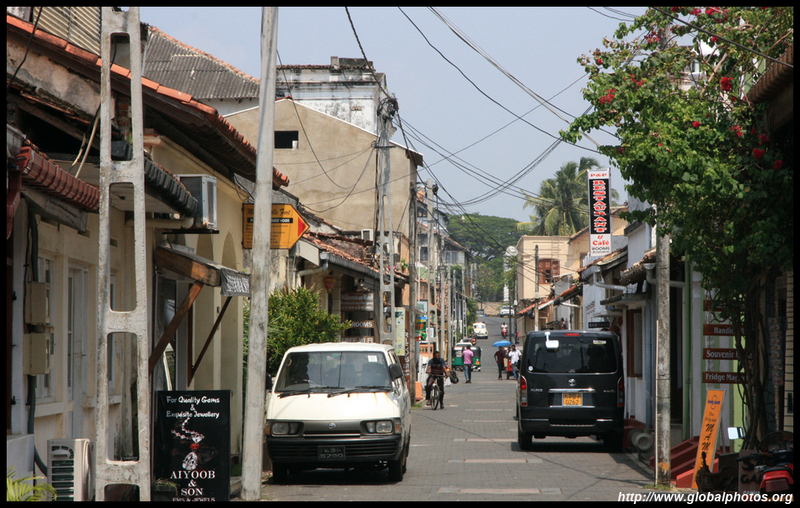 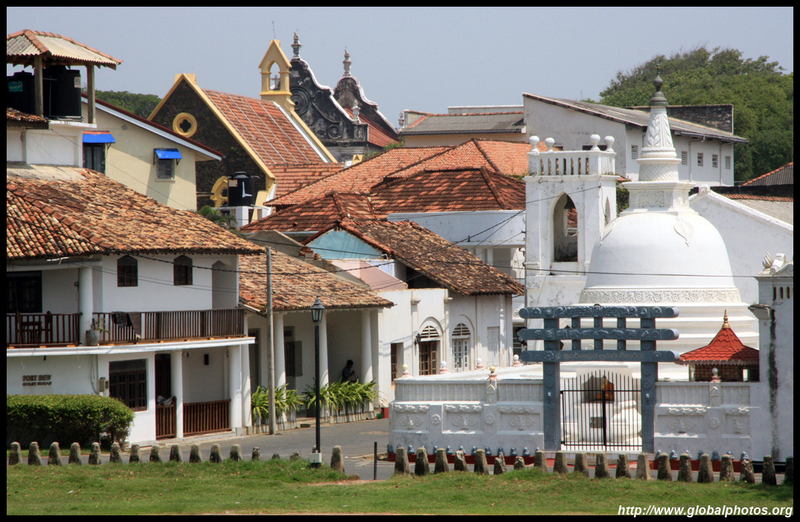 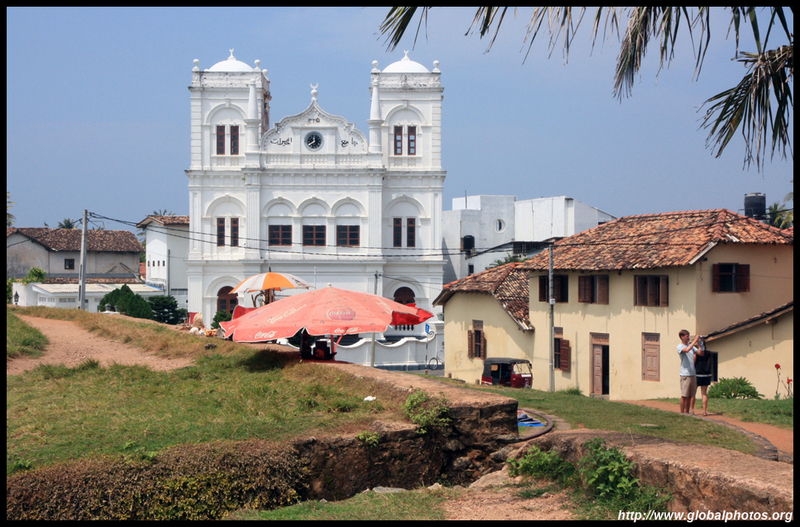 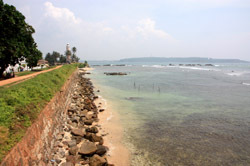 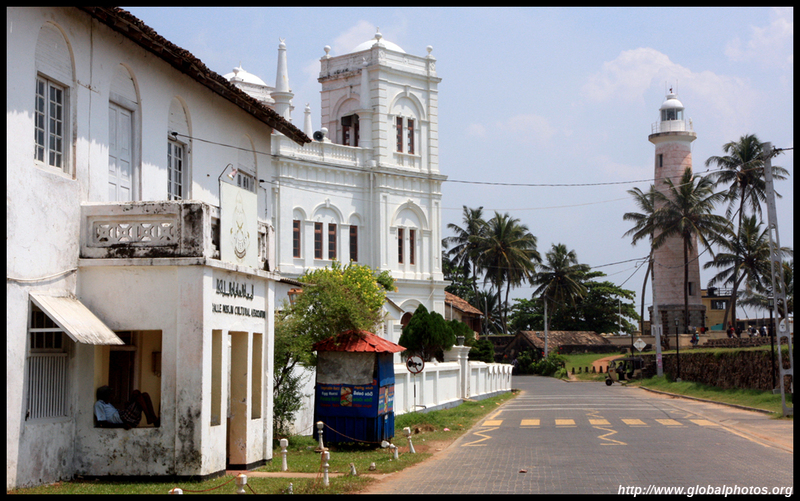 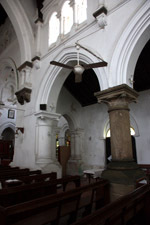 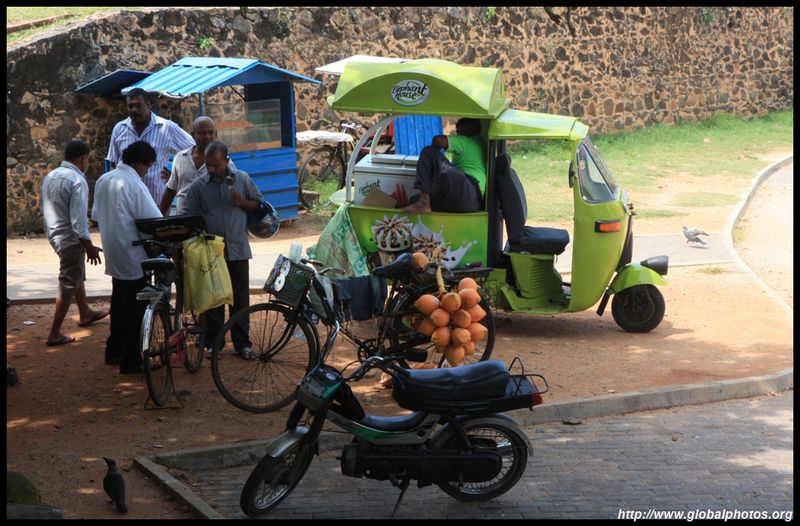 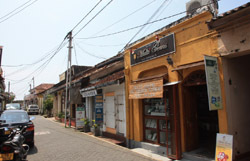 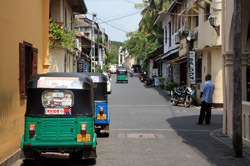 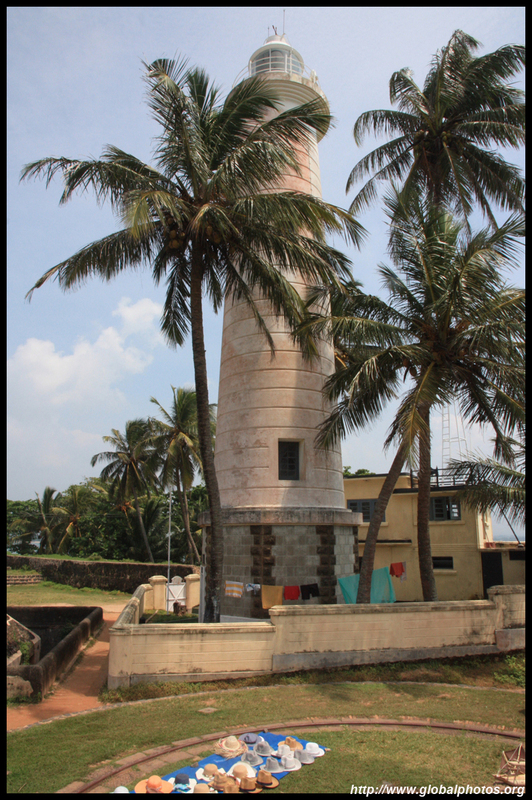 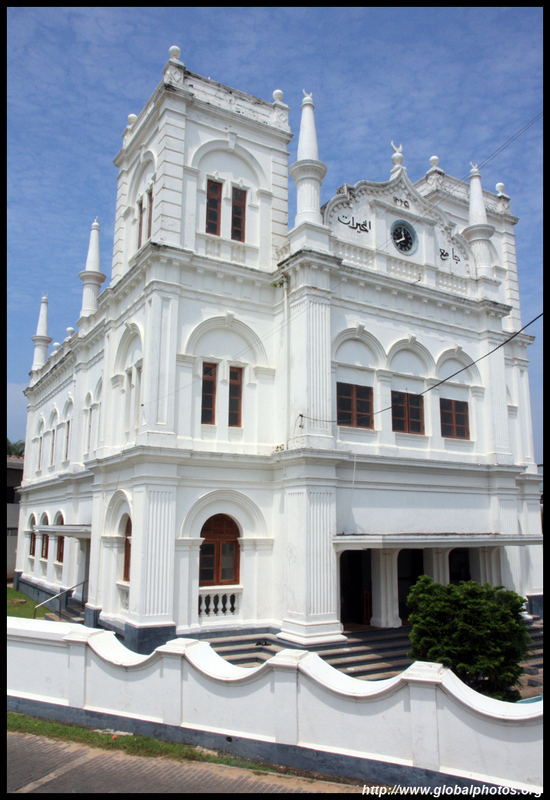 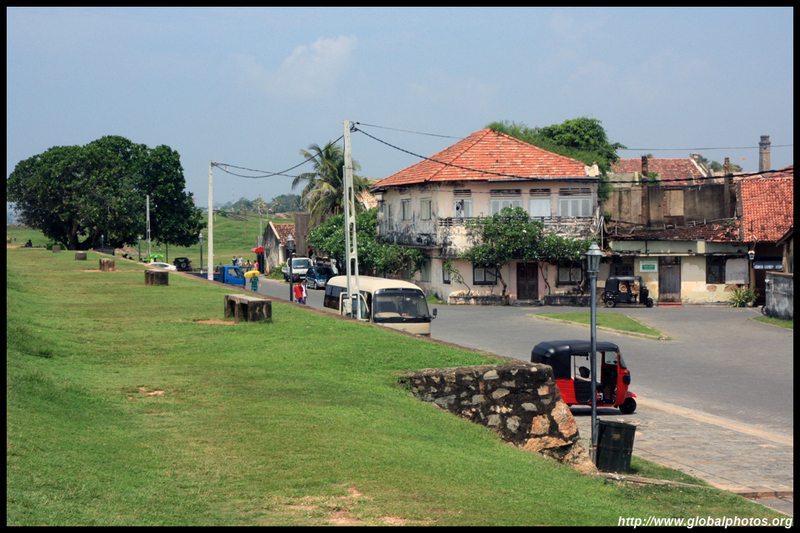 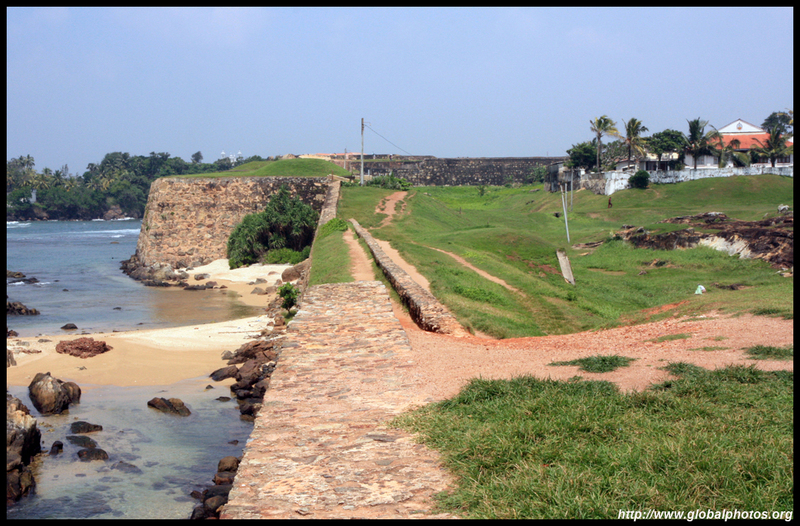 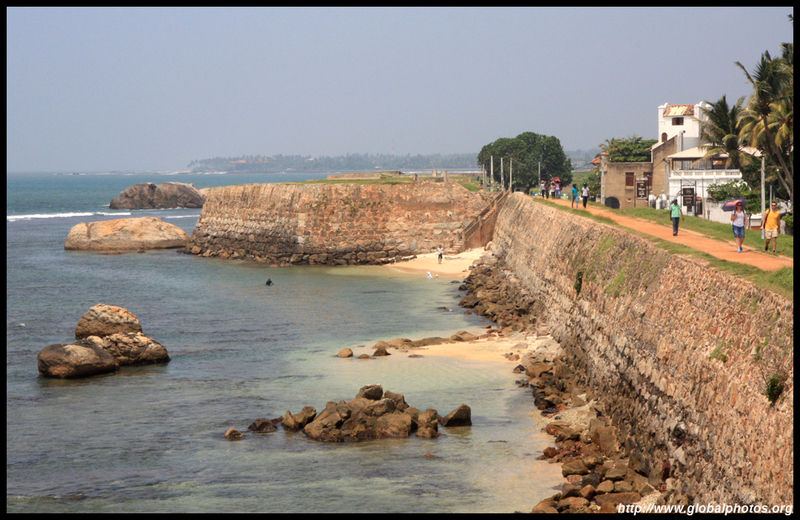 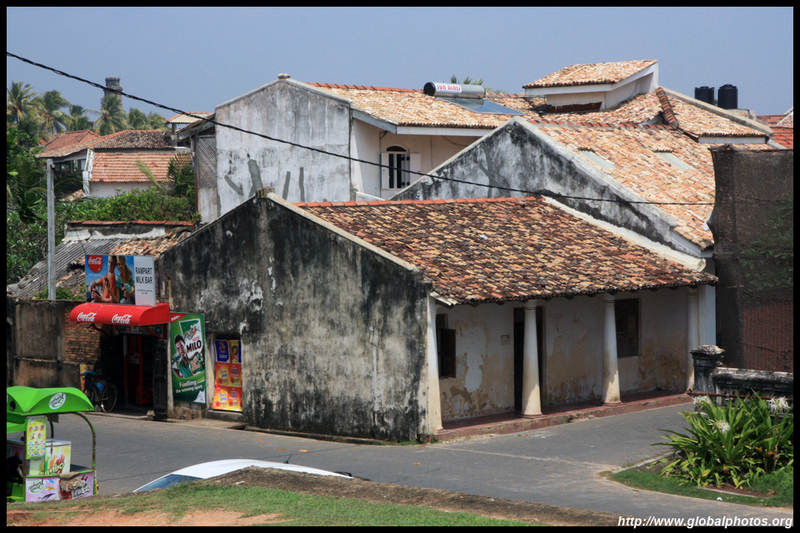 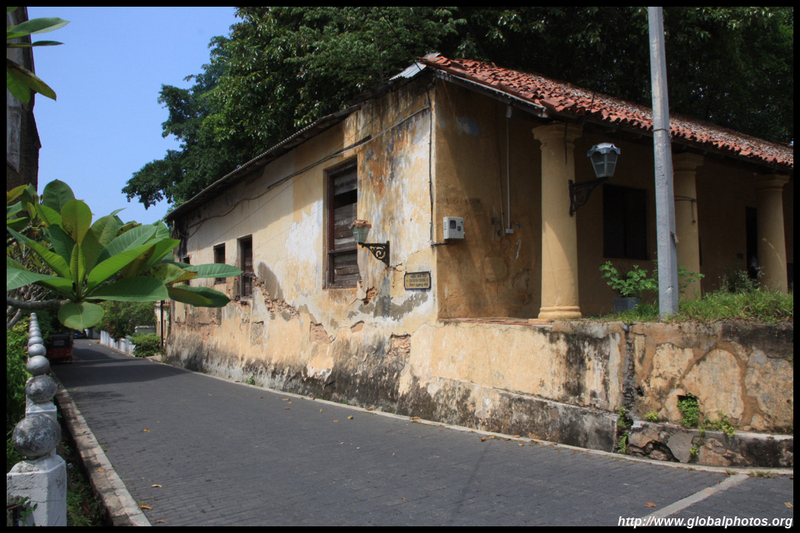 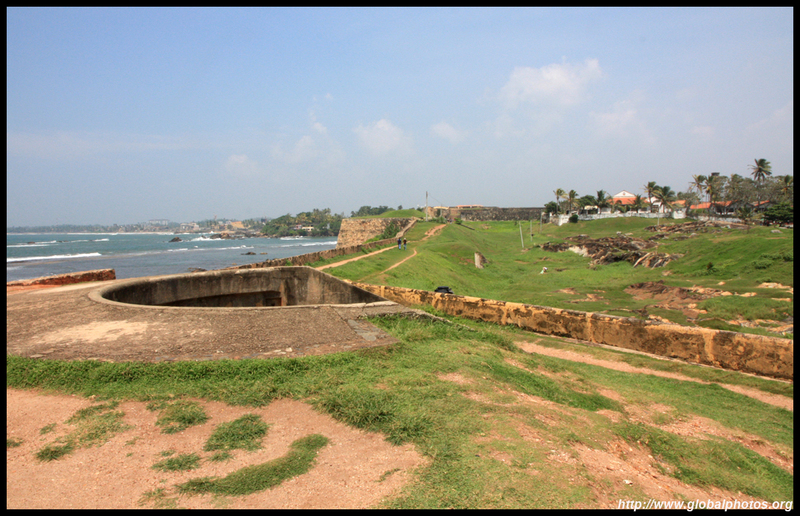 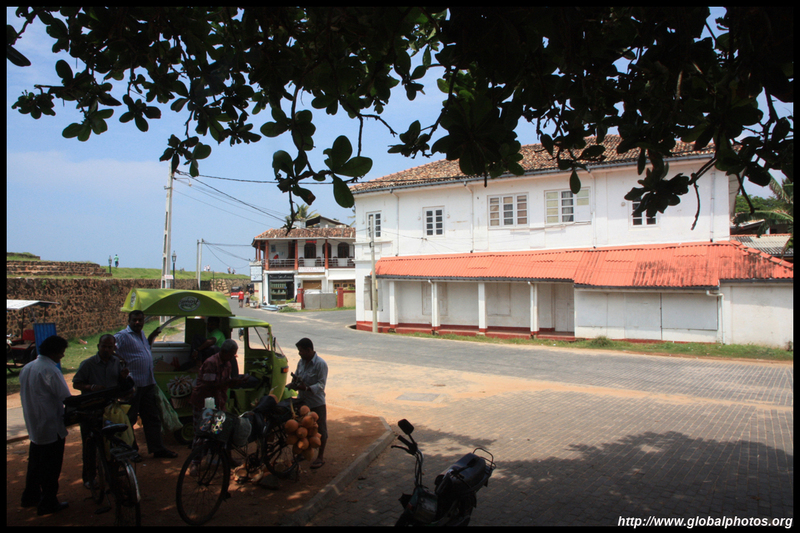 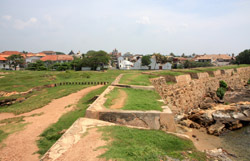 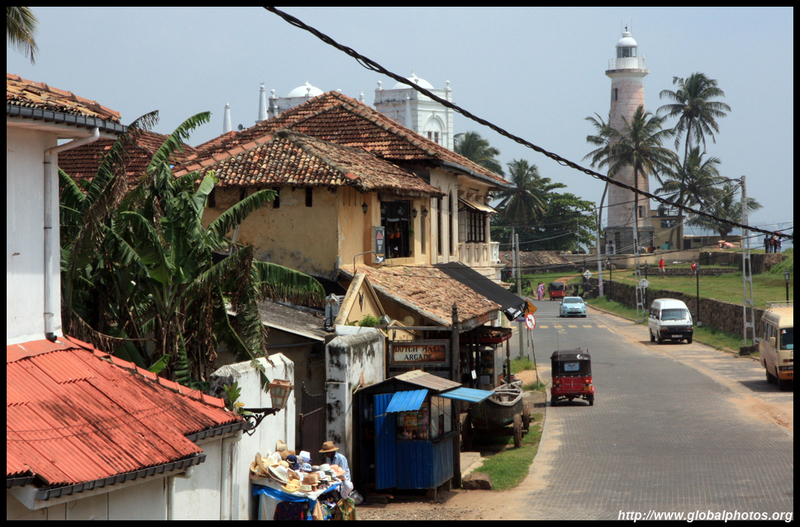 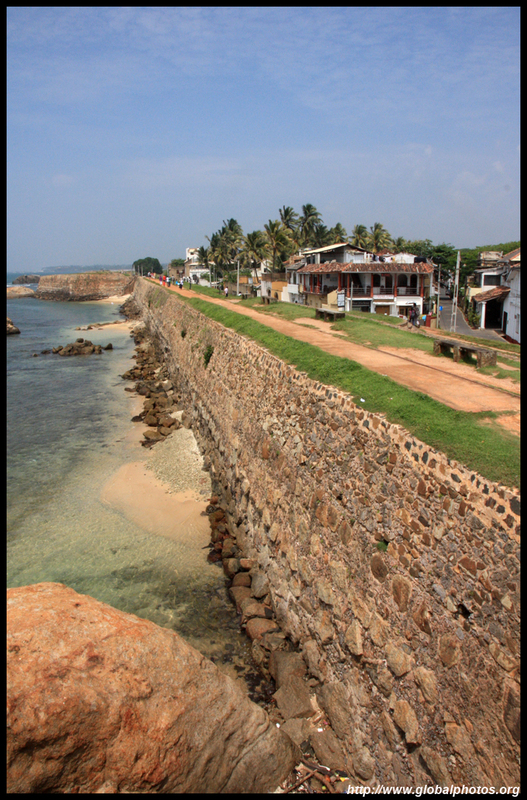 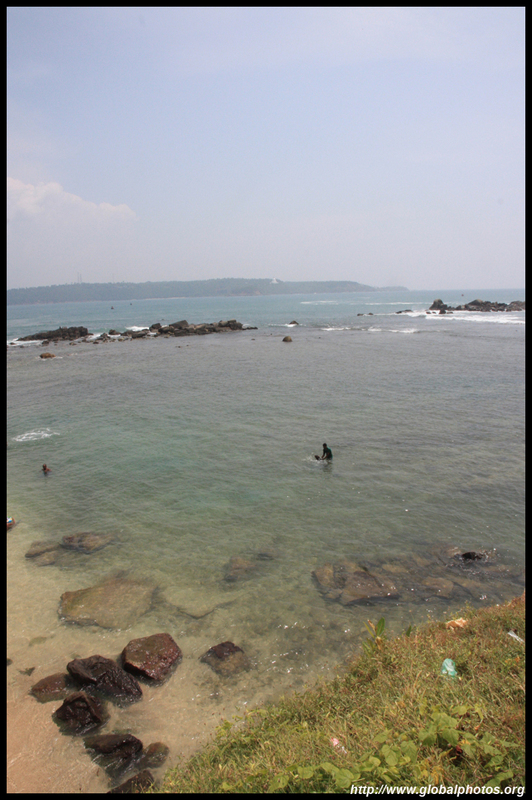 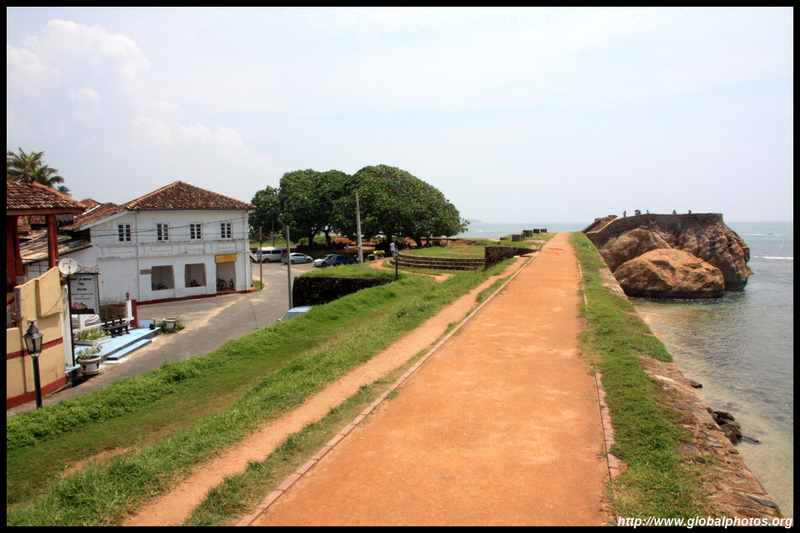 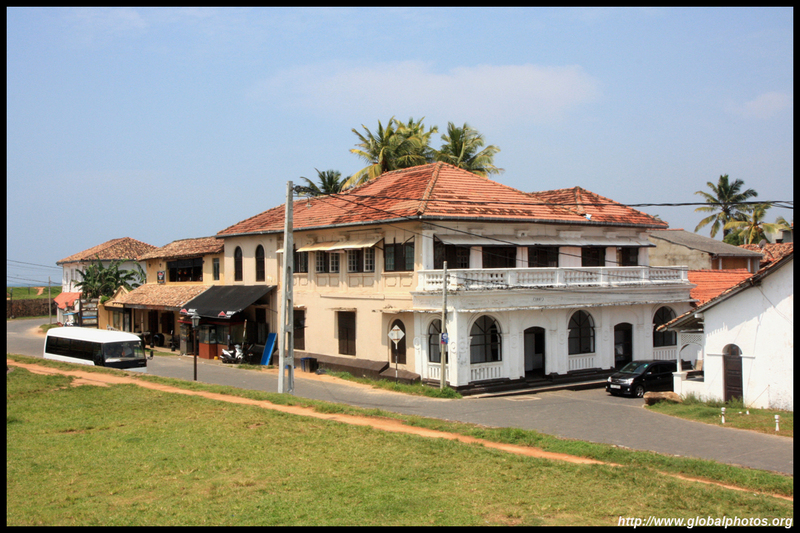 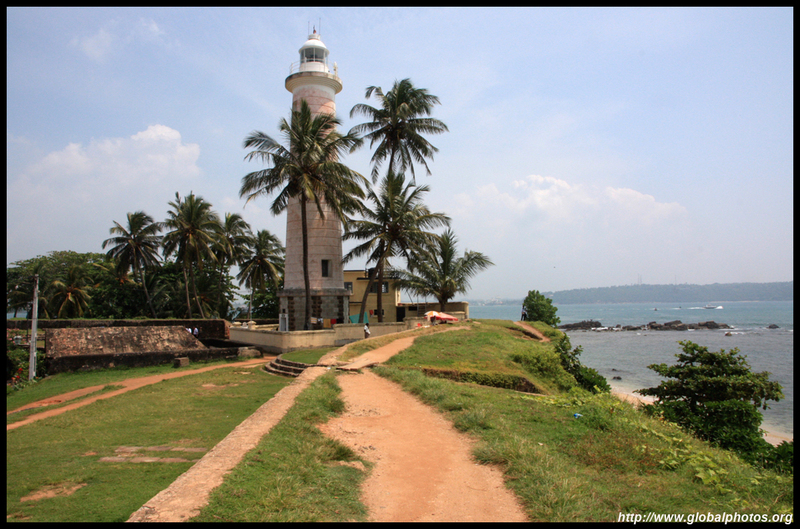 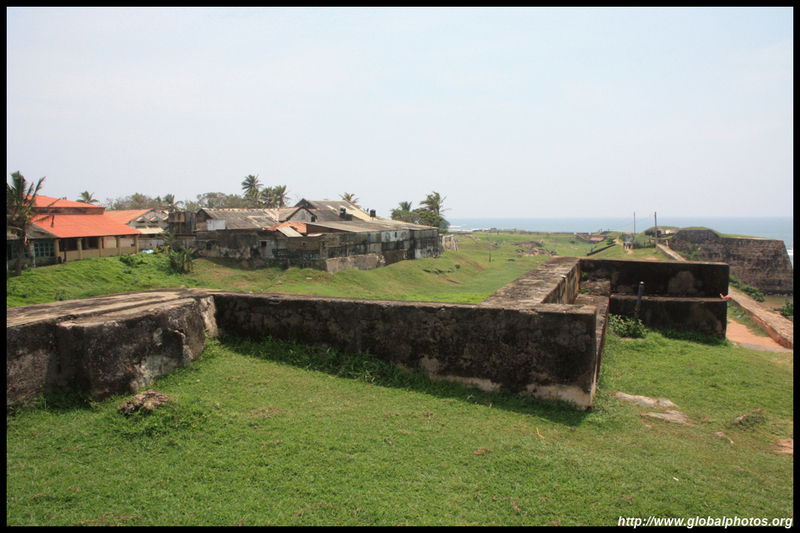 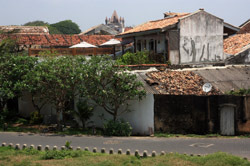 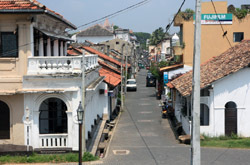 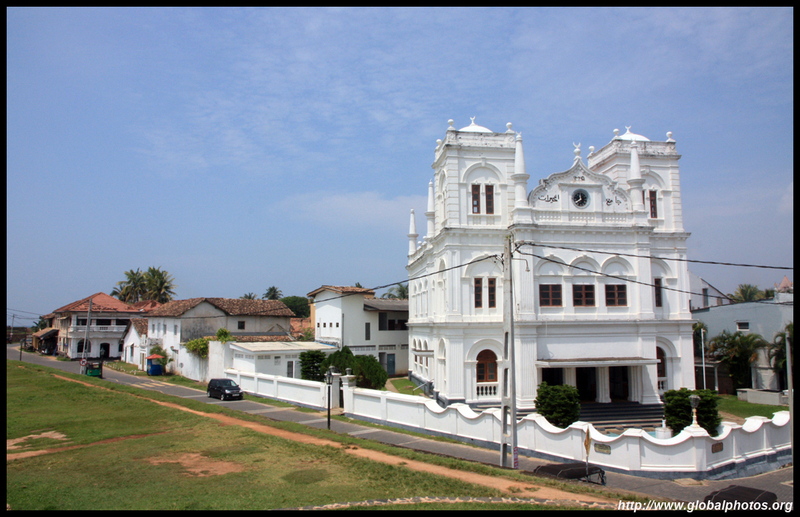 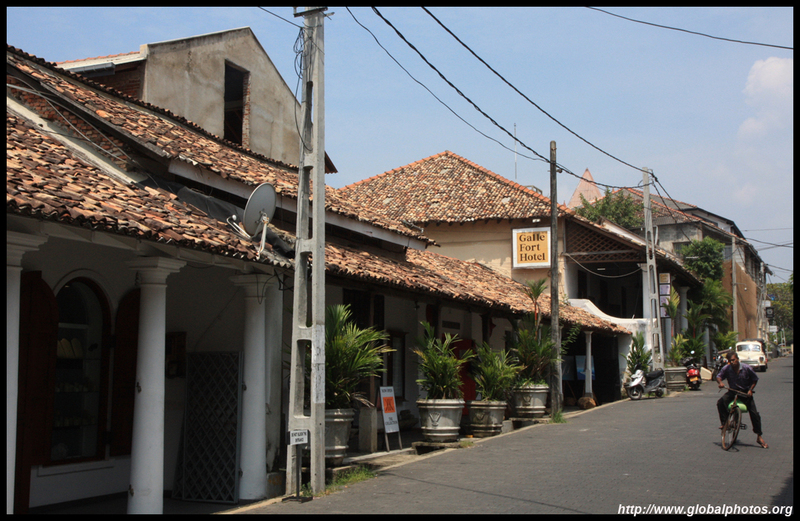 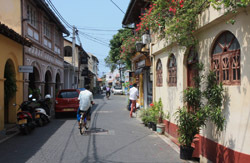 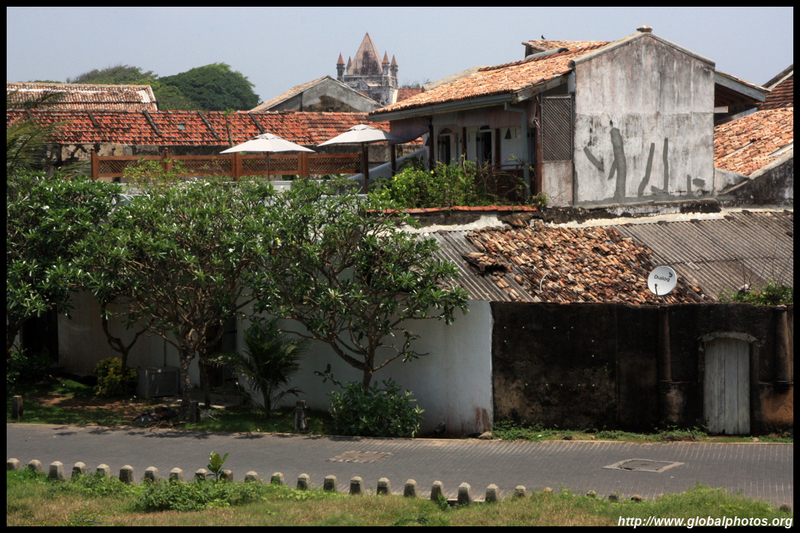 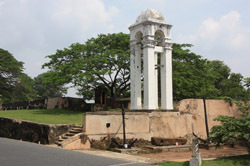 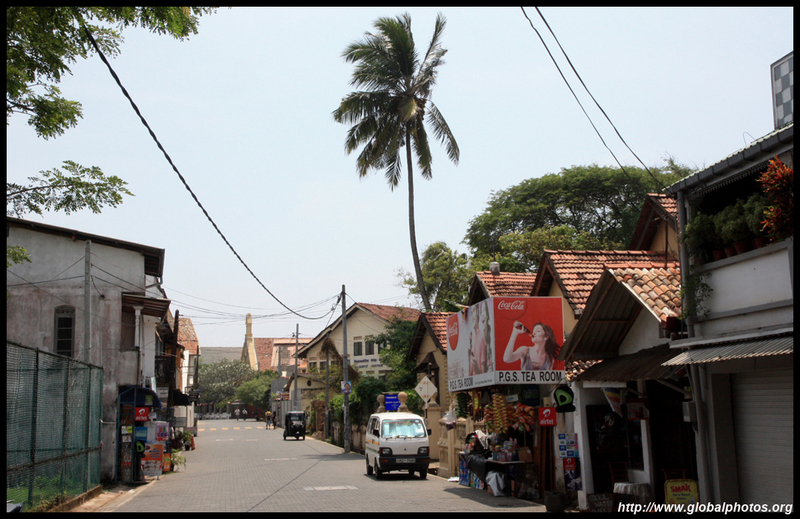 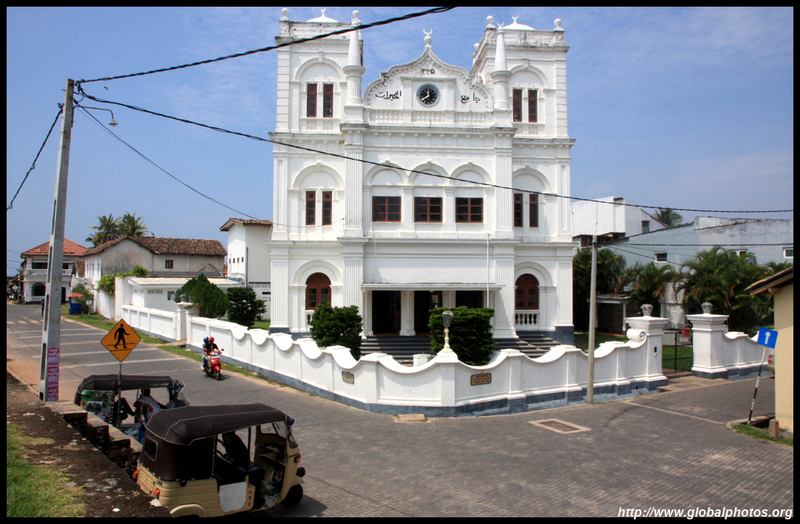 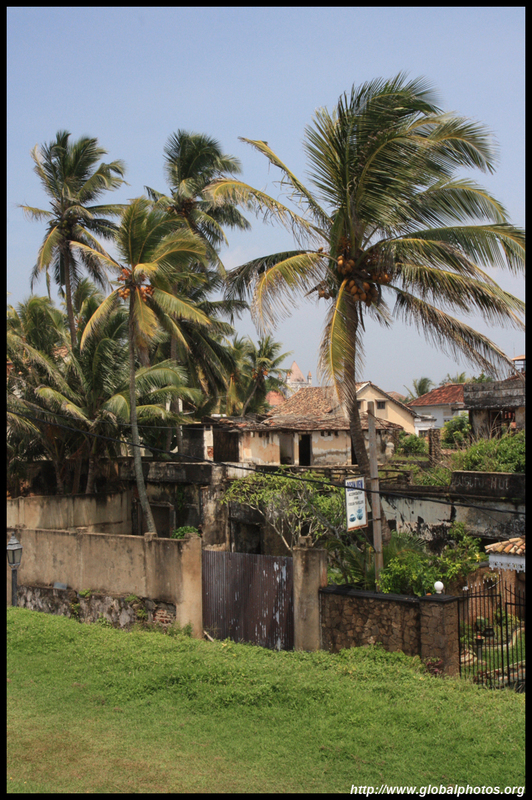 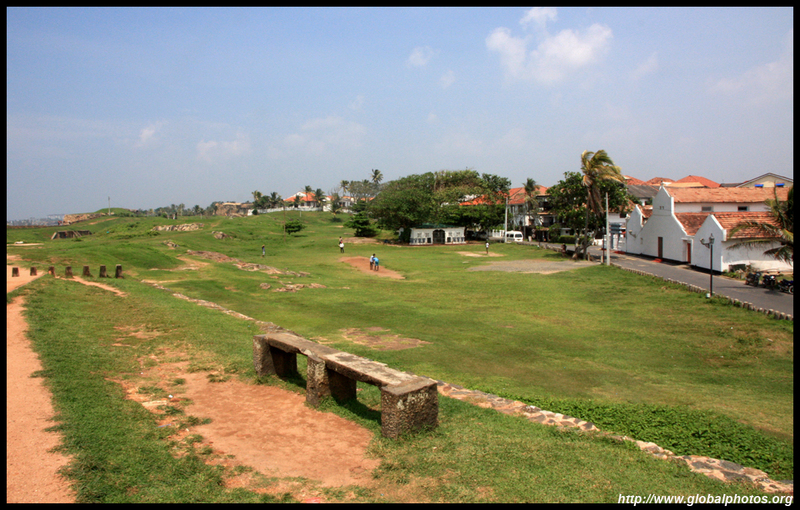 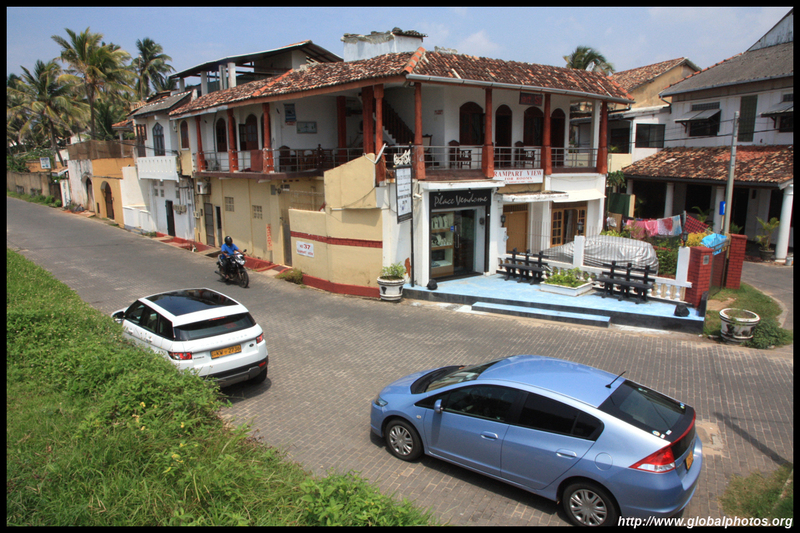 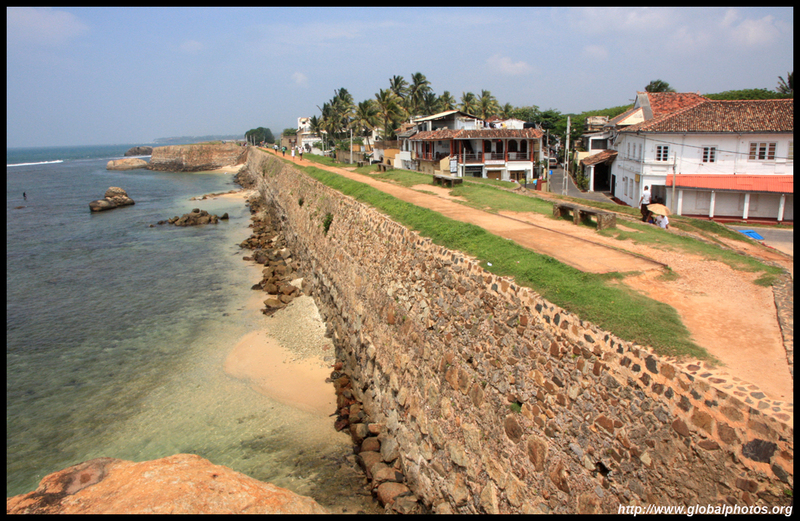 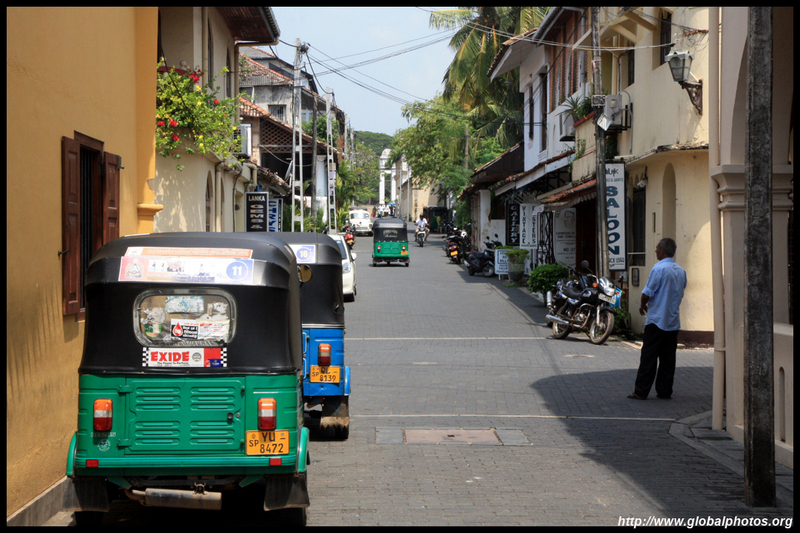 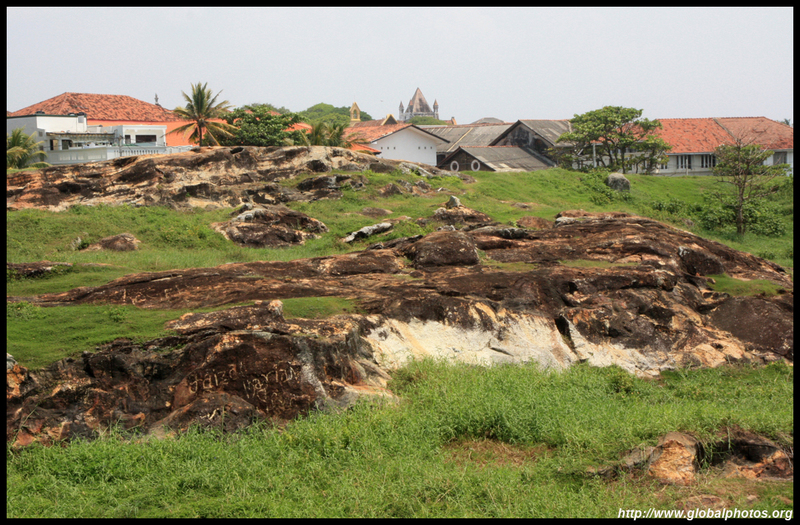 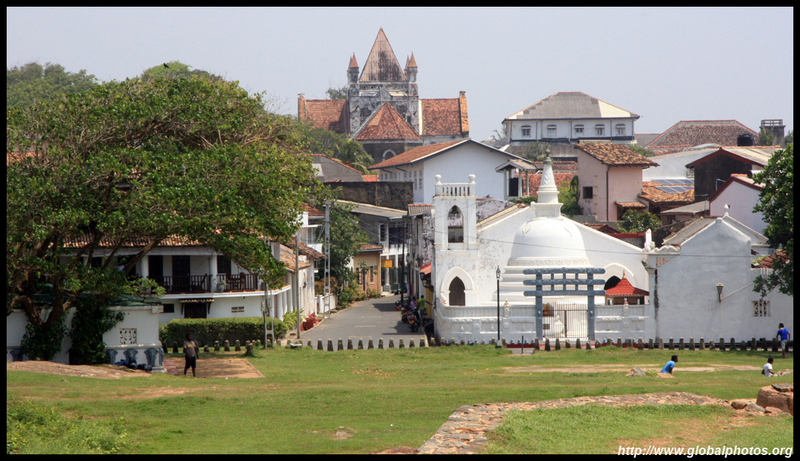 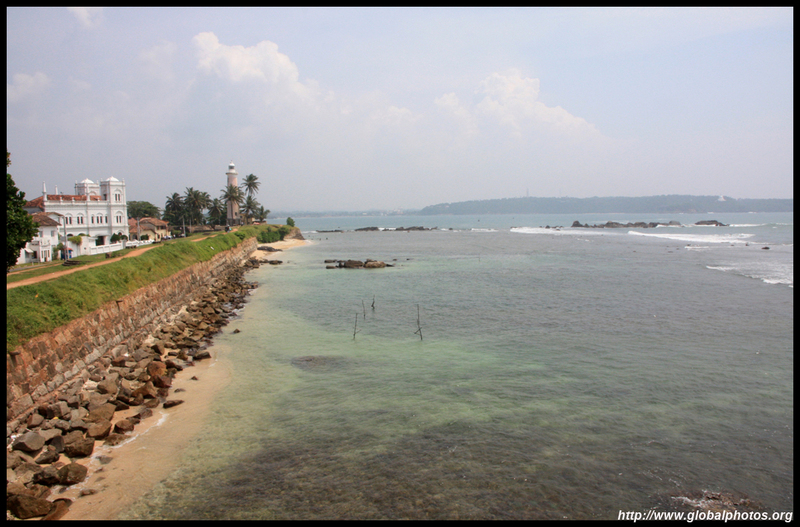 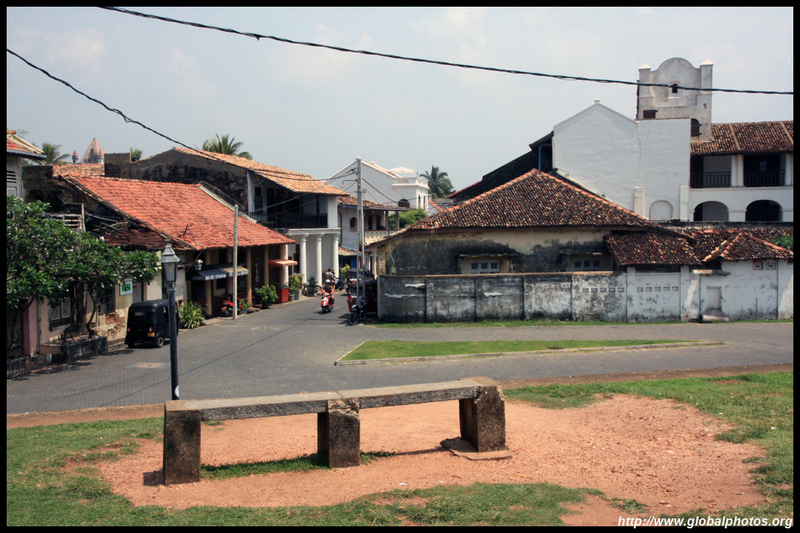 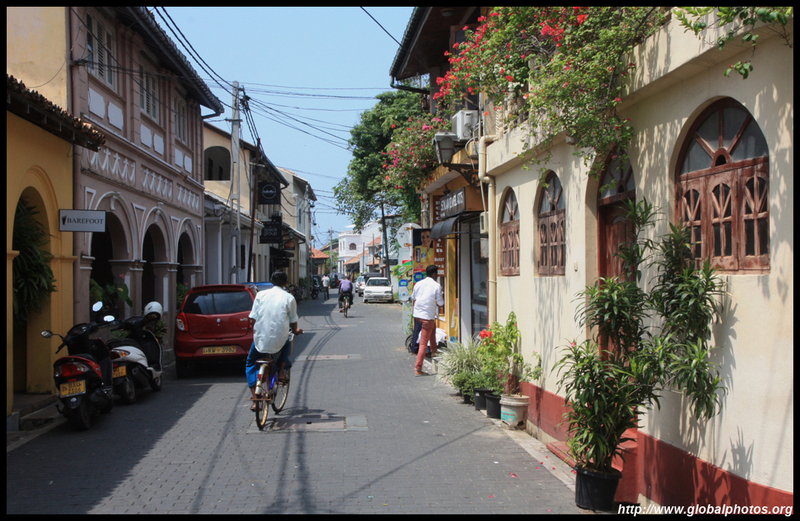 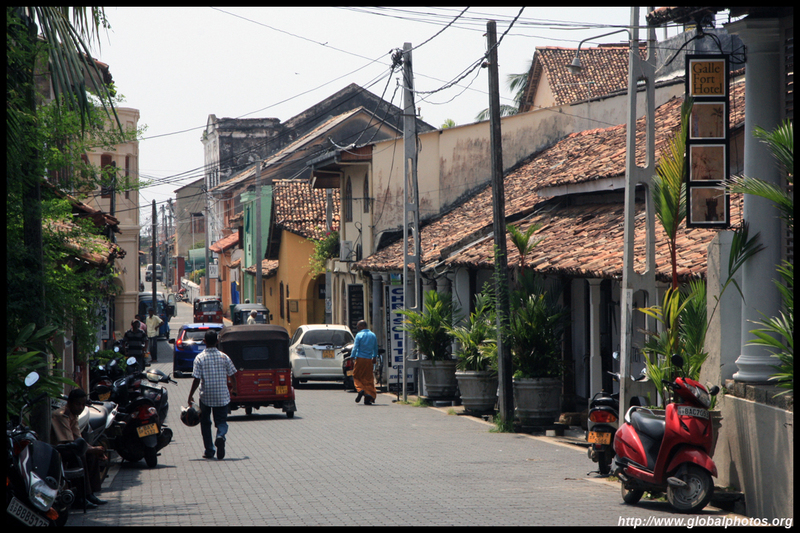 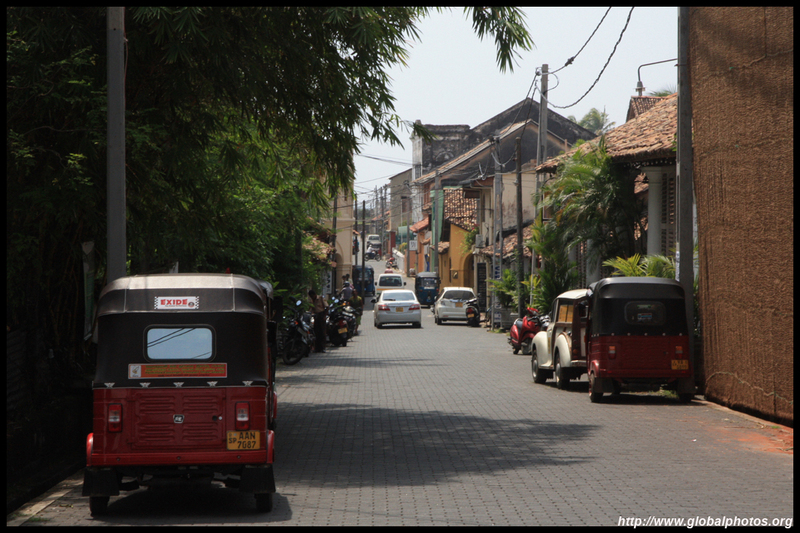 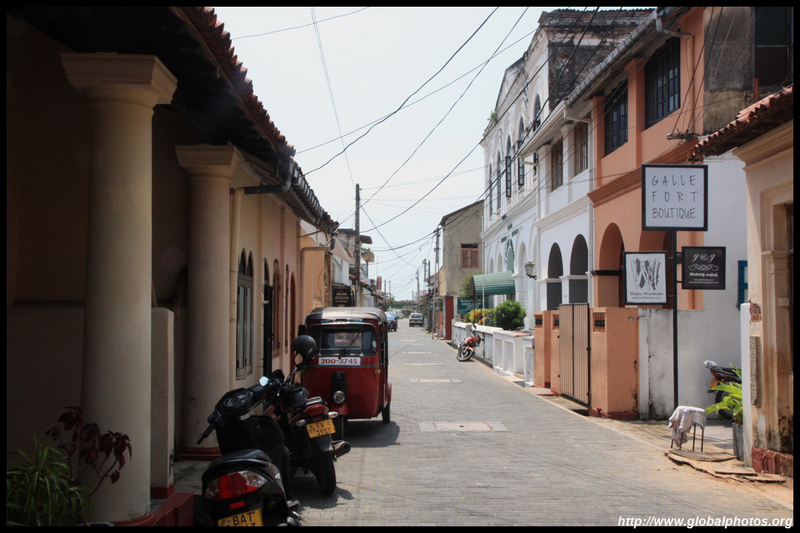 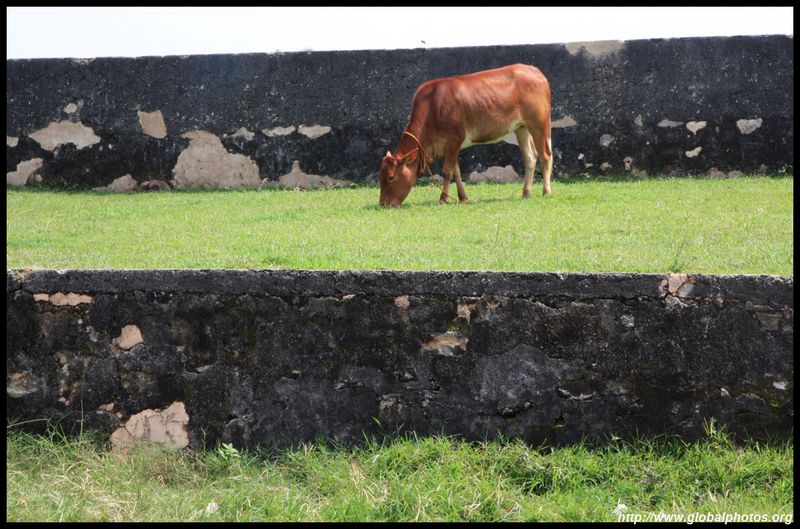 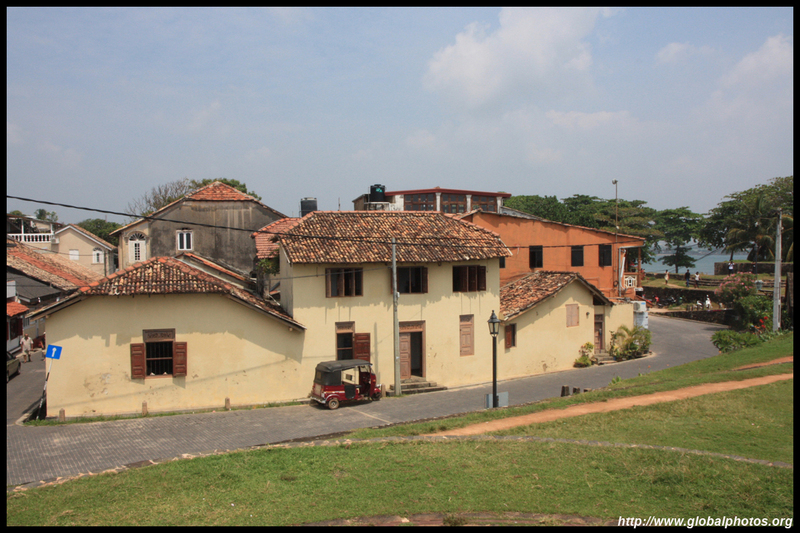 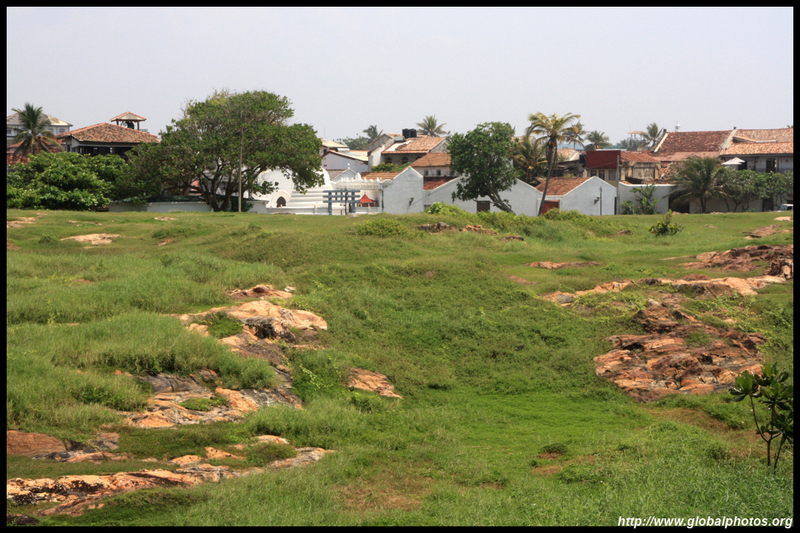 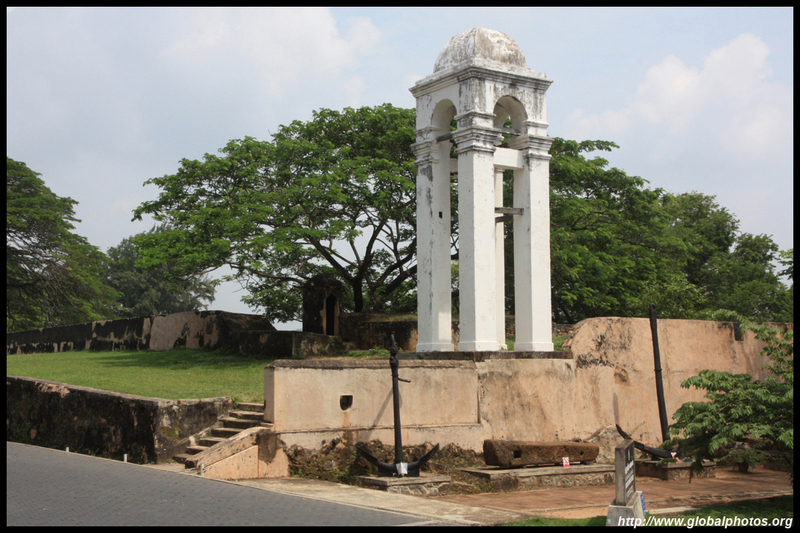 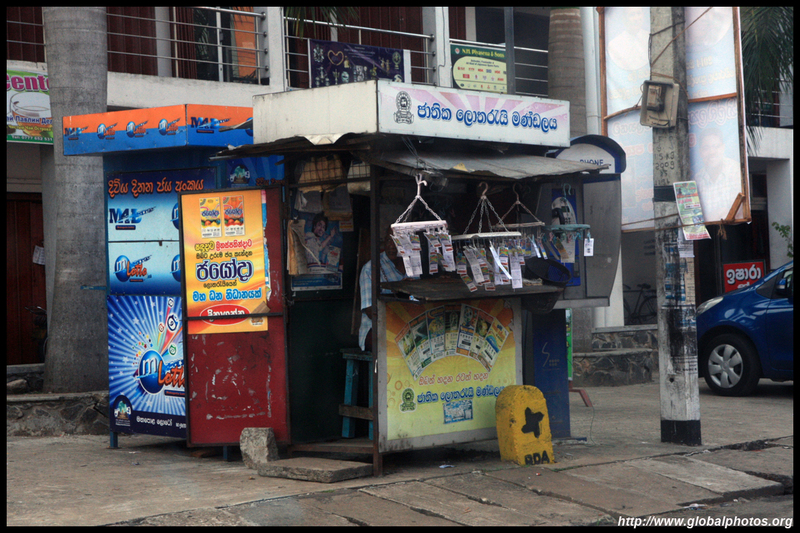 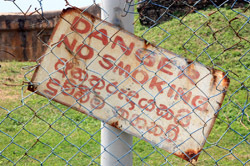 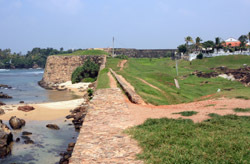 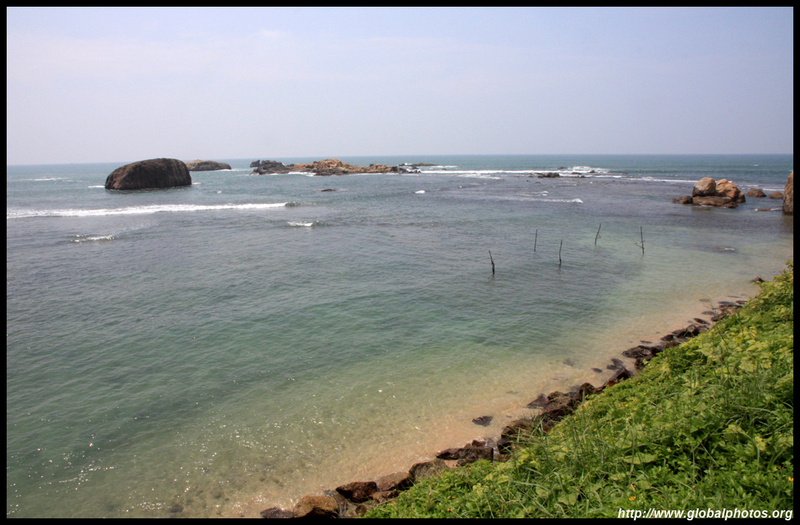 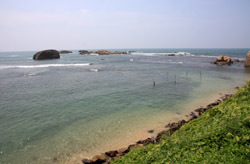 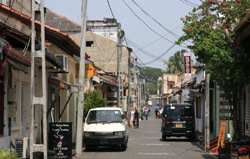 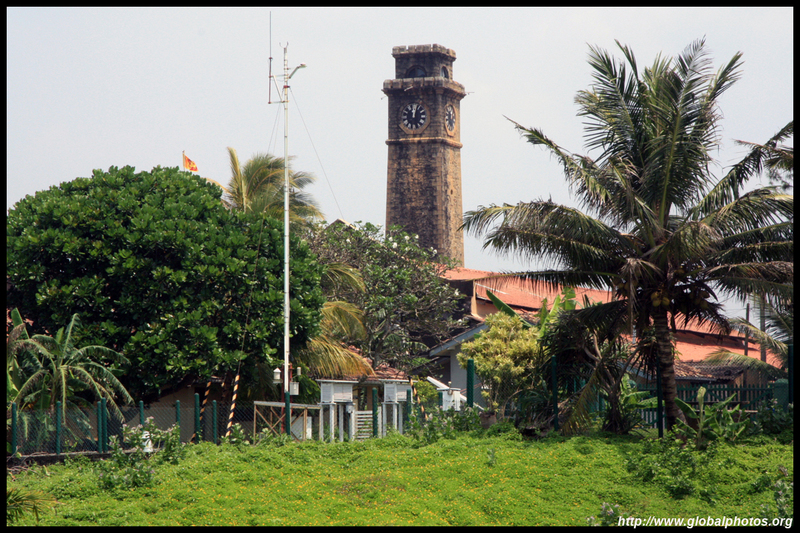 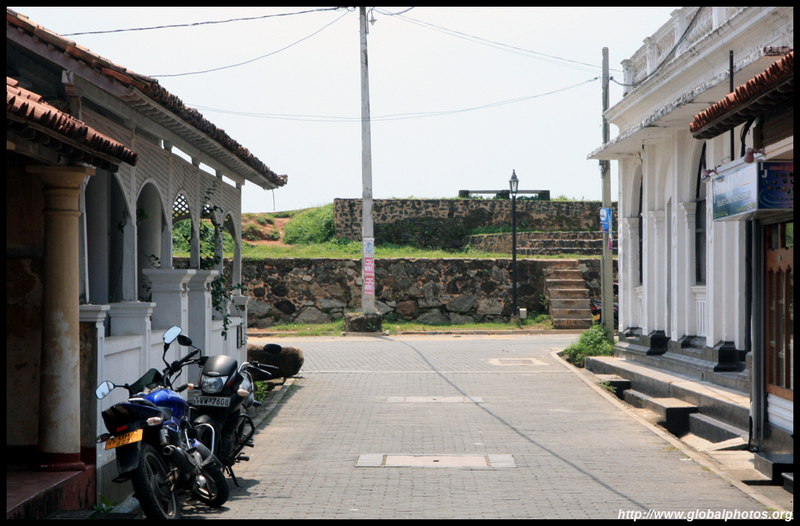 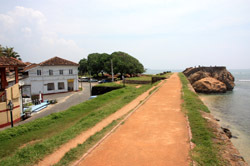 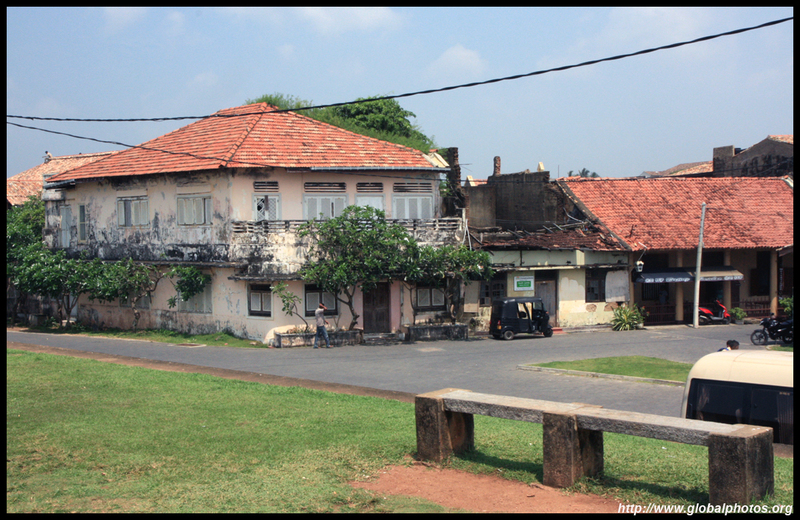 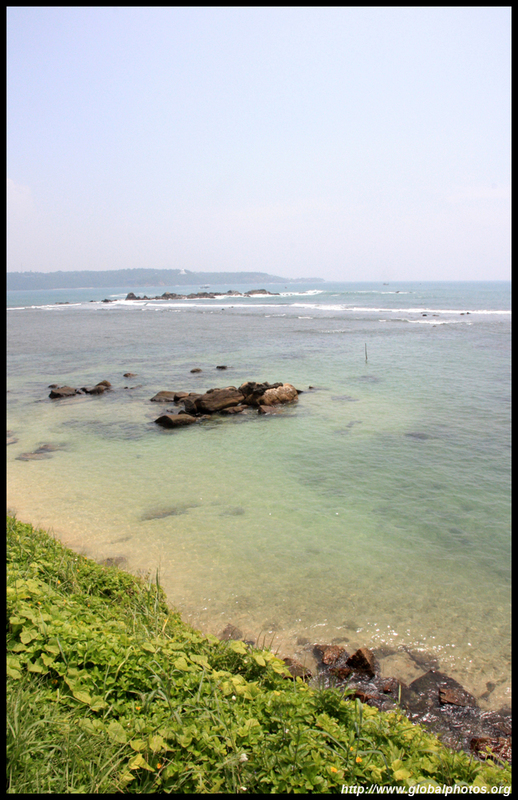 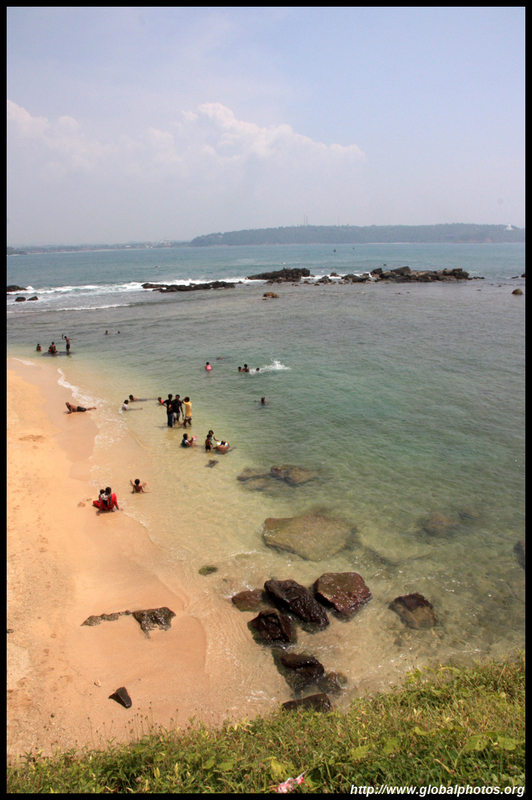 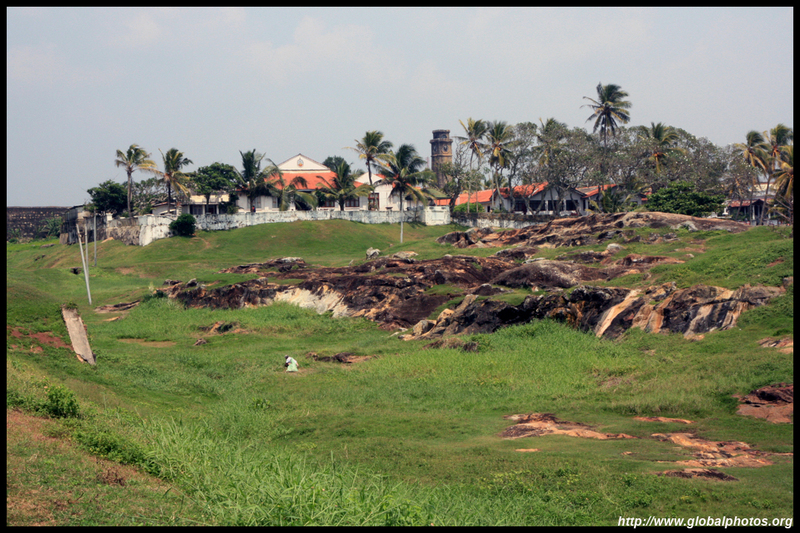 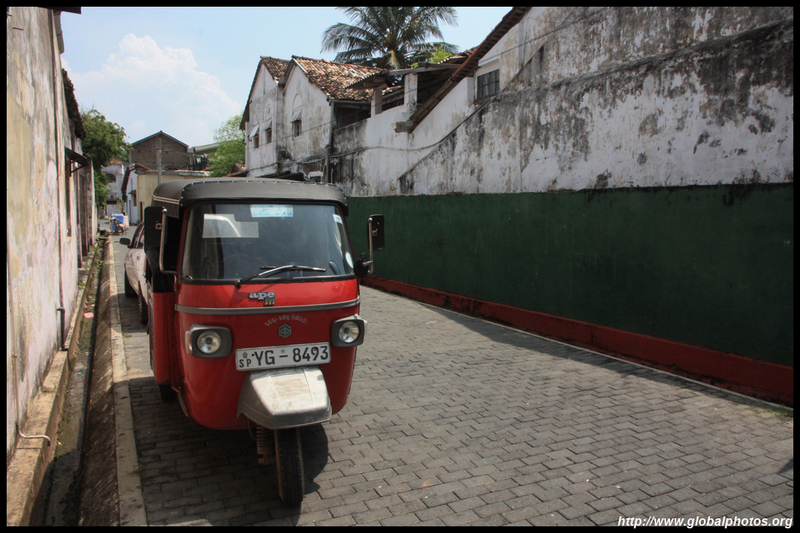 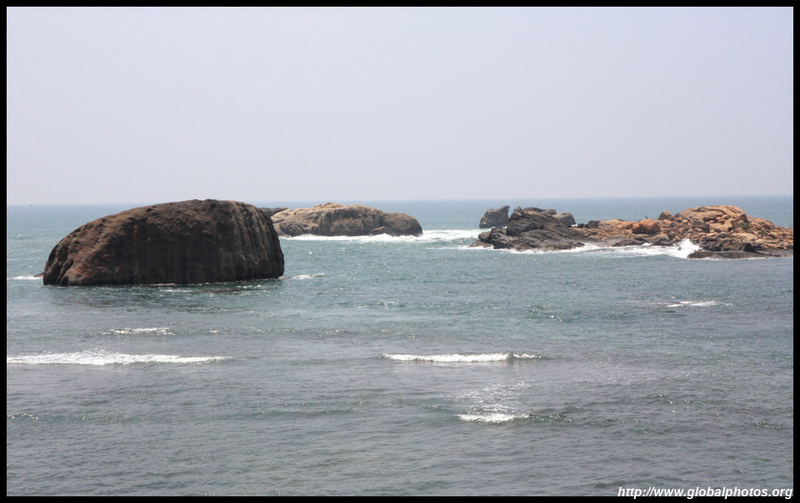 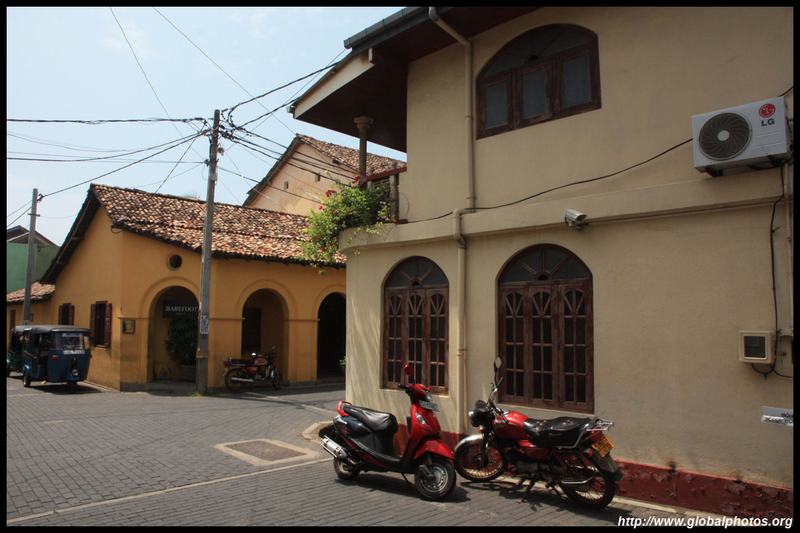 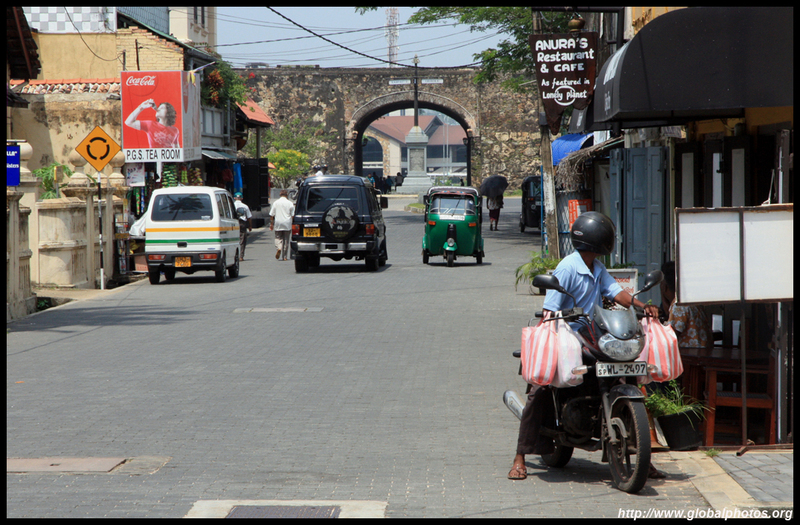 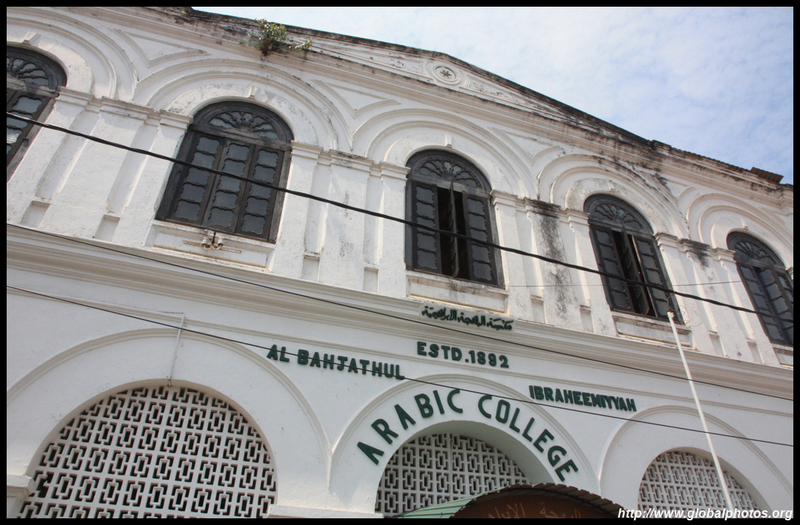 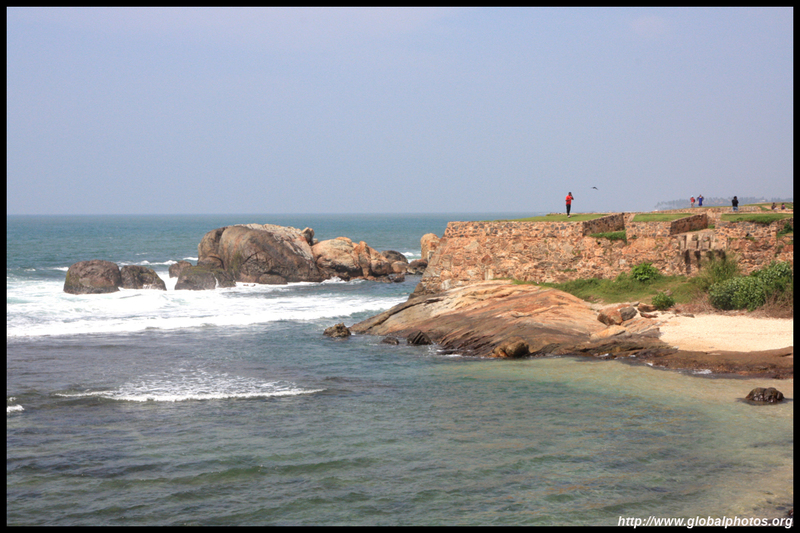 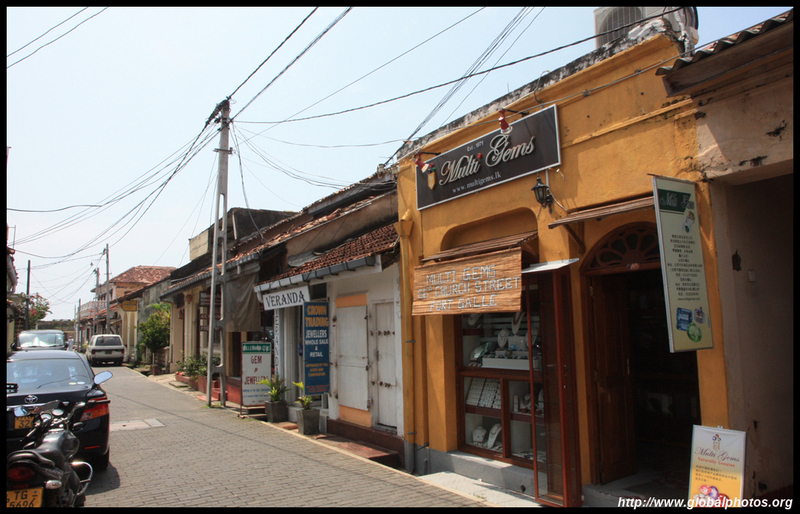 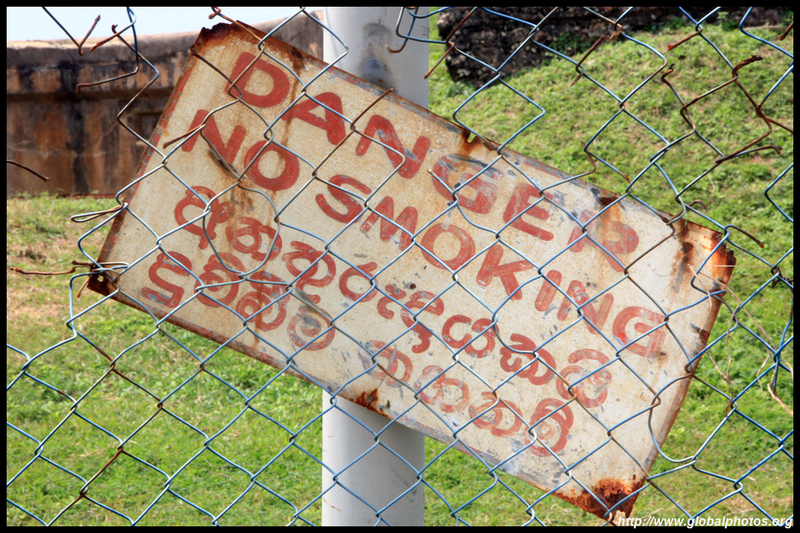 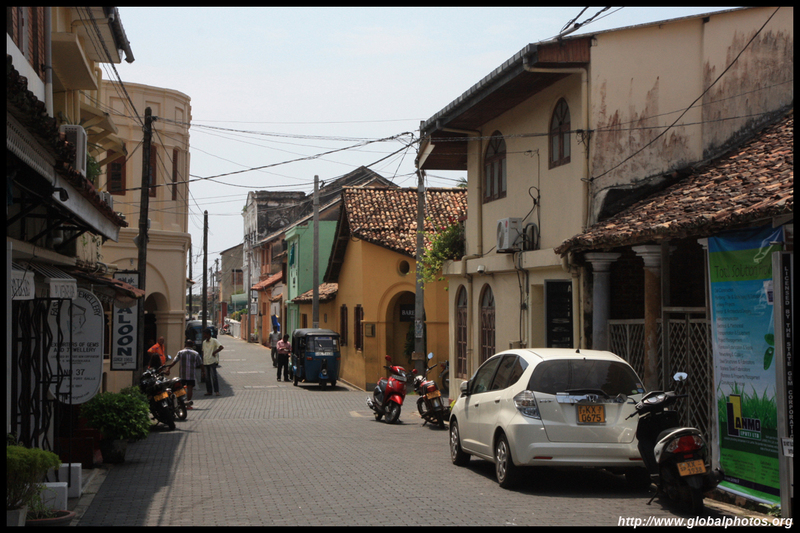 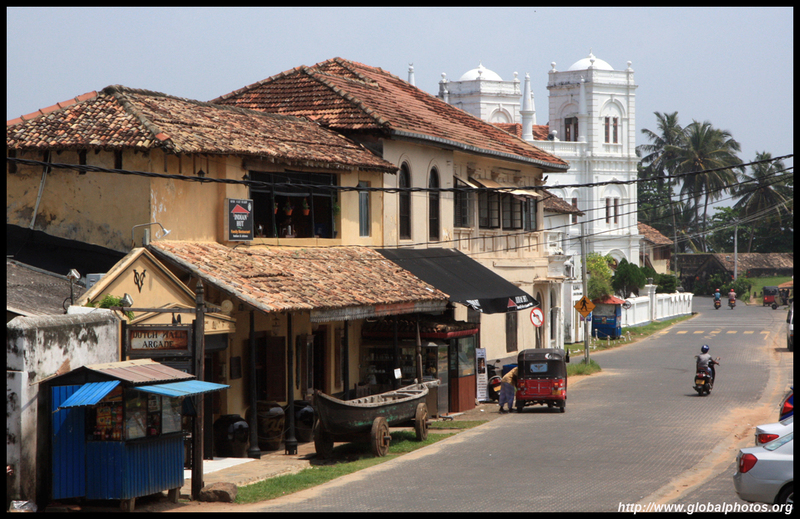 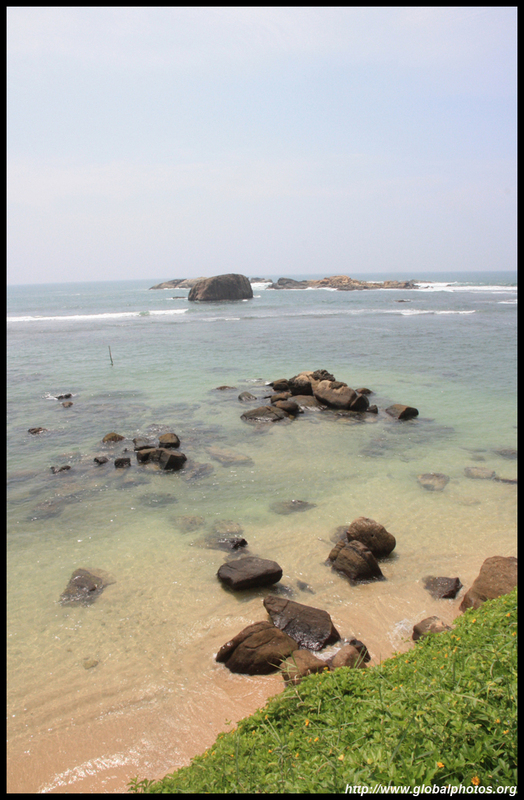 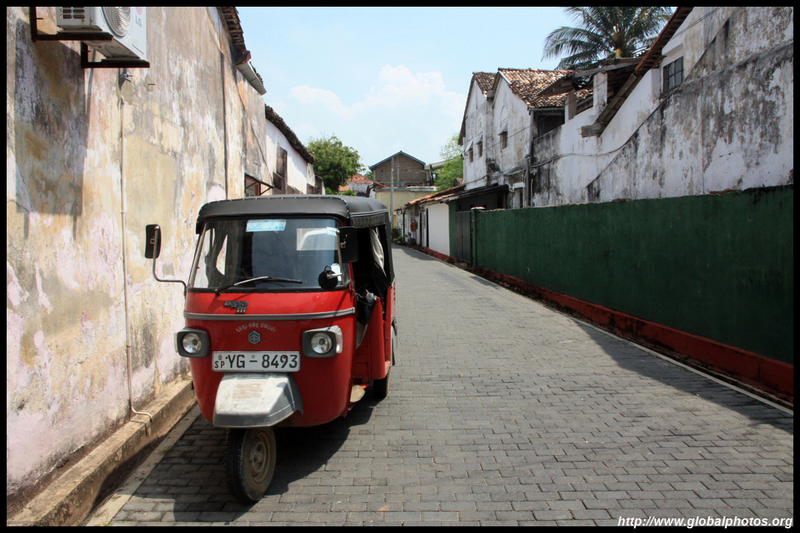 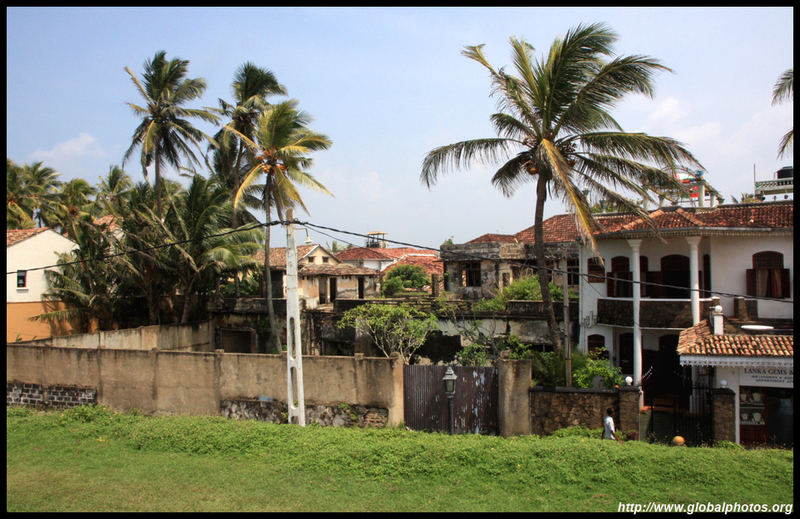 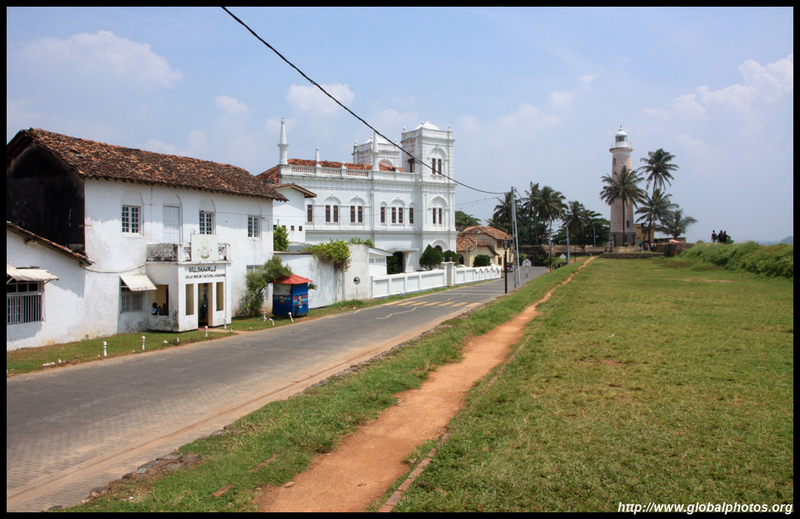 Galle is a preserved colonial town on the south coast of Sri Lanka. 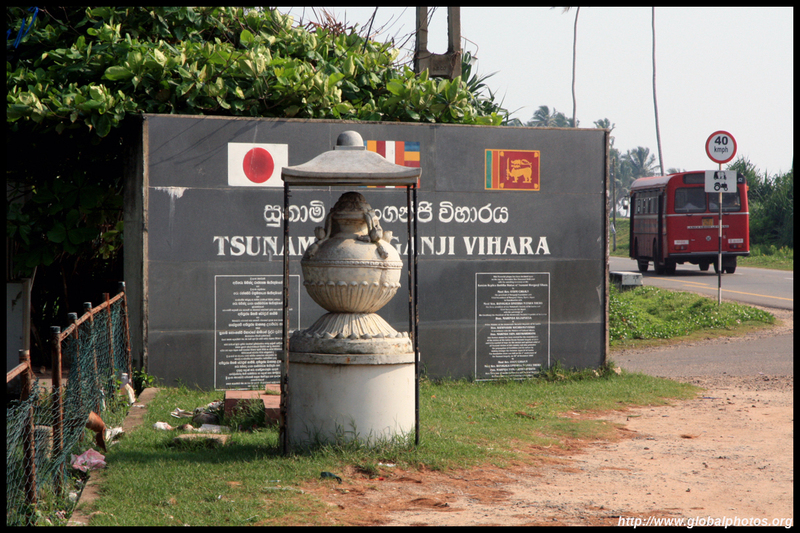 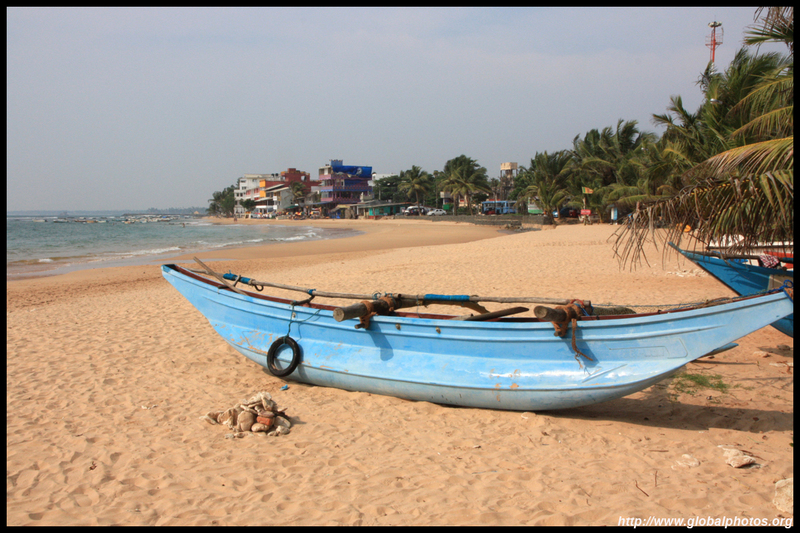 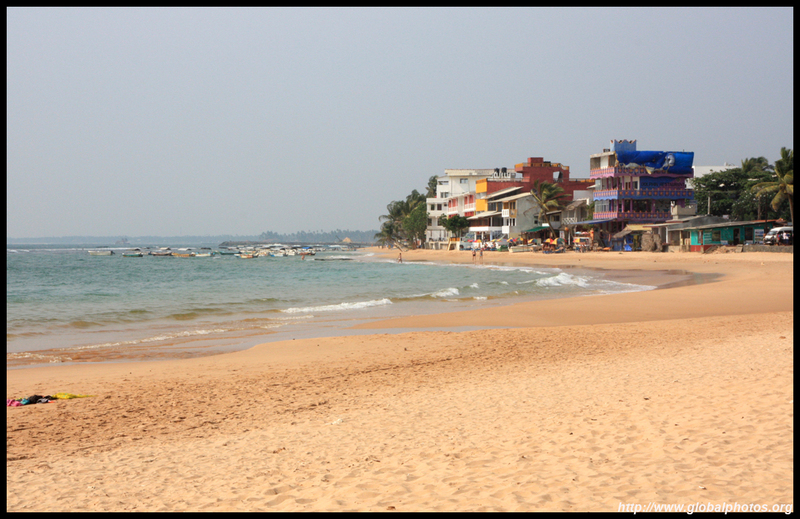 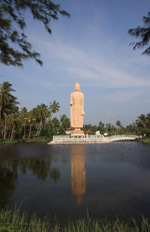 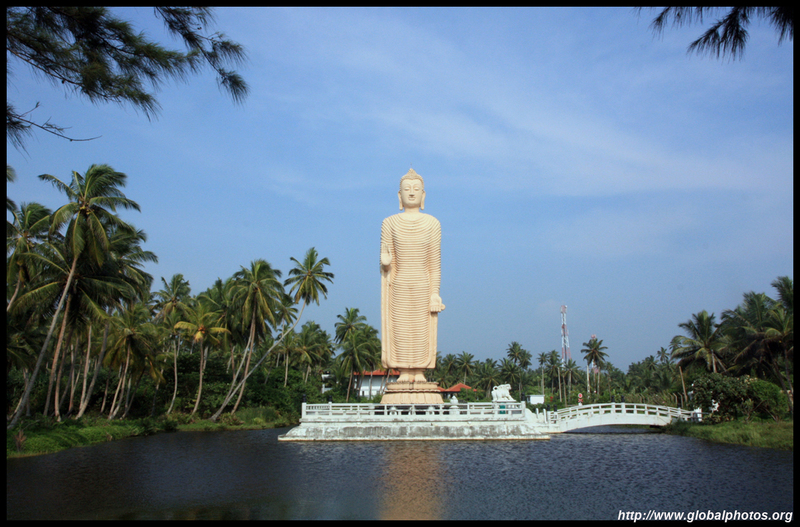 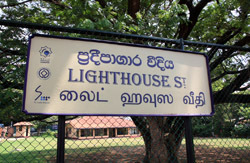 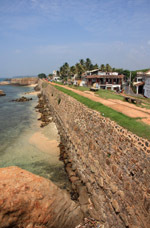 Accessible by a good highway from Colombo's outskirts, this part of the country is a good day trip option. 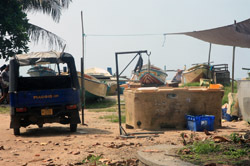 Fishing is an important part of this area's economy. 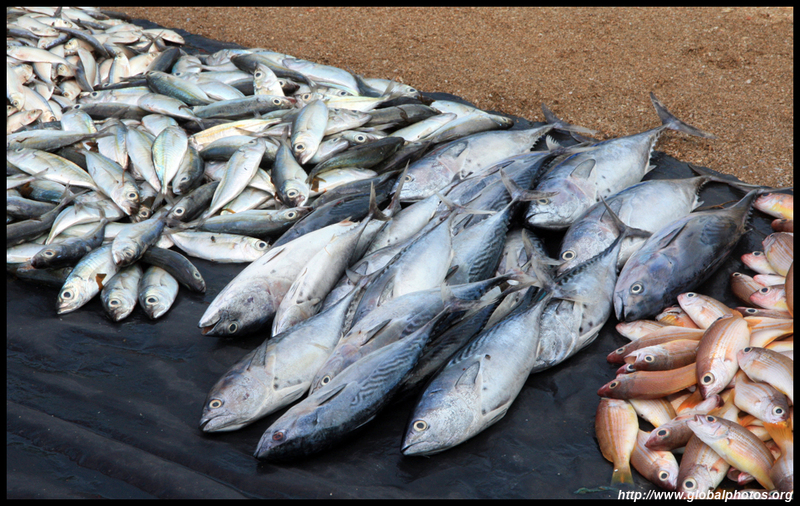 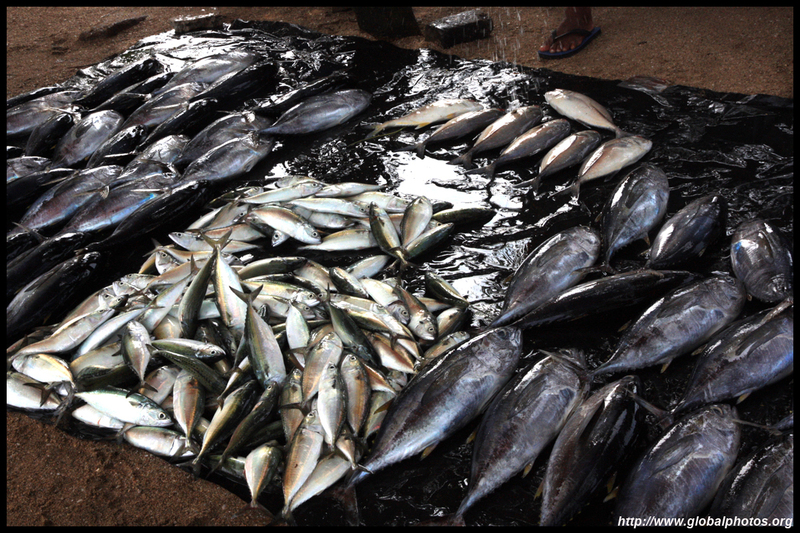 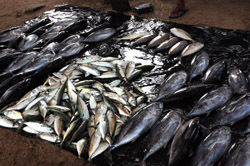 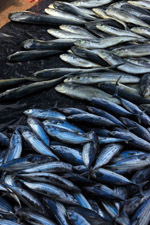 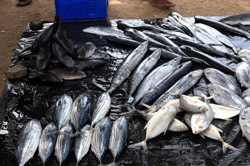 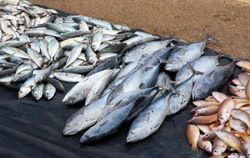 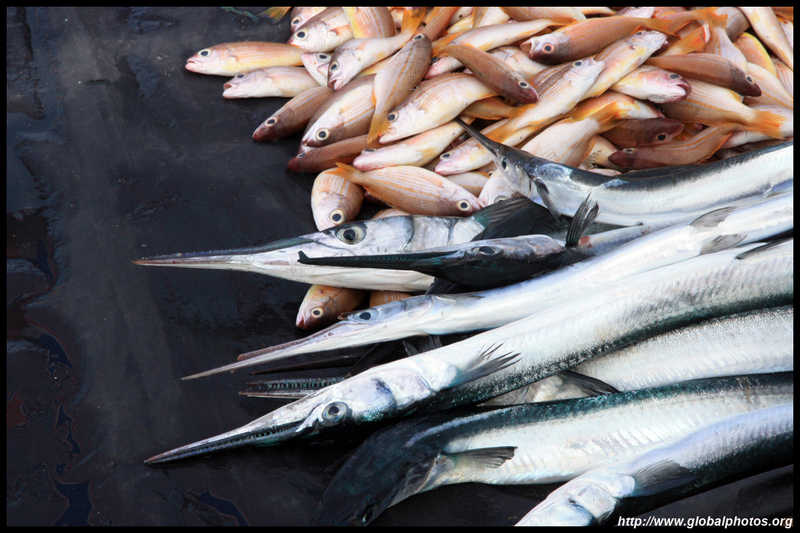 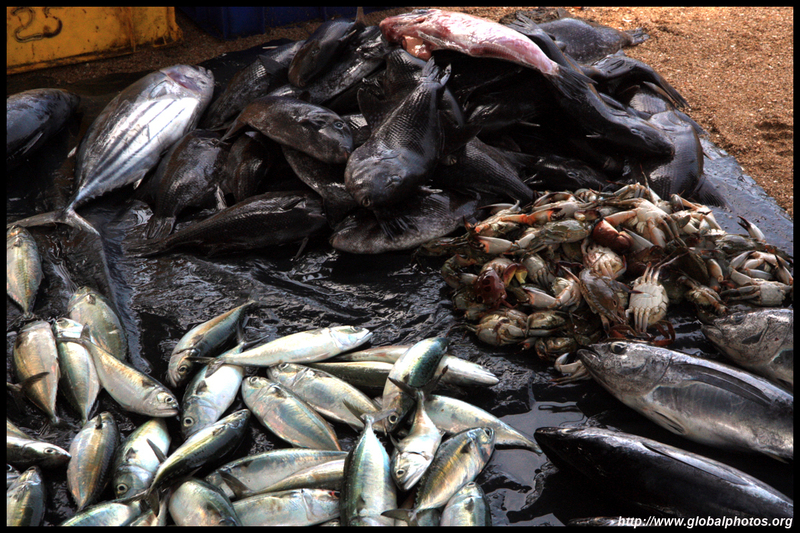 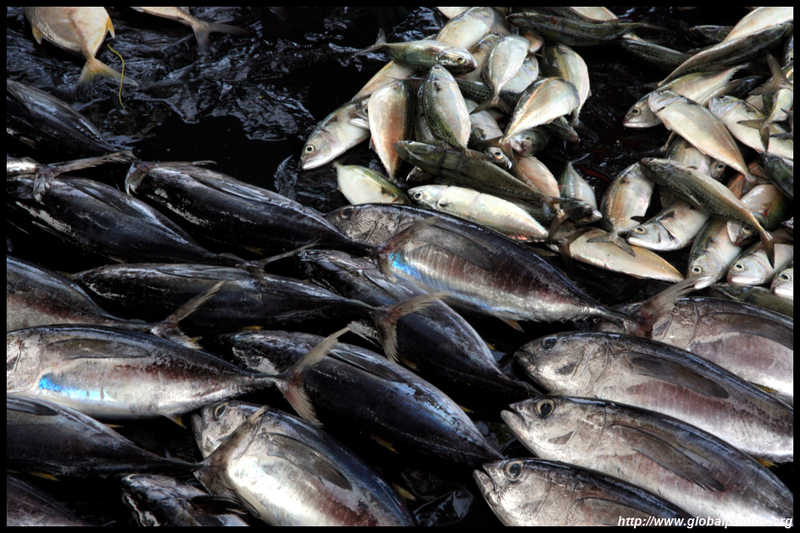 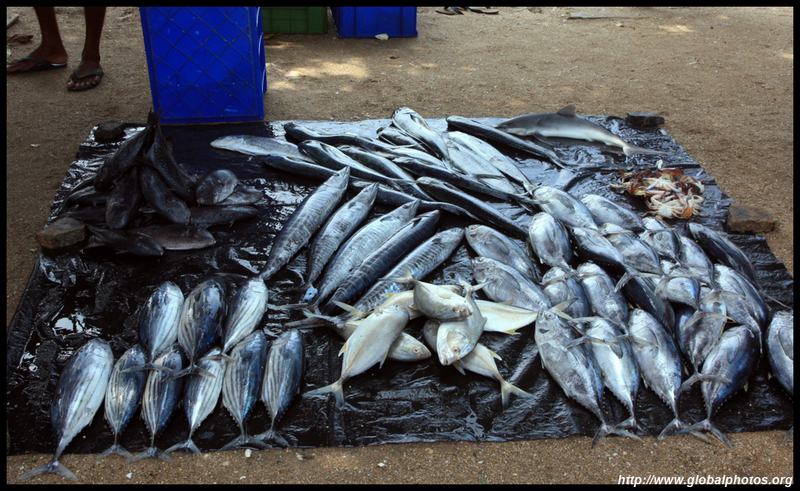 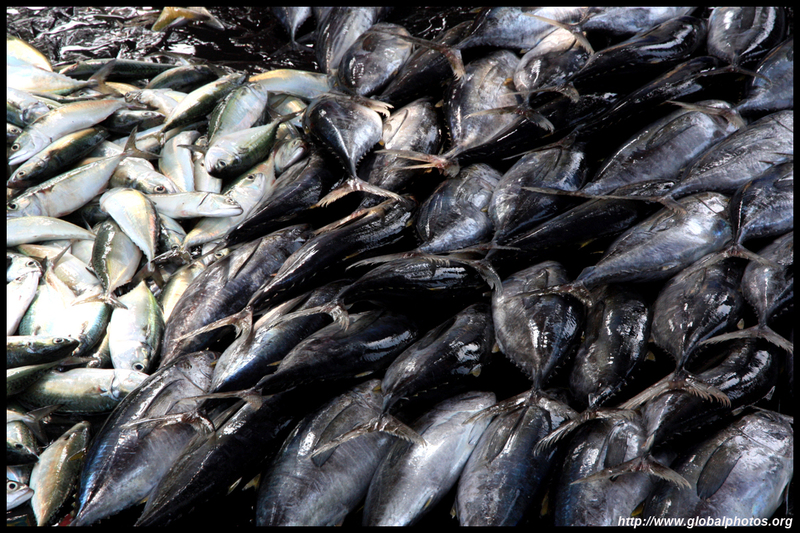 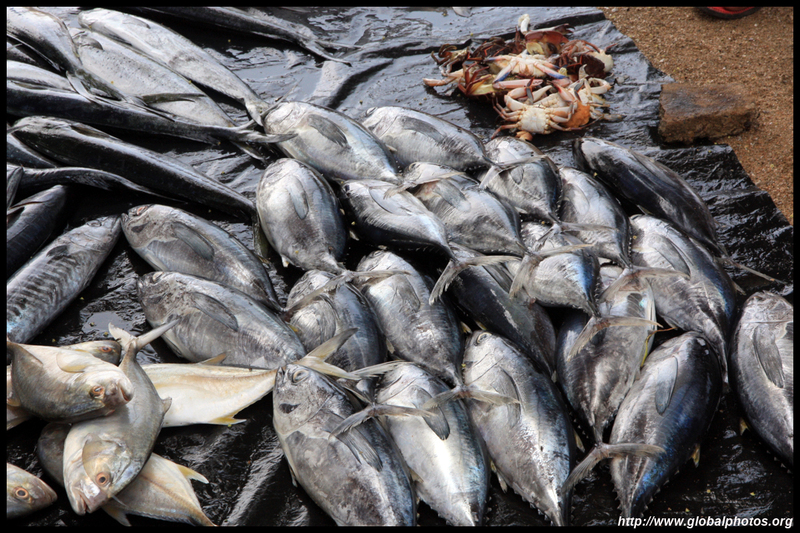 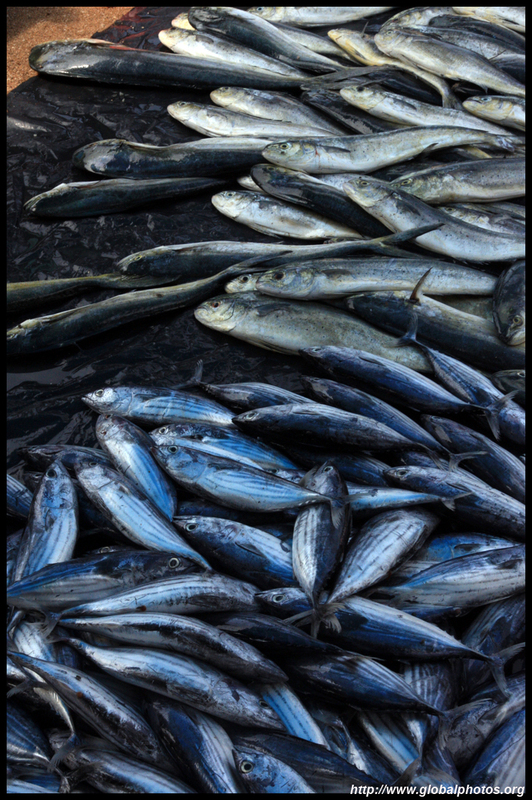 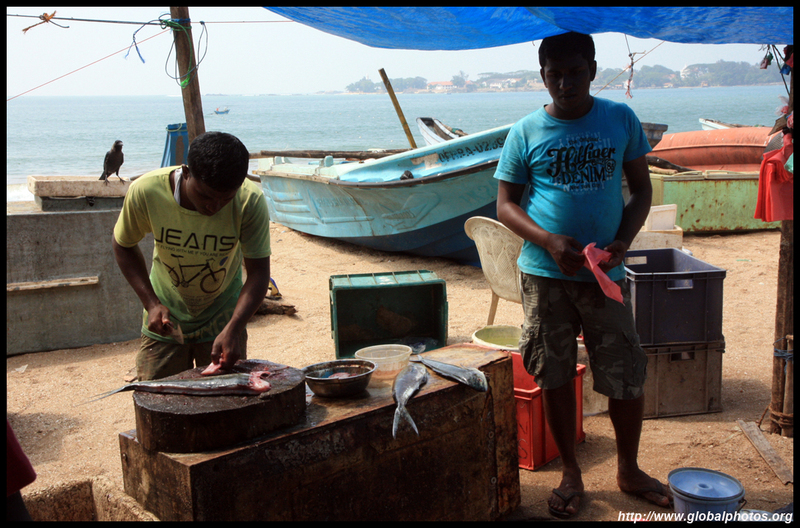 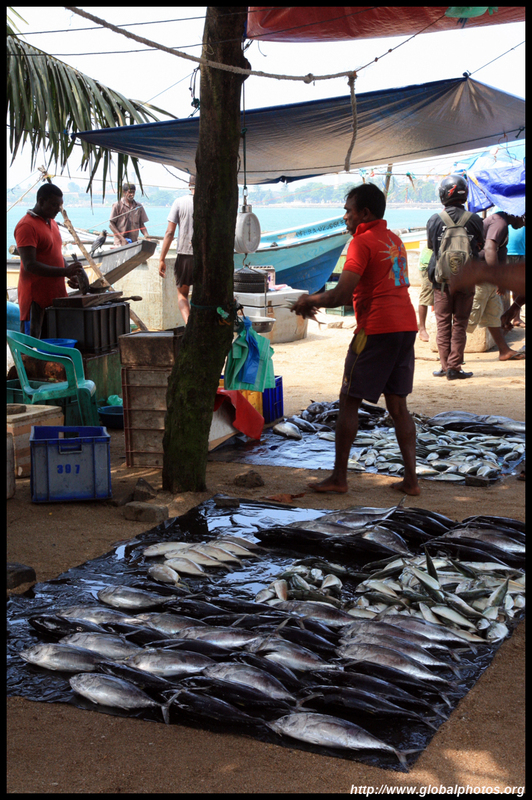 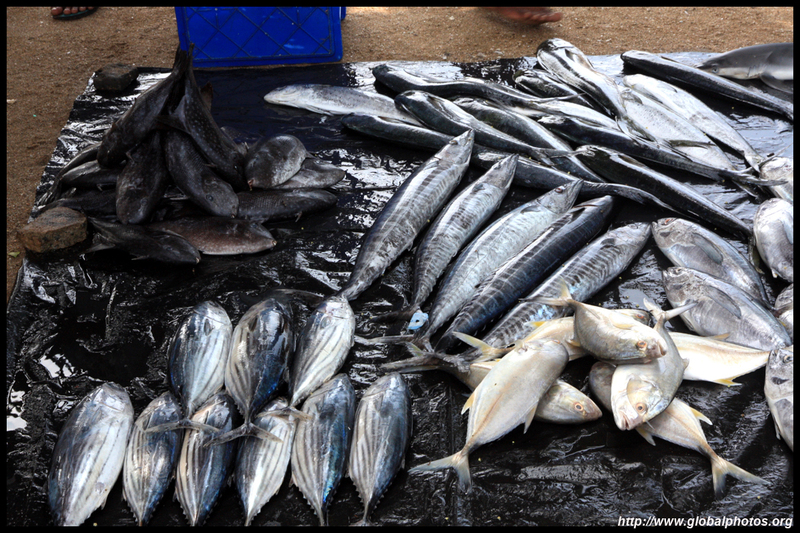 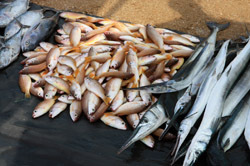 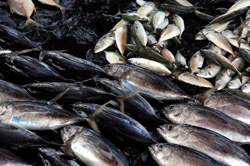 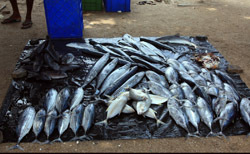 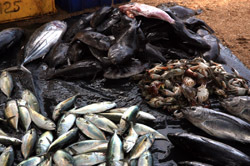 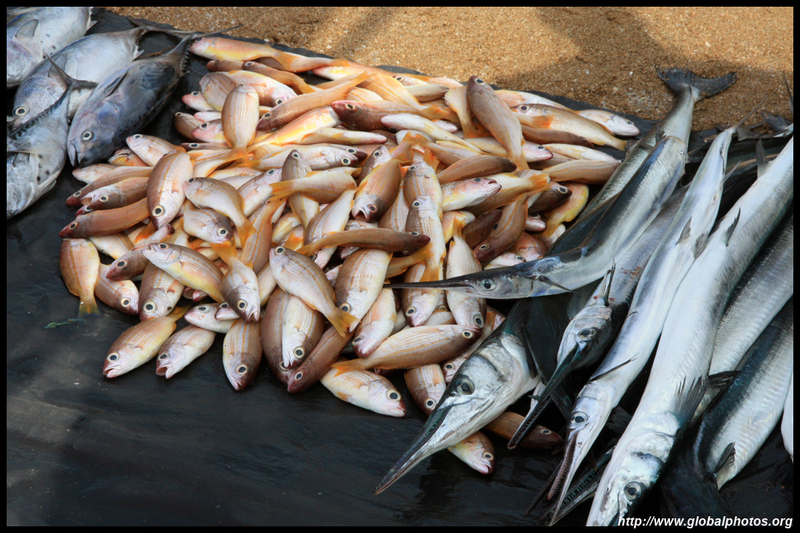 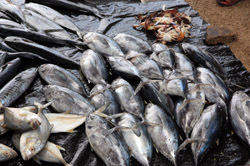 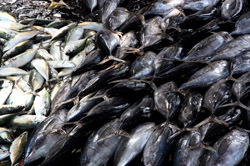 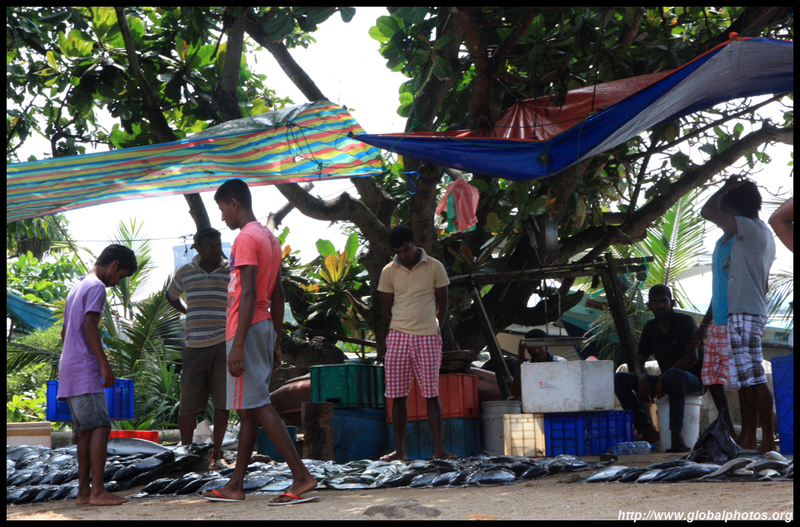 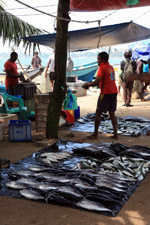 No refridgeration is needed for the fresh fish on display just outside the historic old fort. 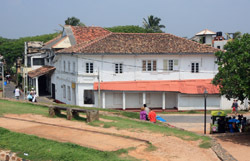 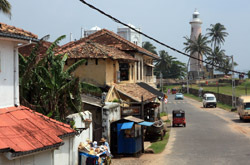 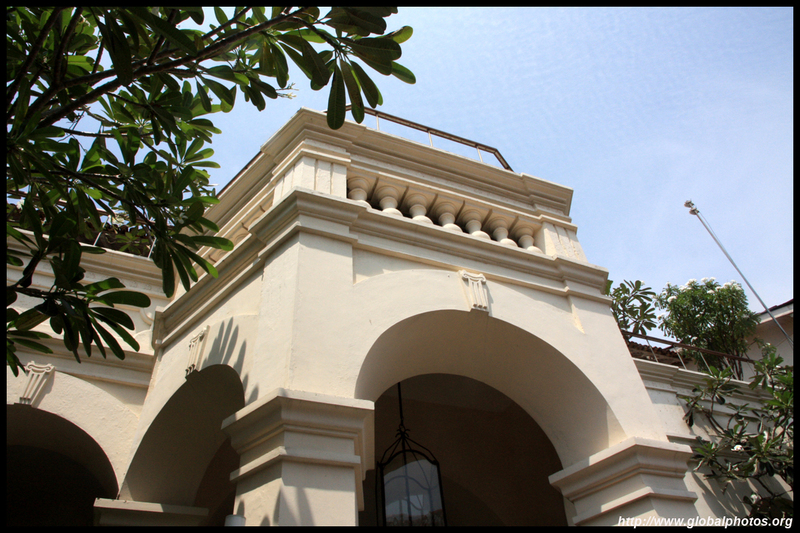 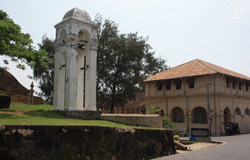 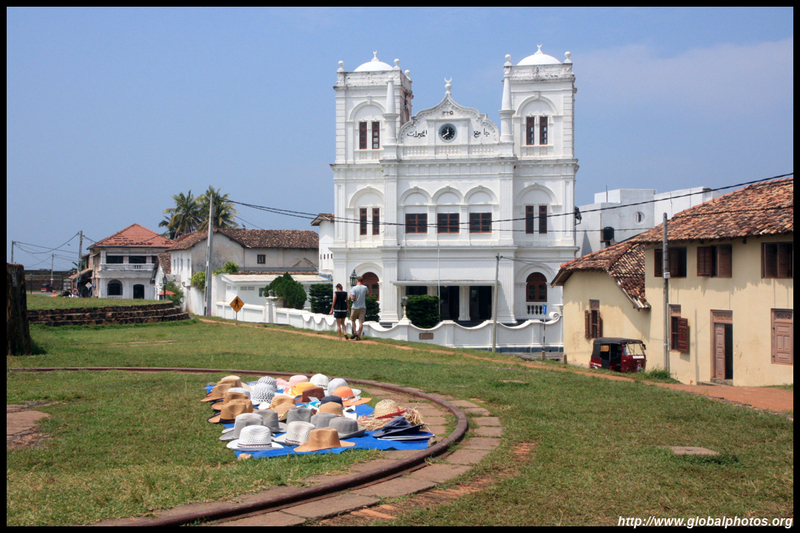 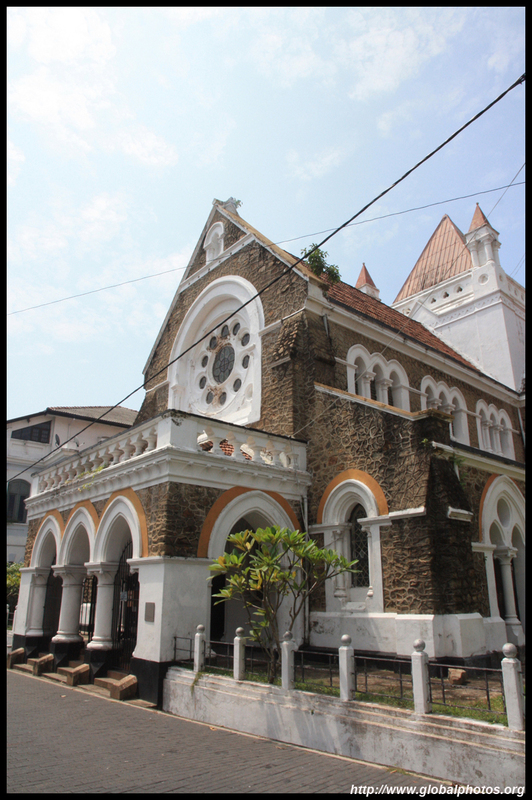 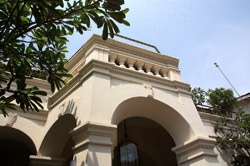 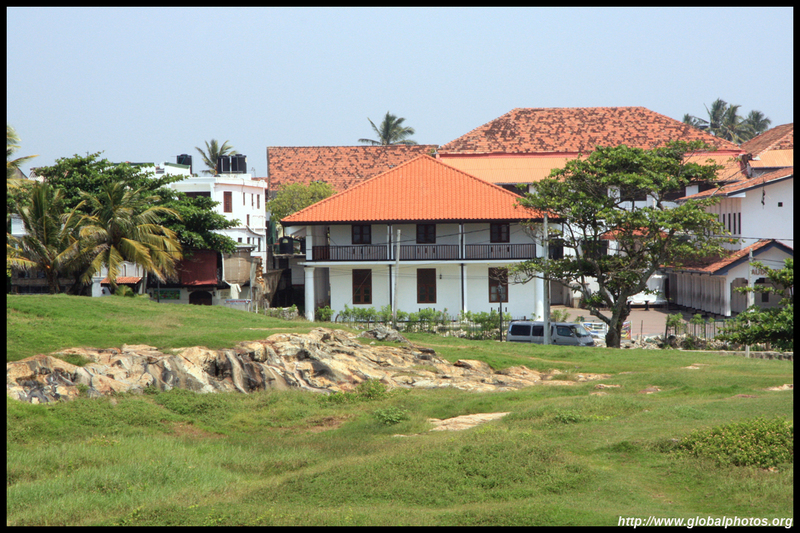 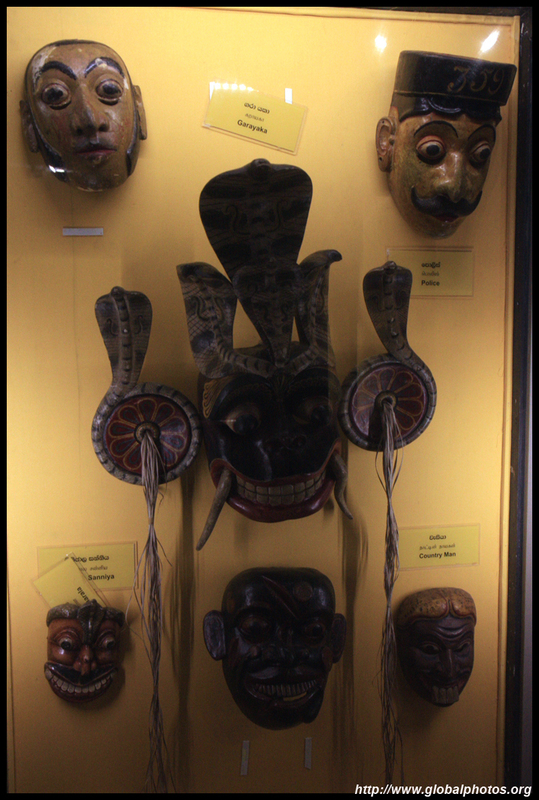 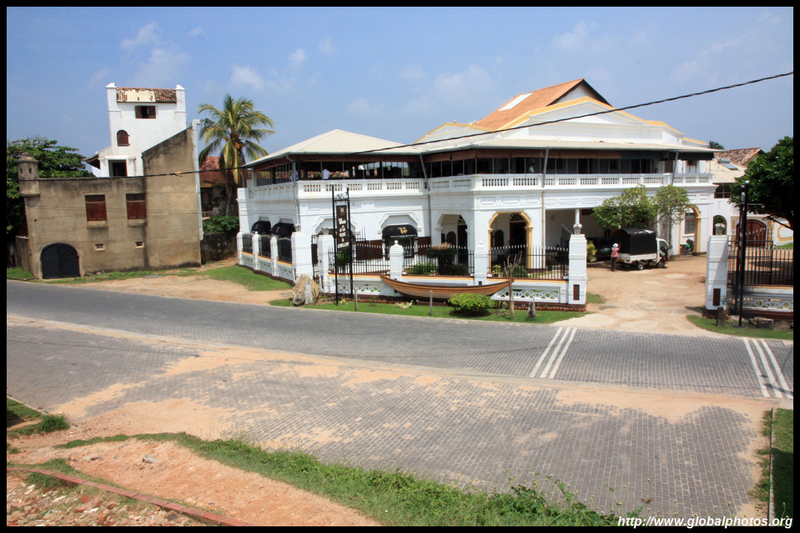 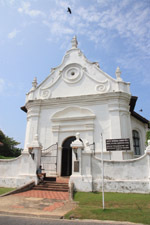 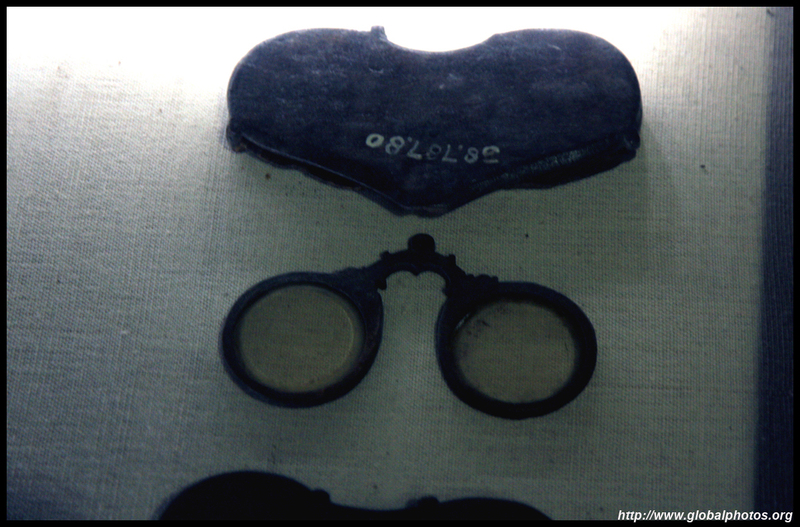 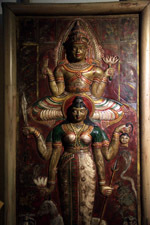 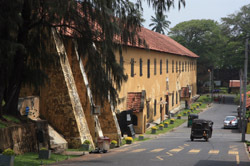 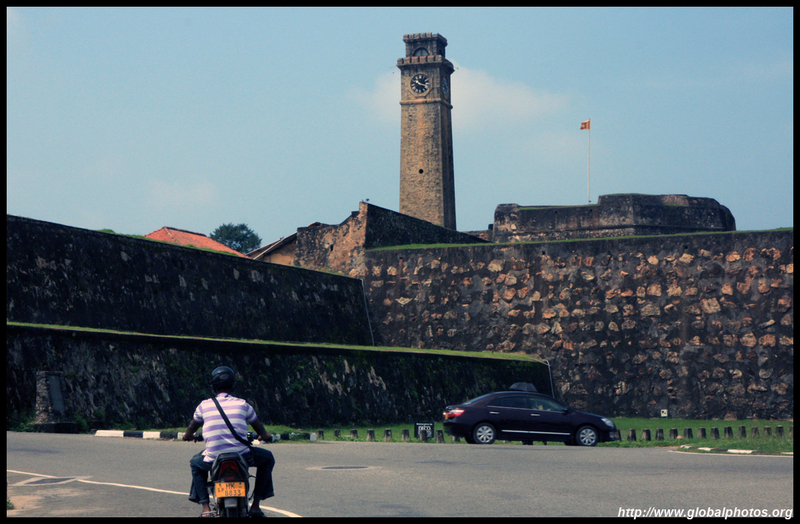 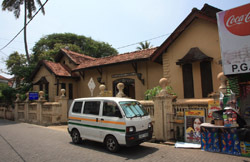 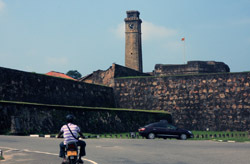 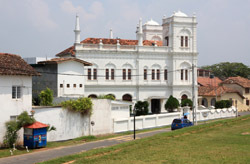 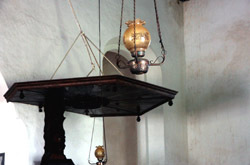 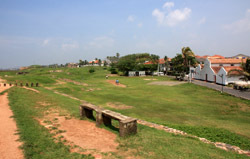 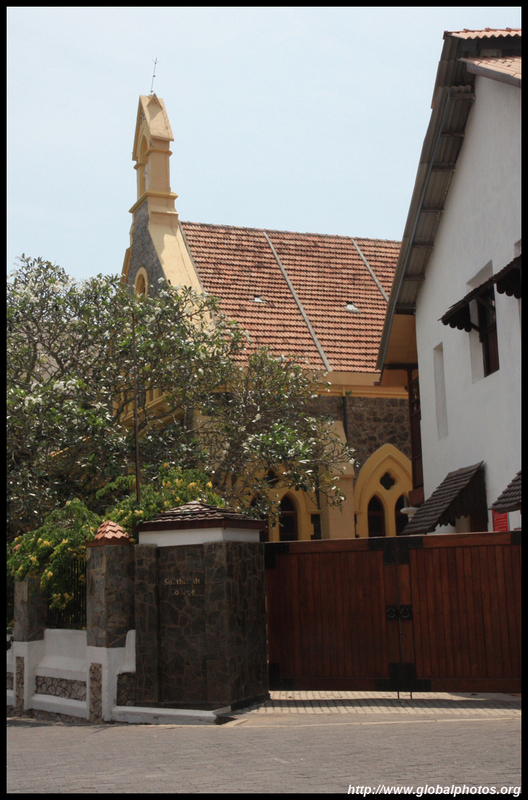 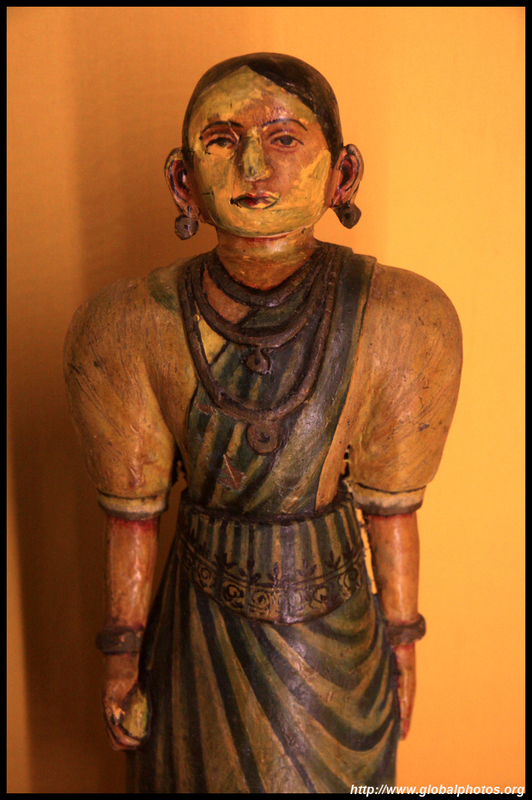 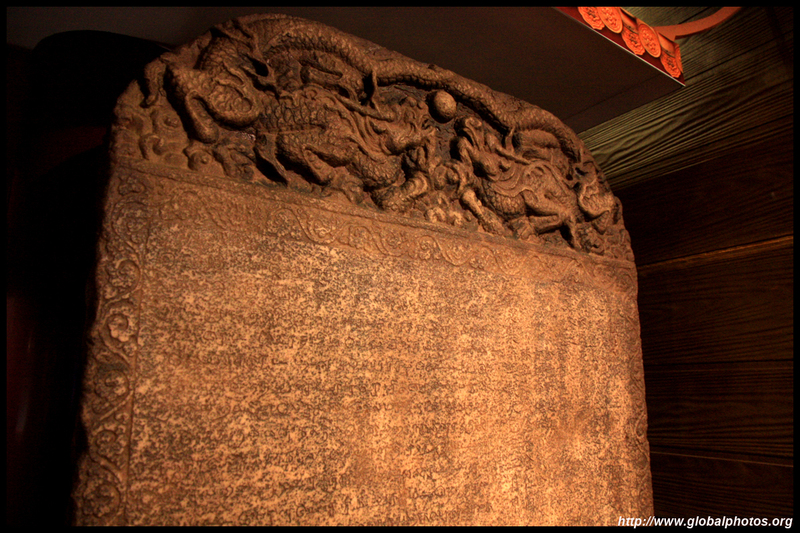 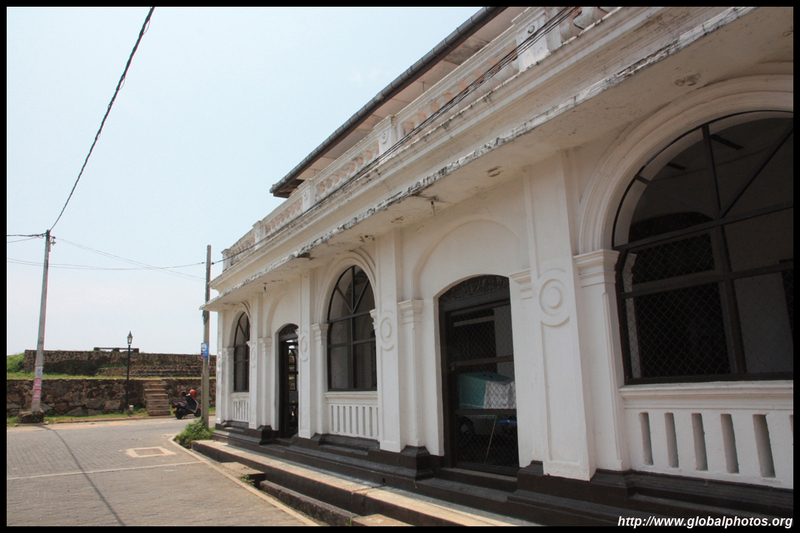 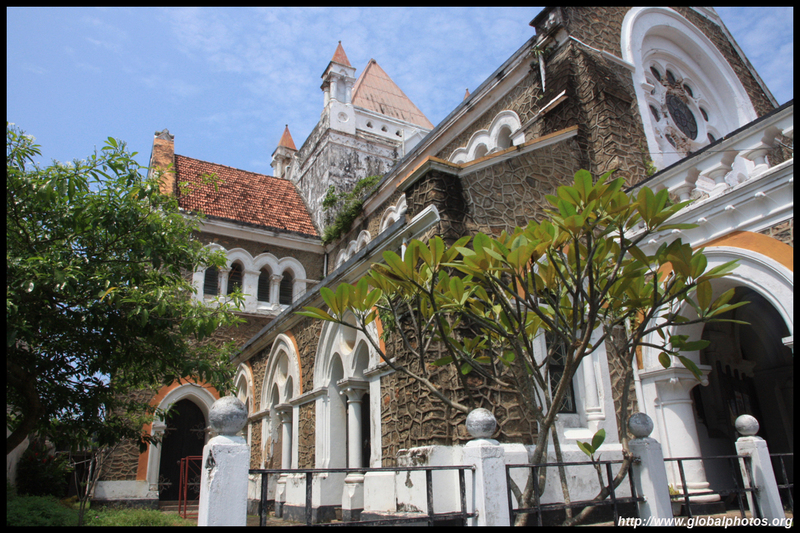 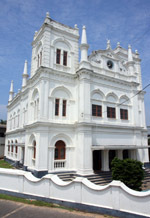 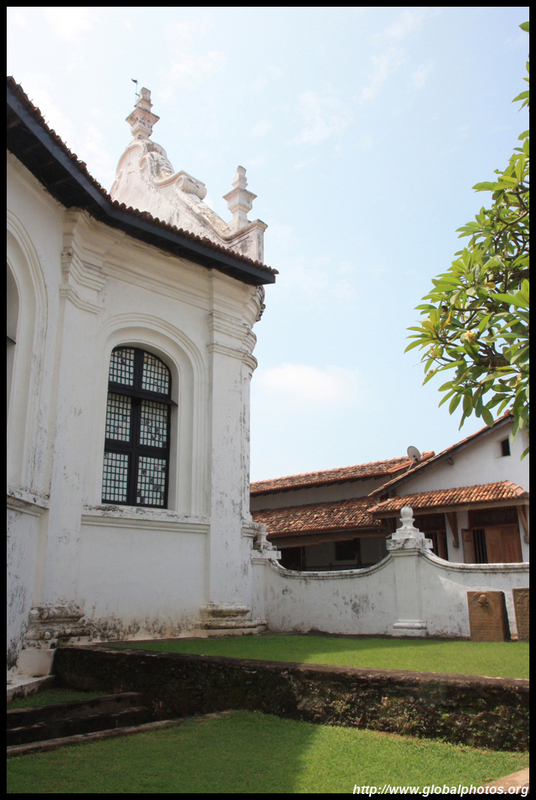 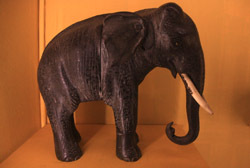 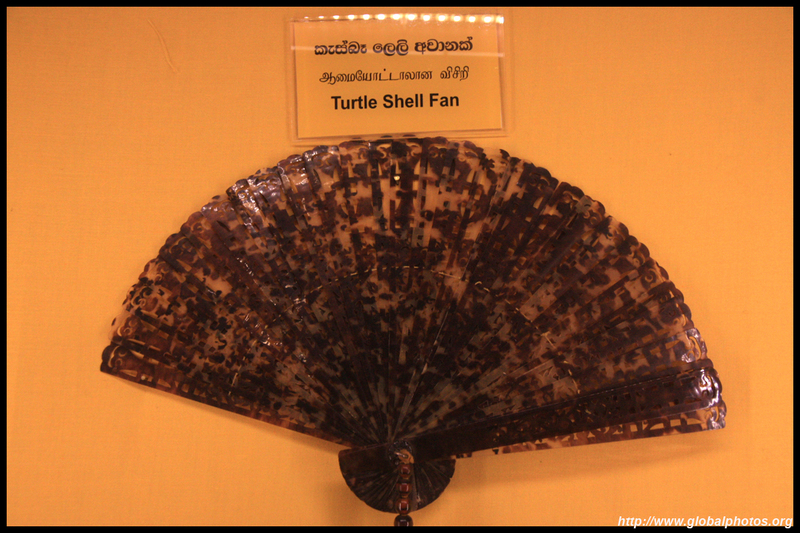 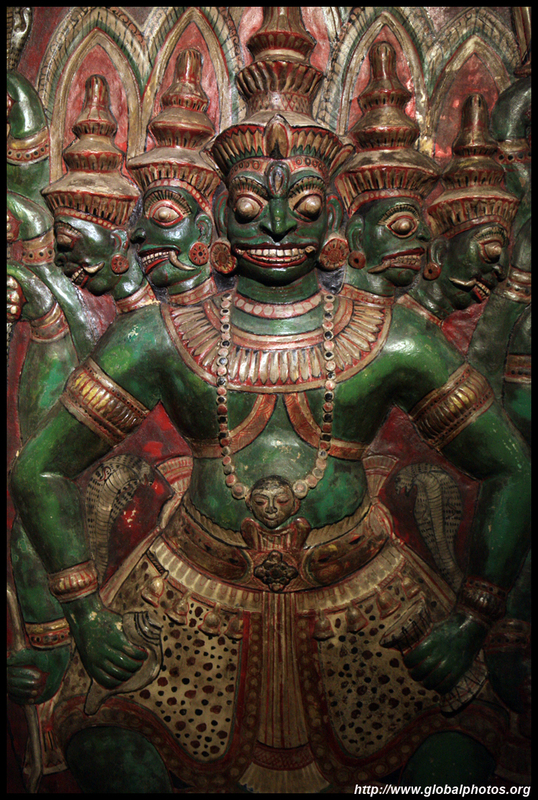 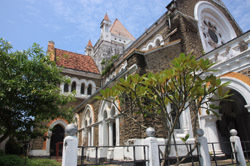 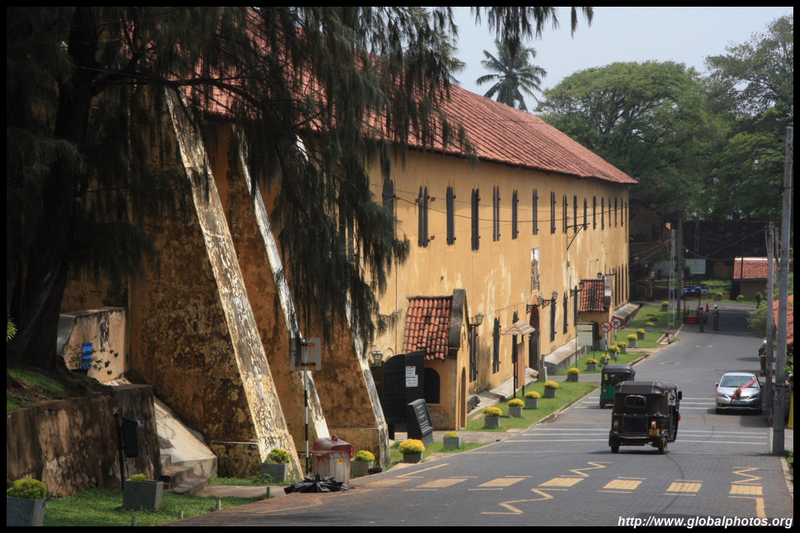 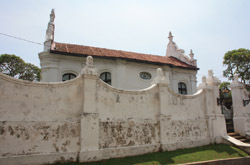 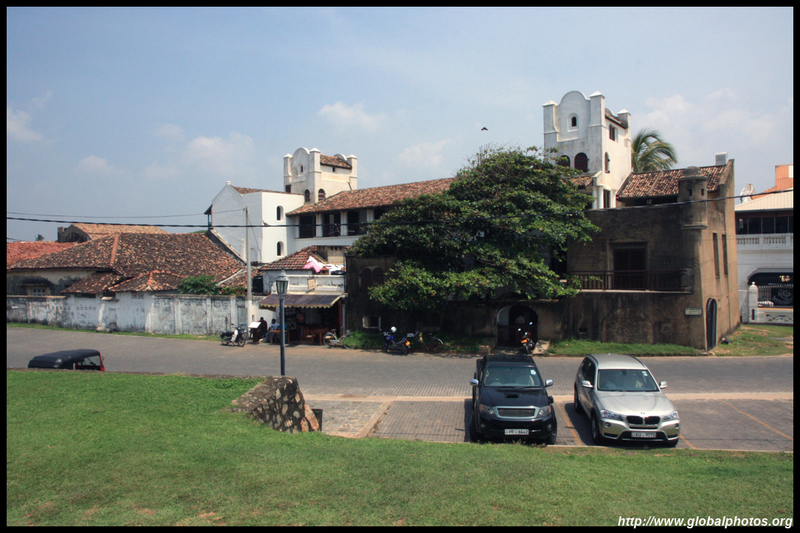 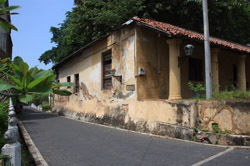 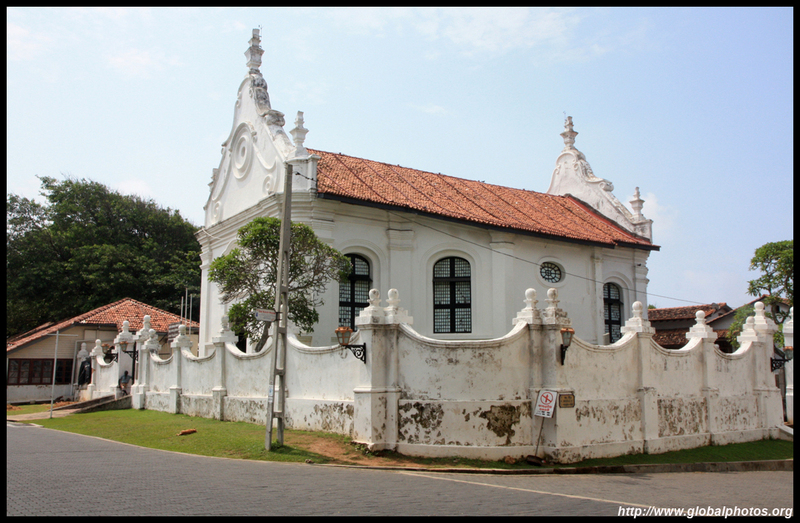 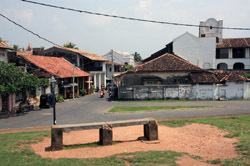 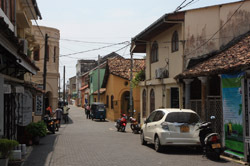 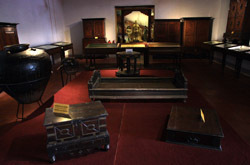 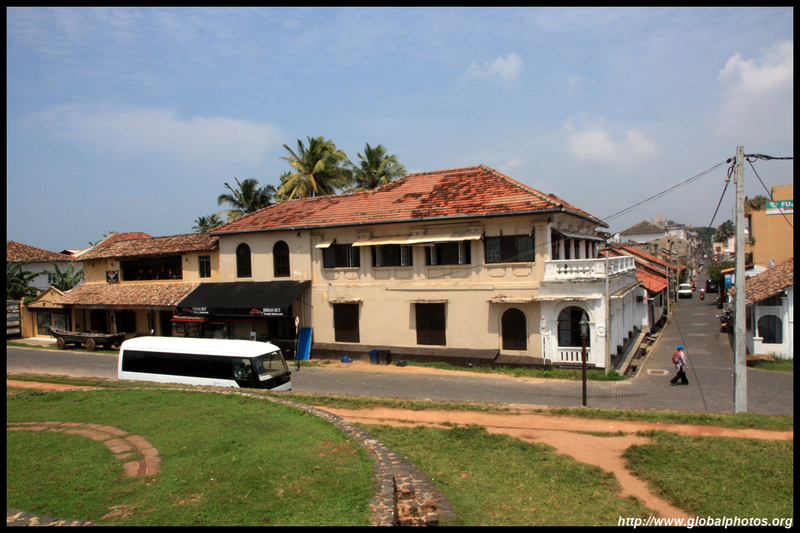 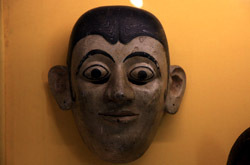 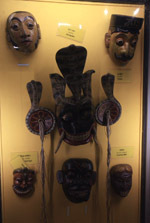 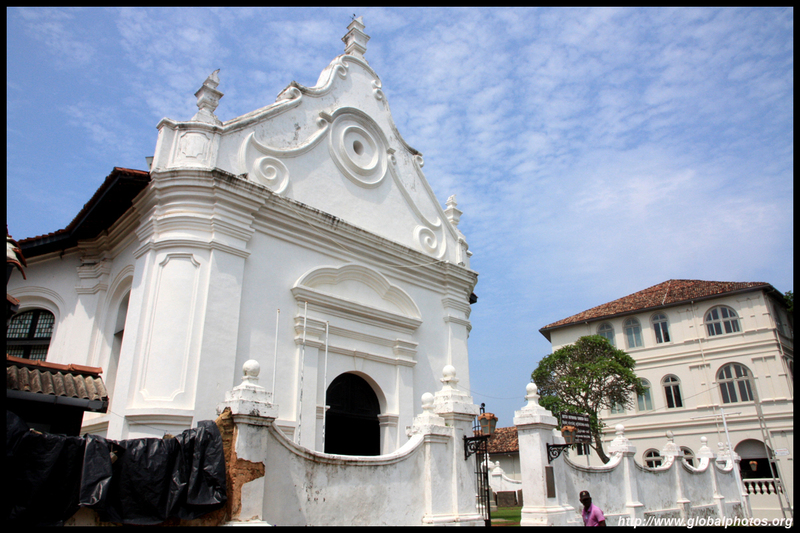 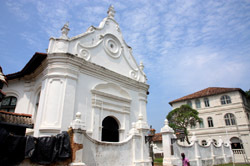 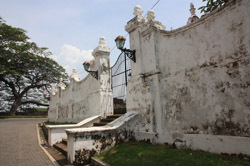 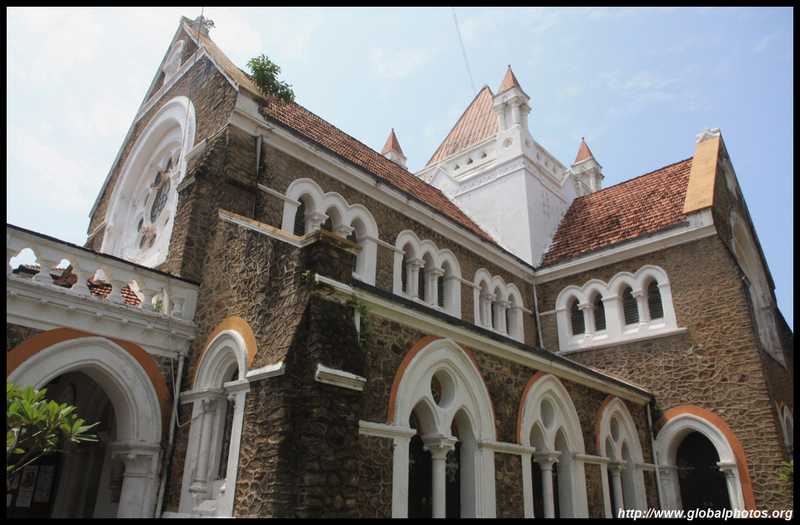 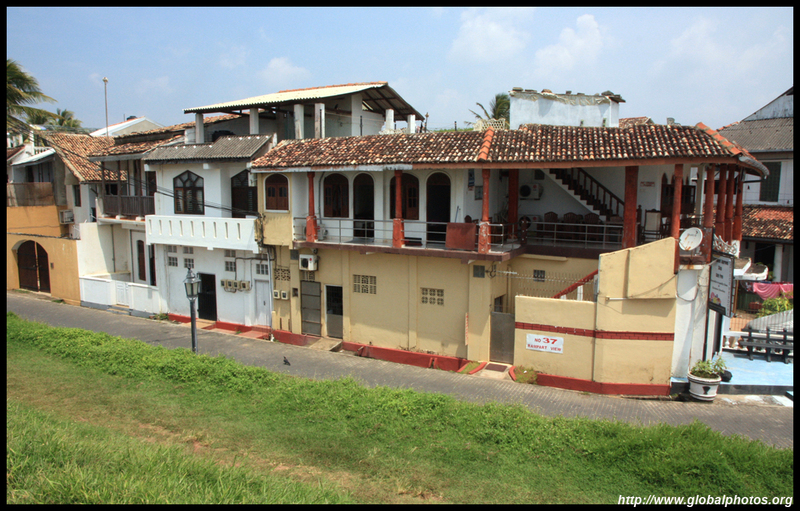 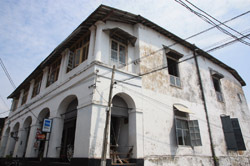 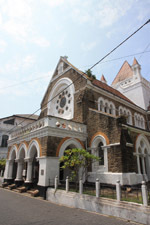 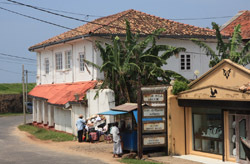 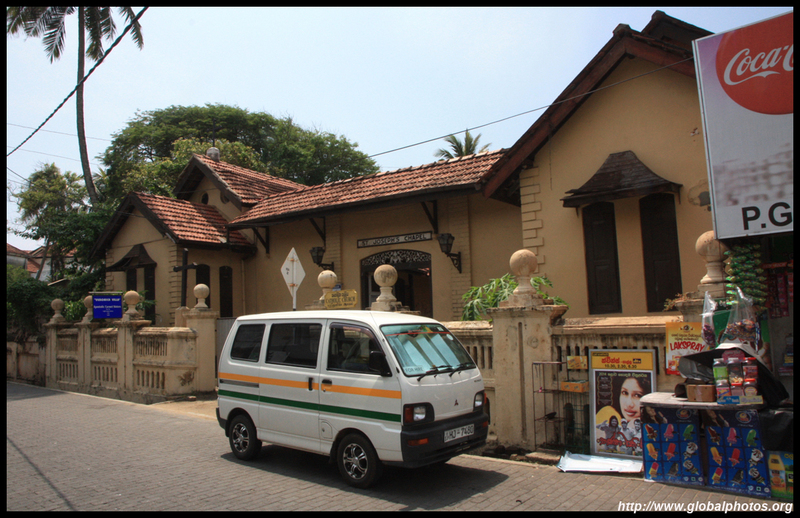 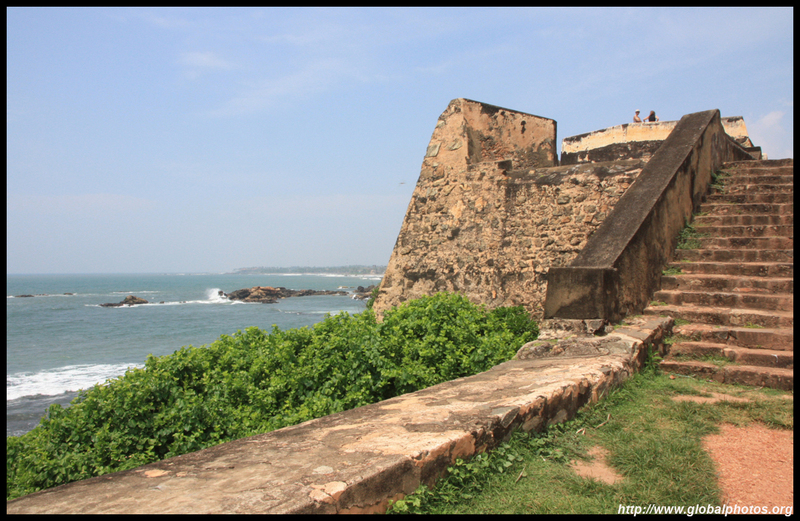 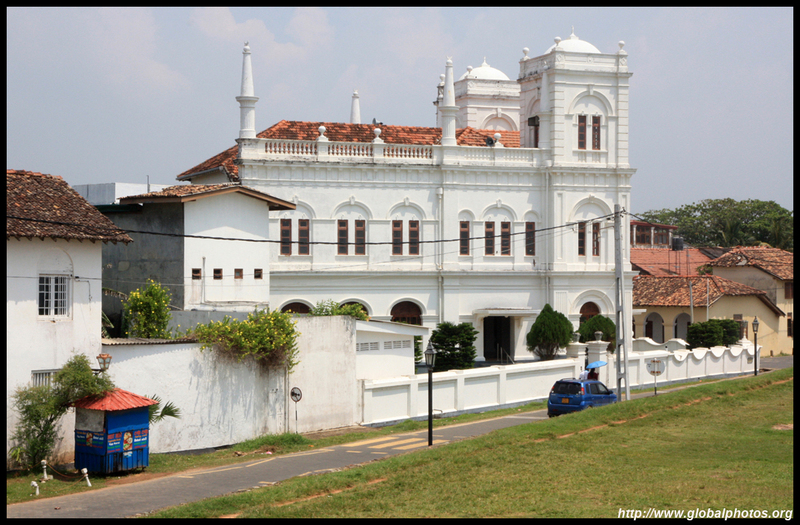 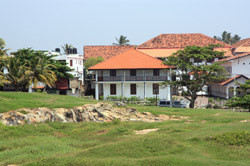 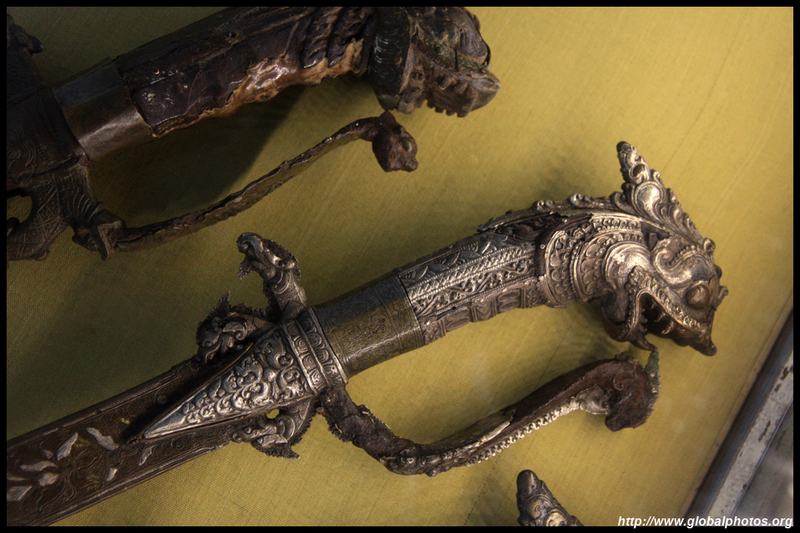 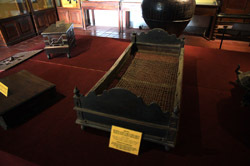 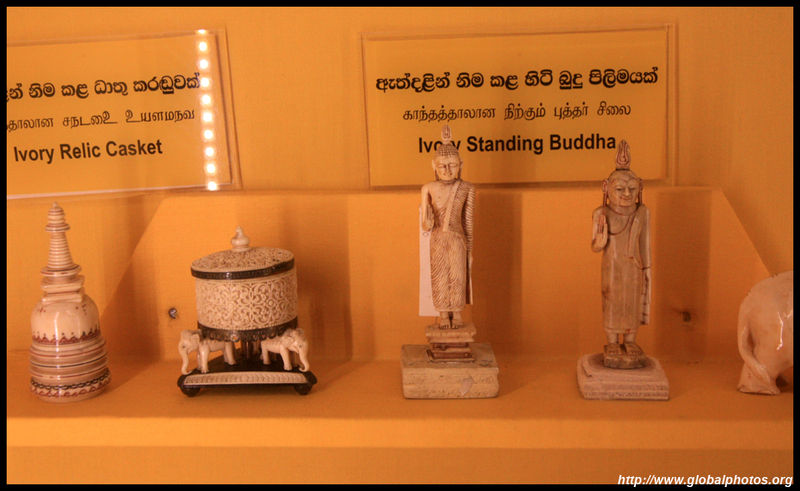 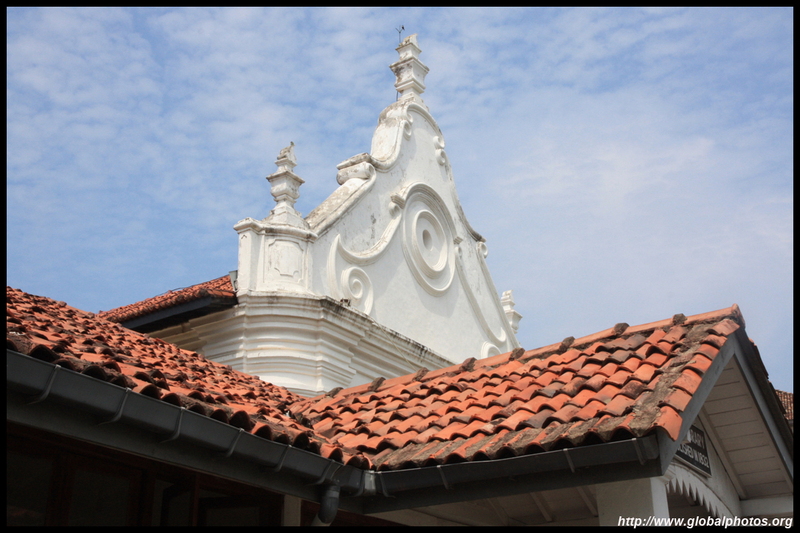 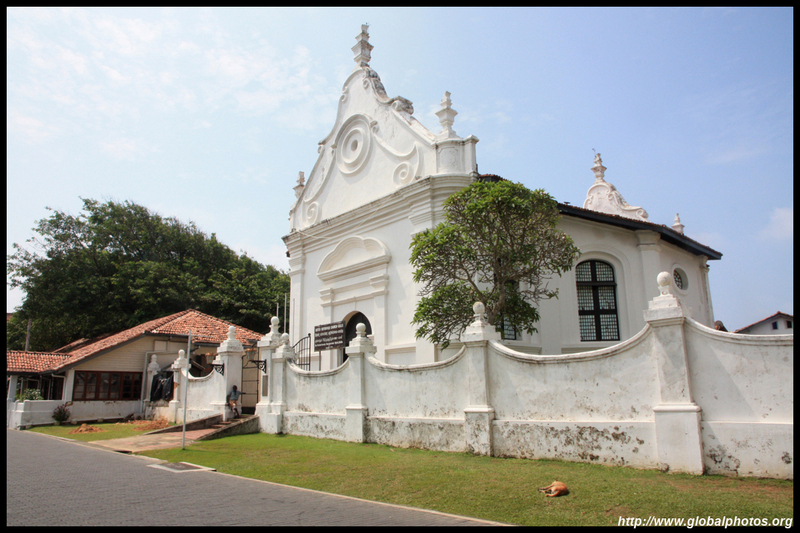 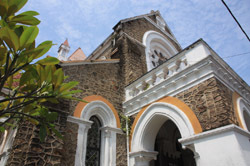 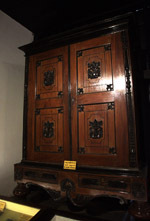 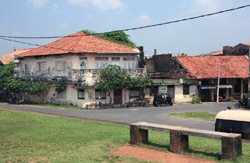 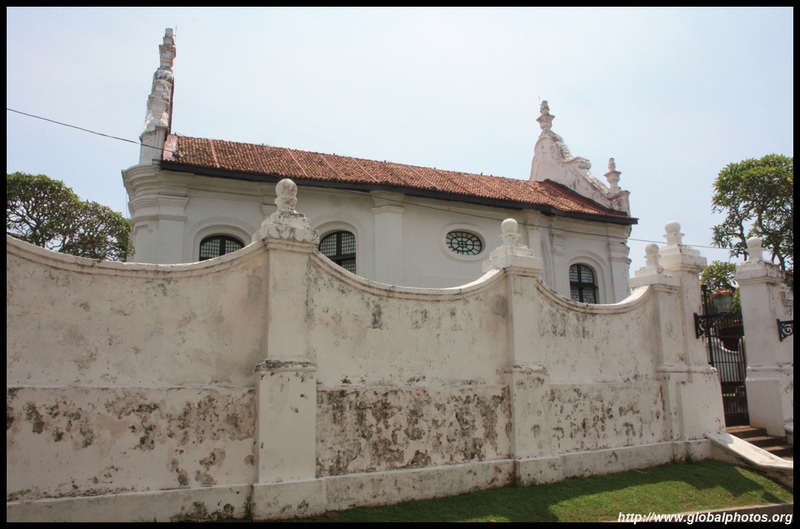 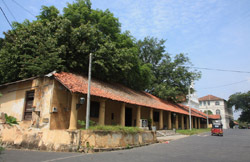 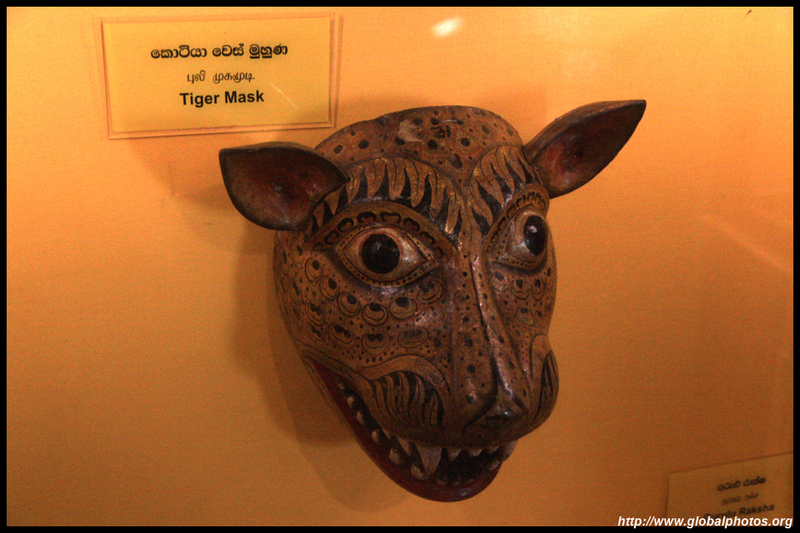 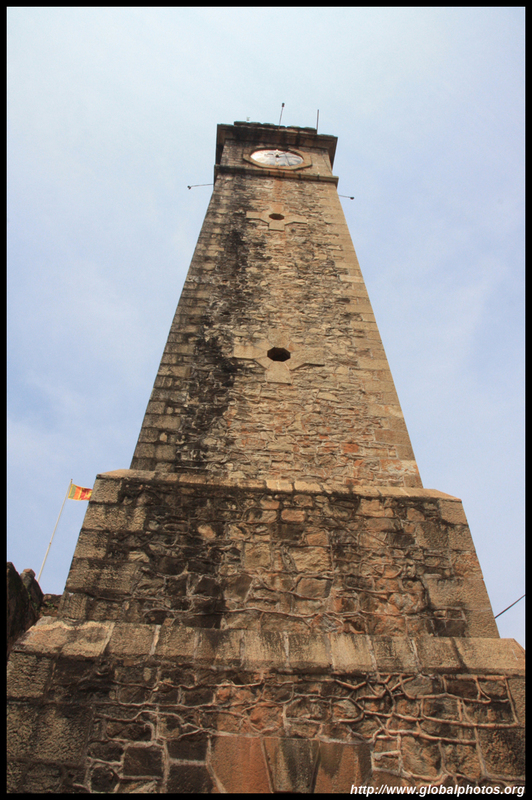 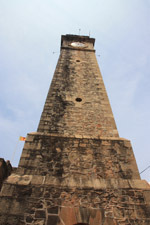 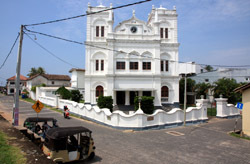 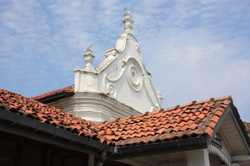 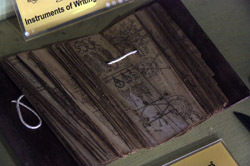 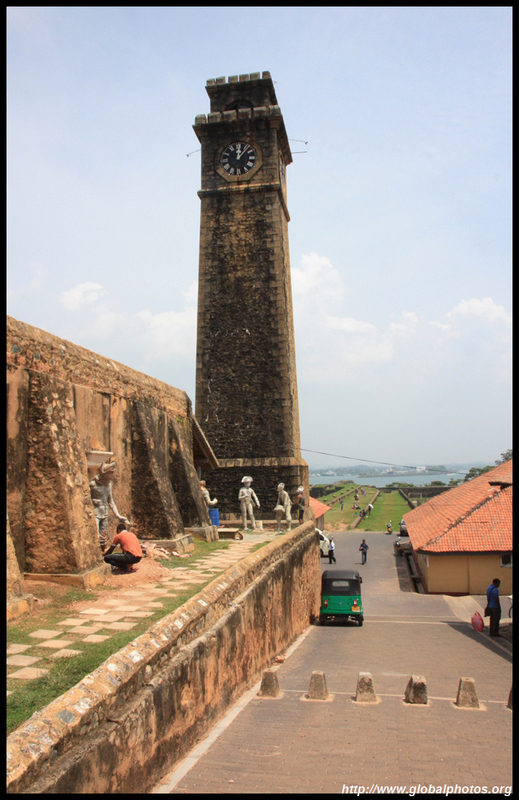 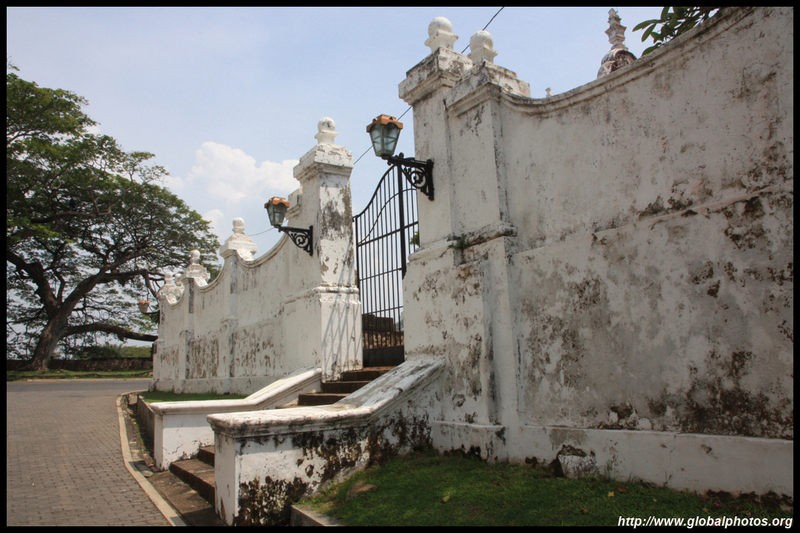 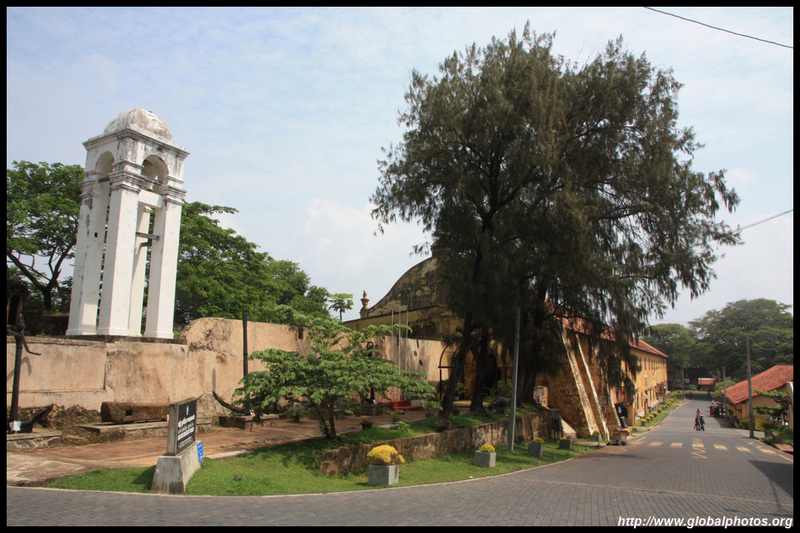 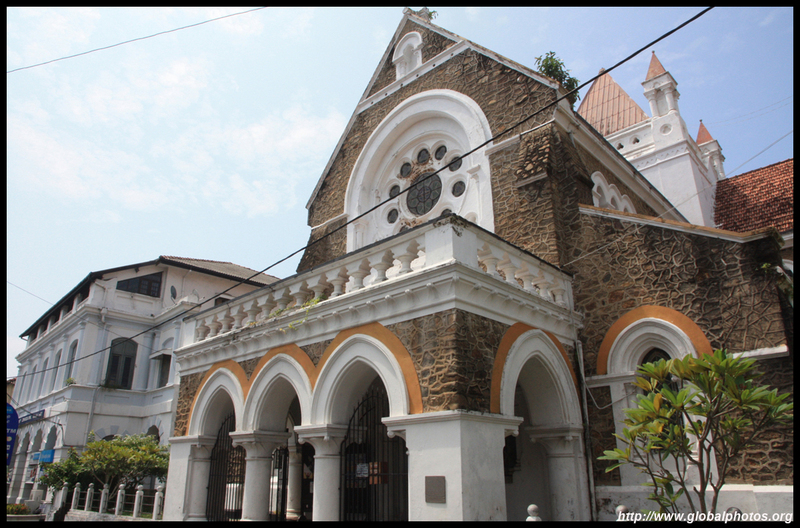 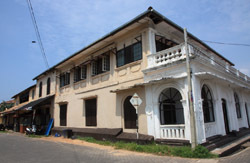 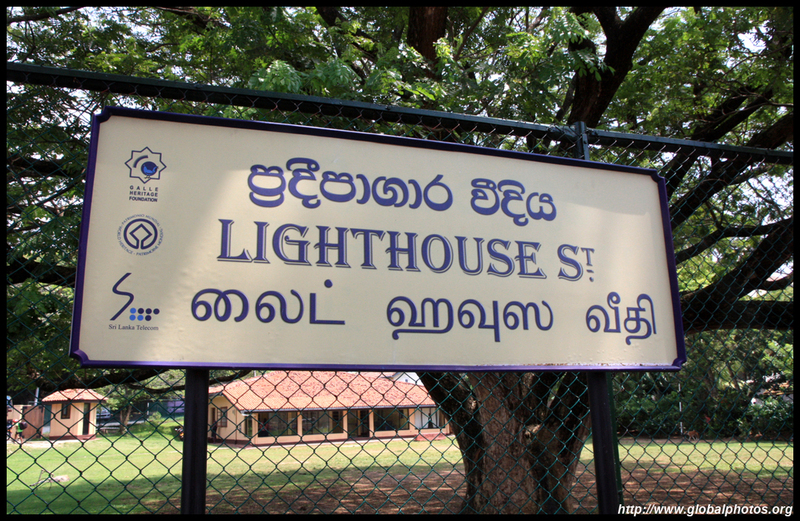 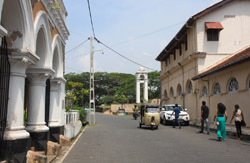 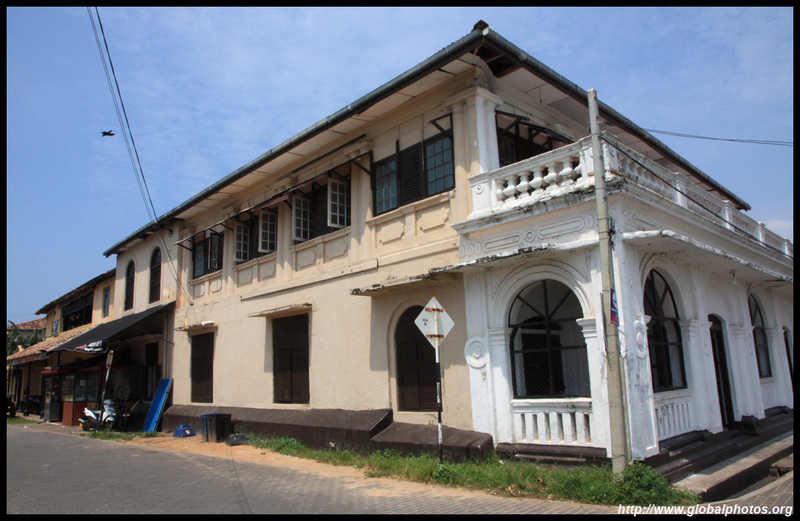 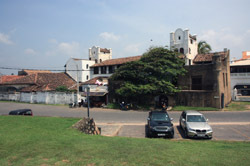 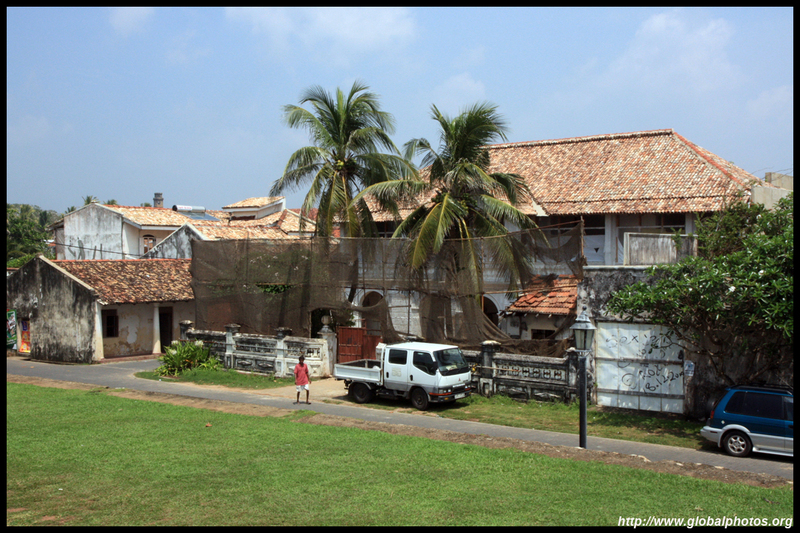 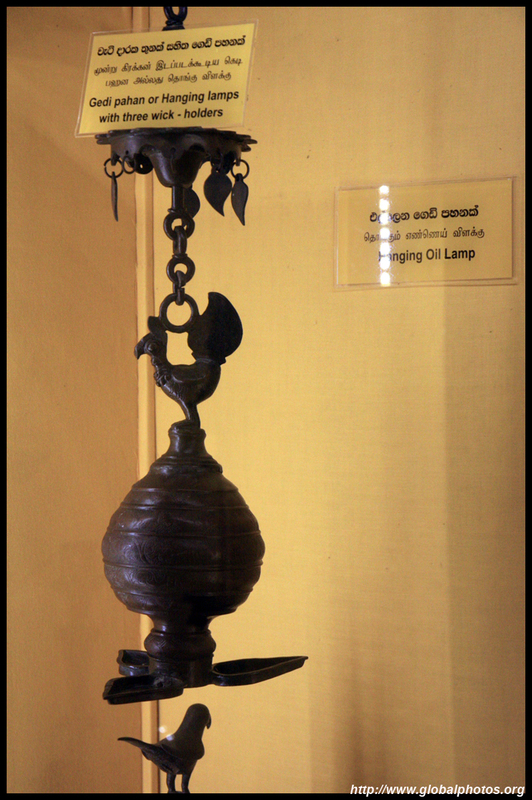 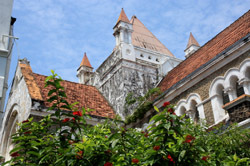 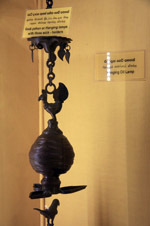 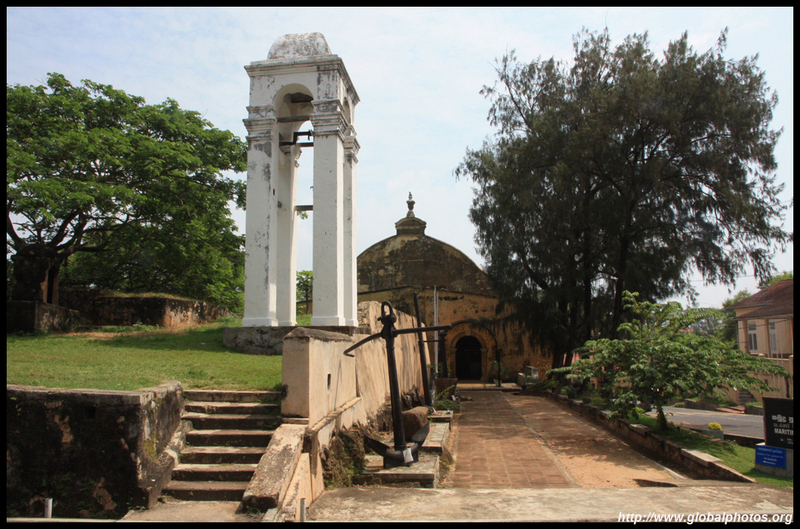 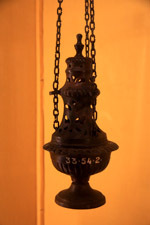 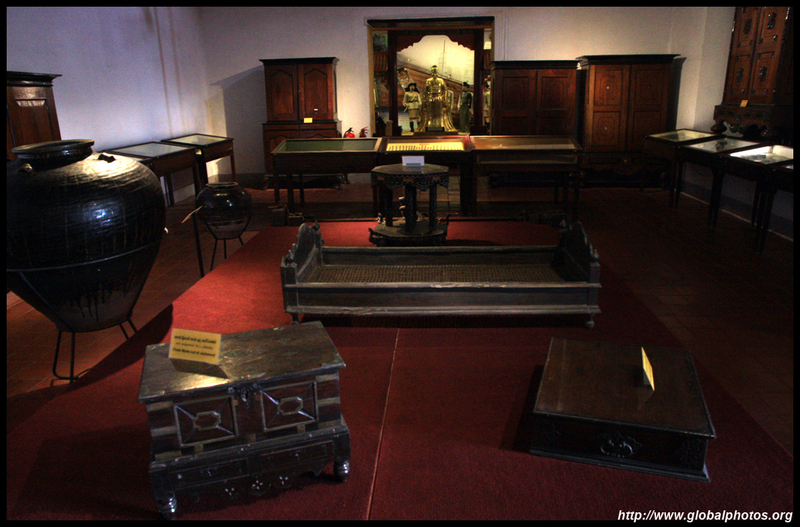 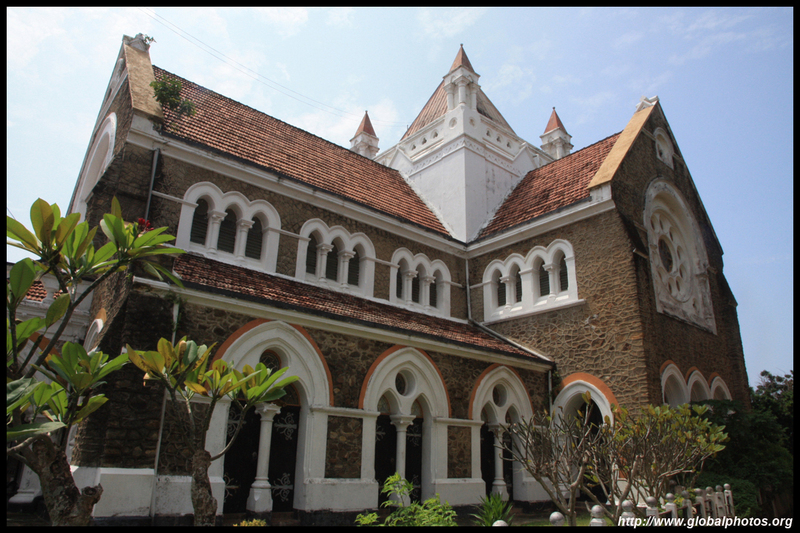 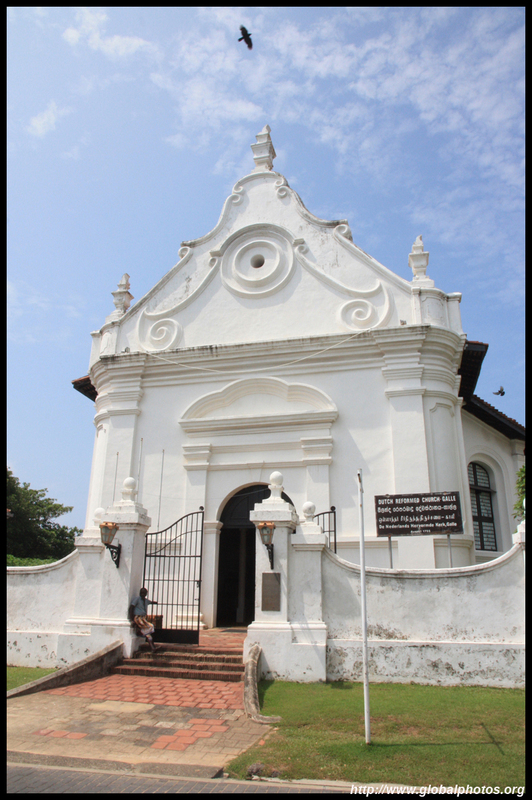 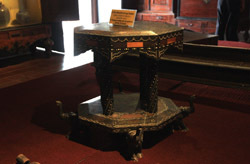 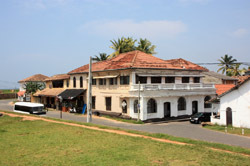 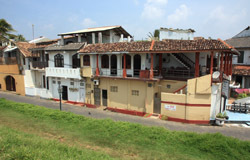 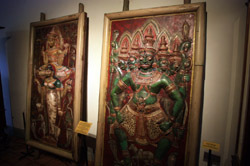 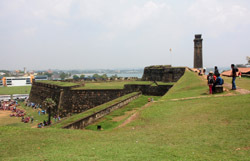 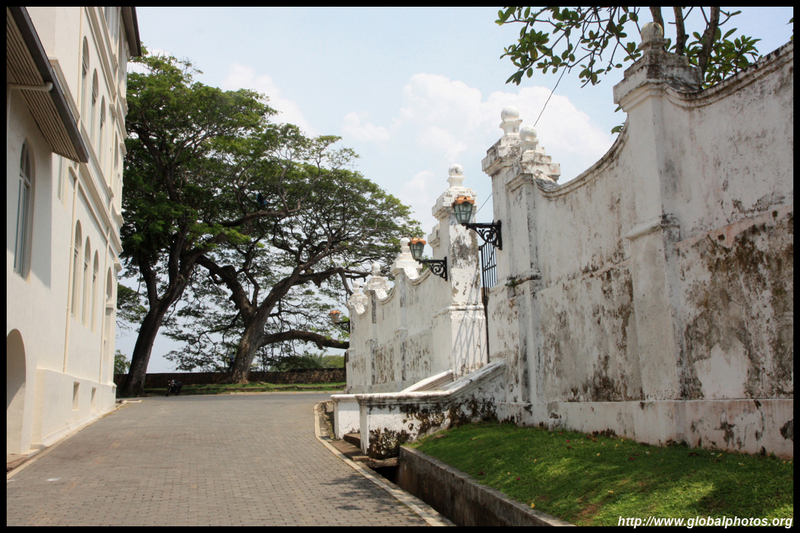 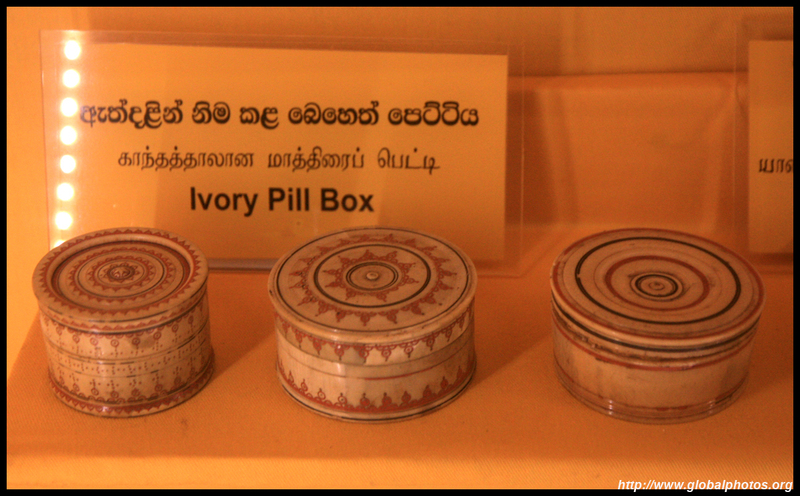 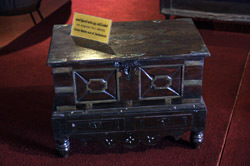 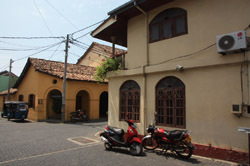 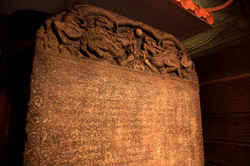 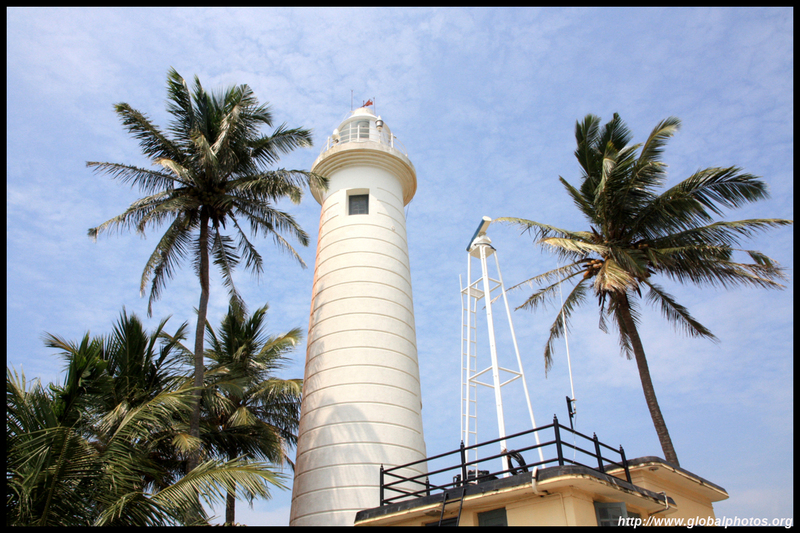 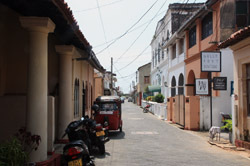 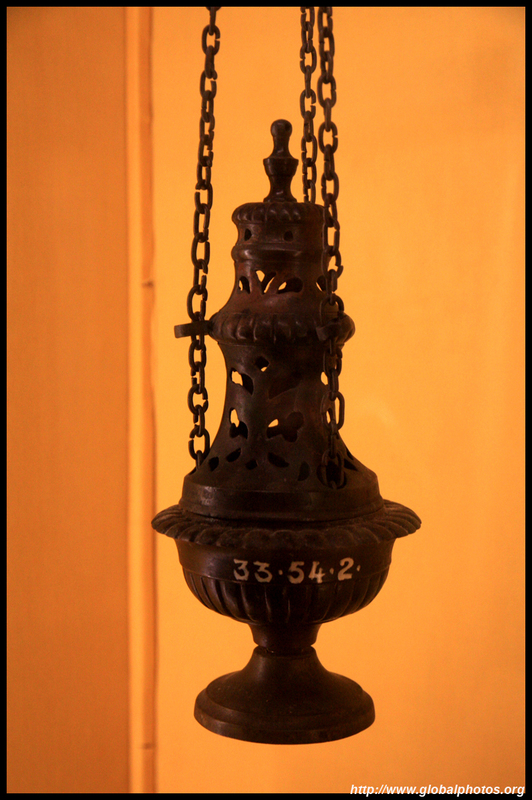 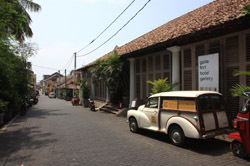 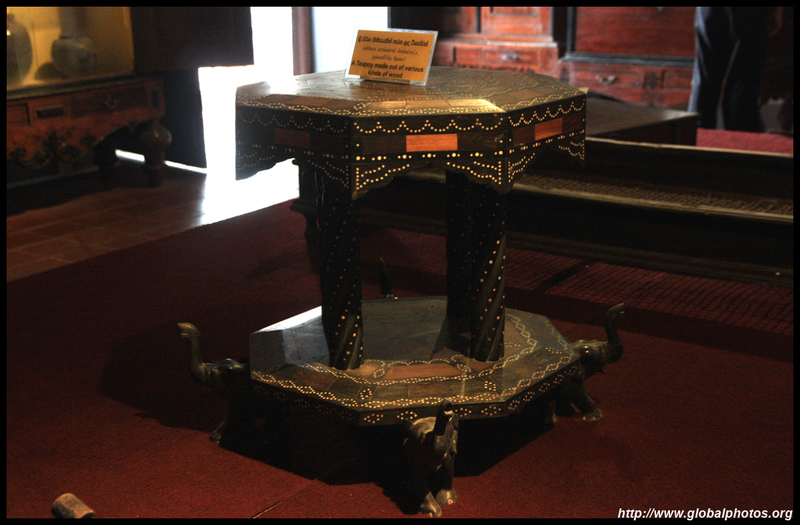 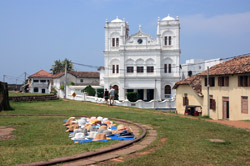 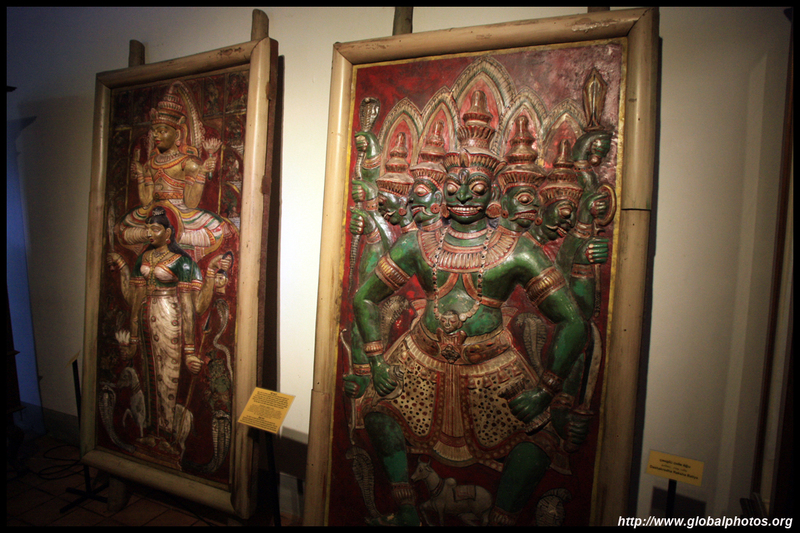 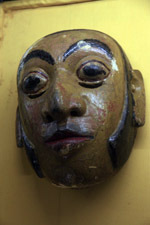 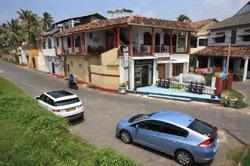 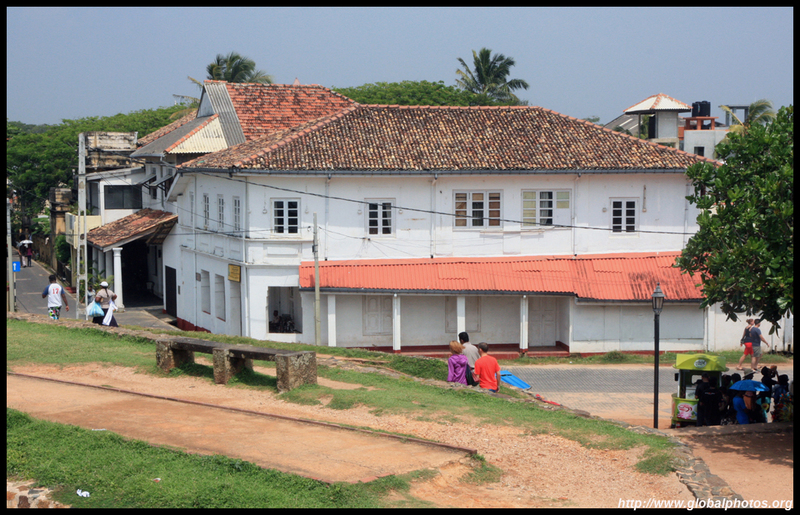 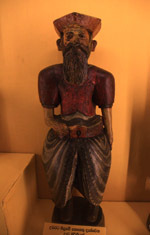 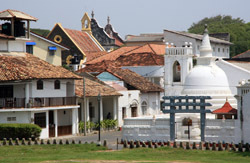 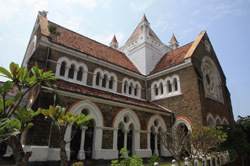 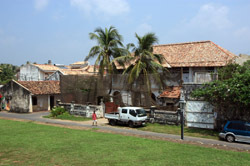 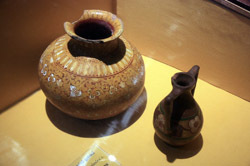 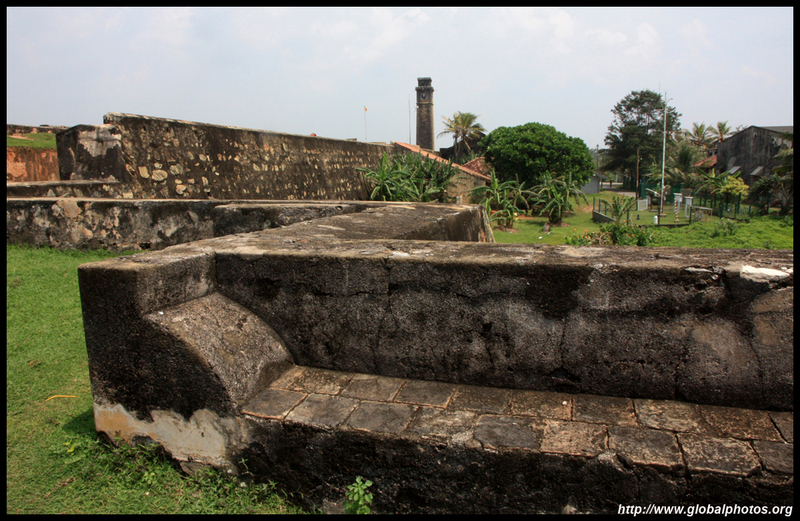 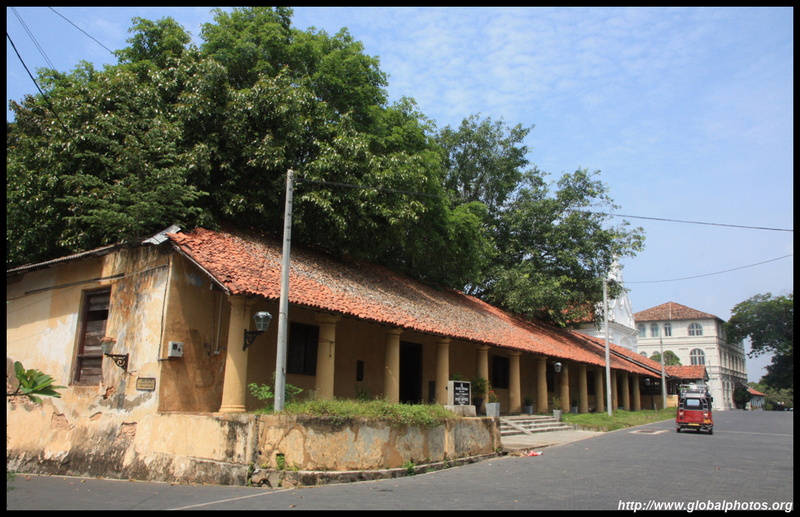 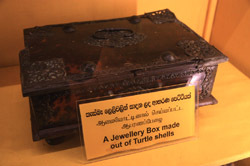 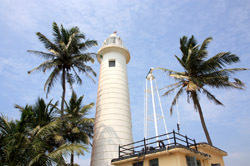 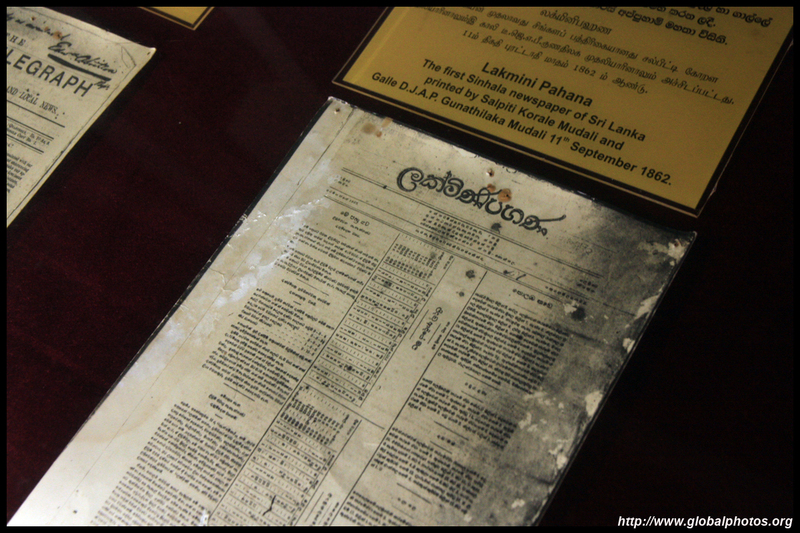 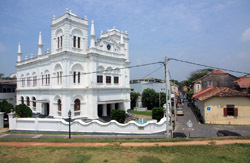 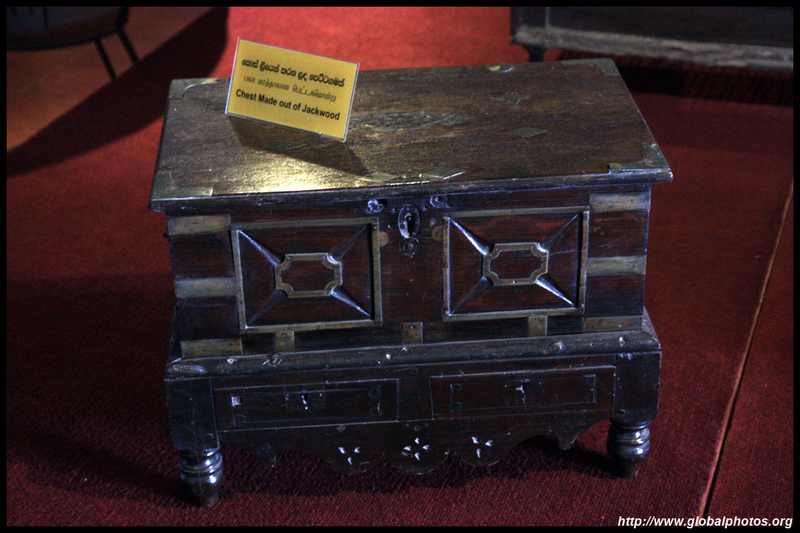 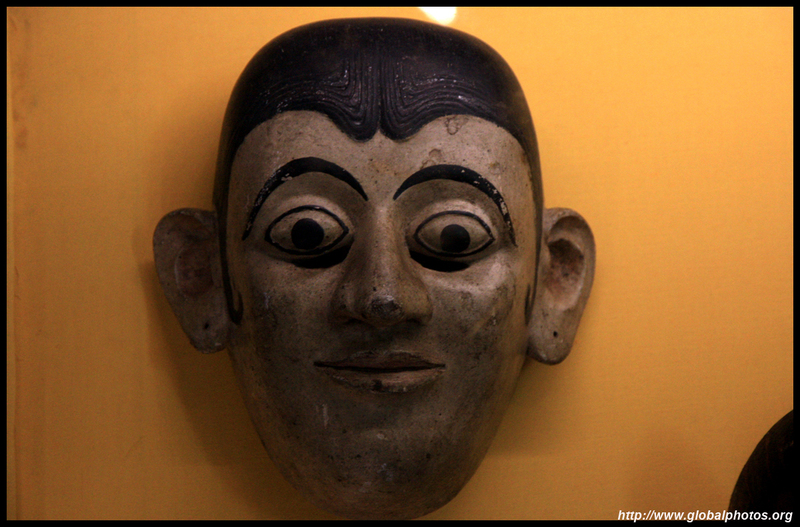 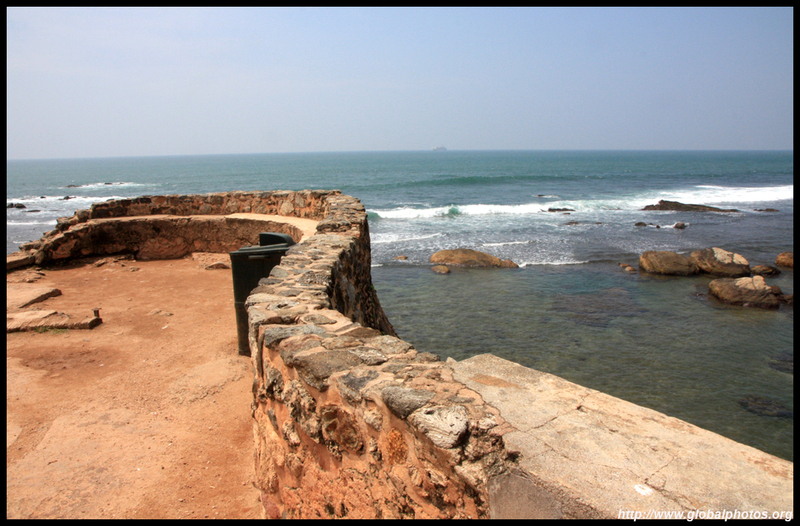 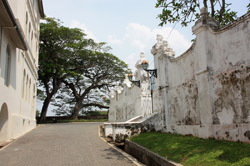 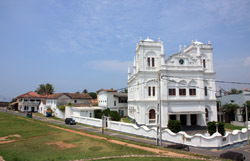 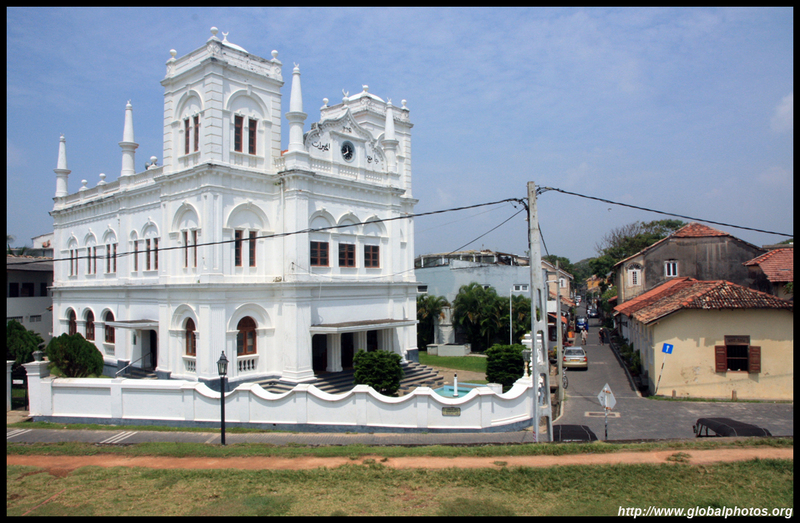 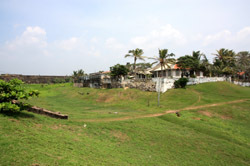 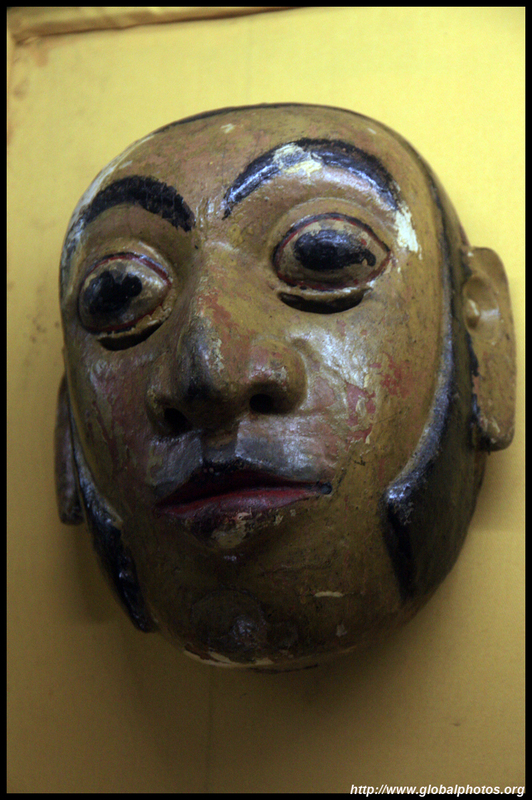 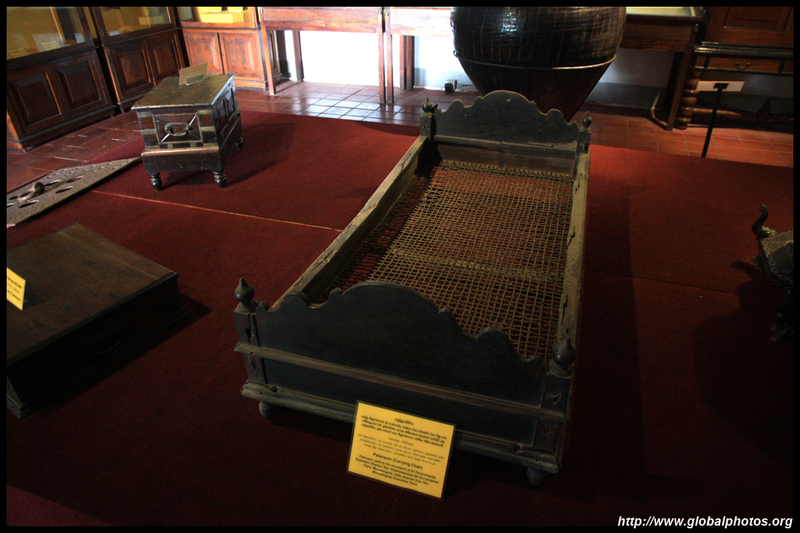 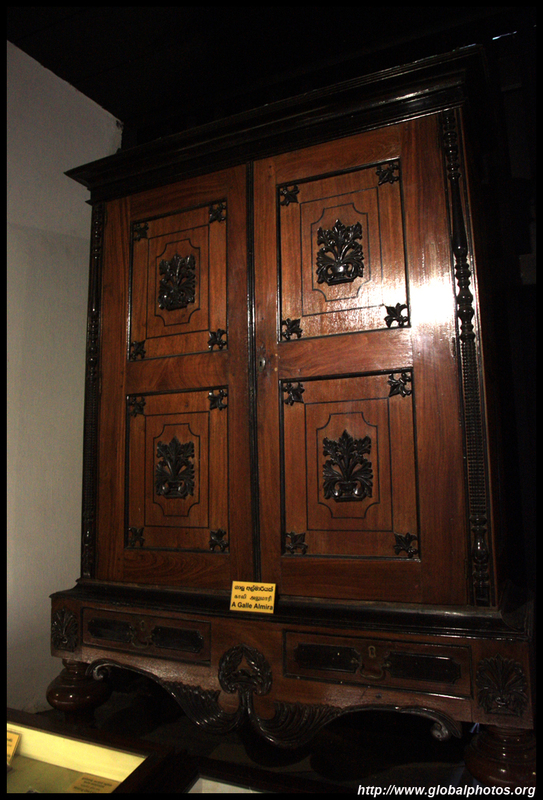 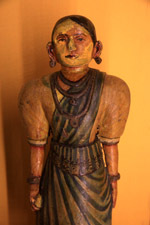 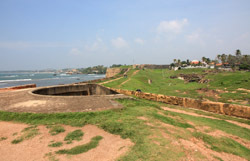 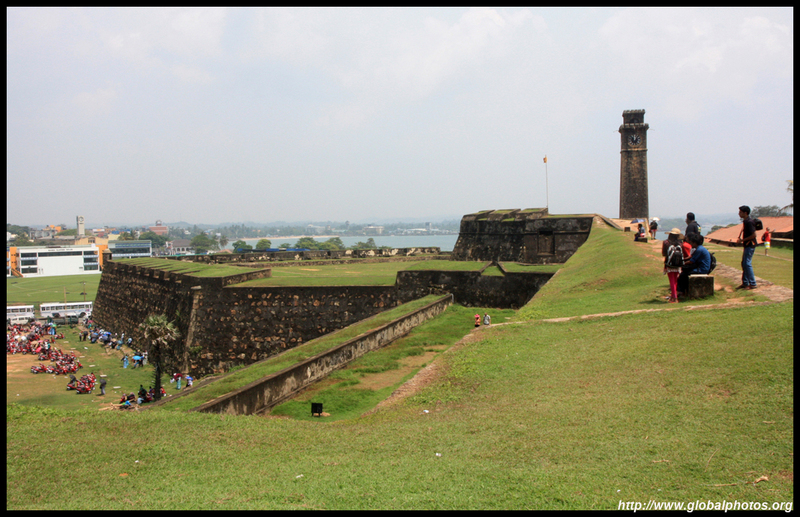 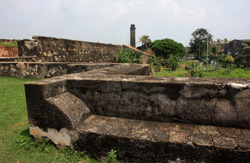 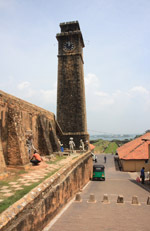 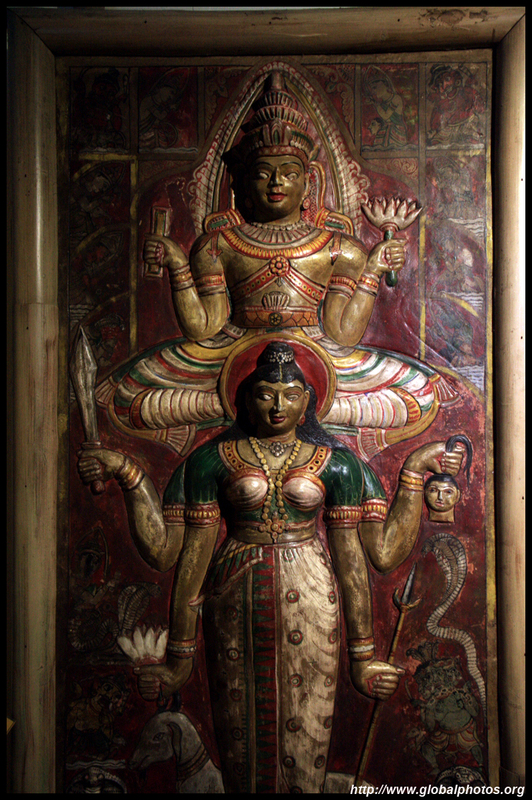 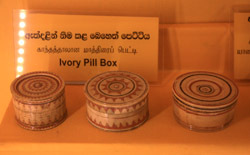 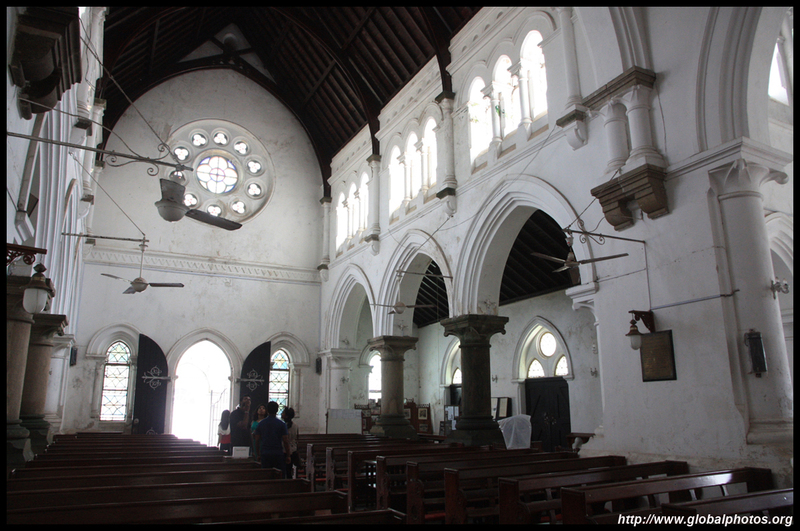 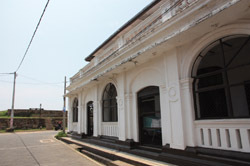 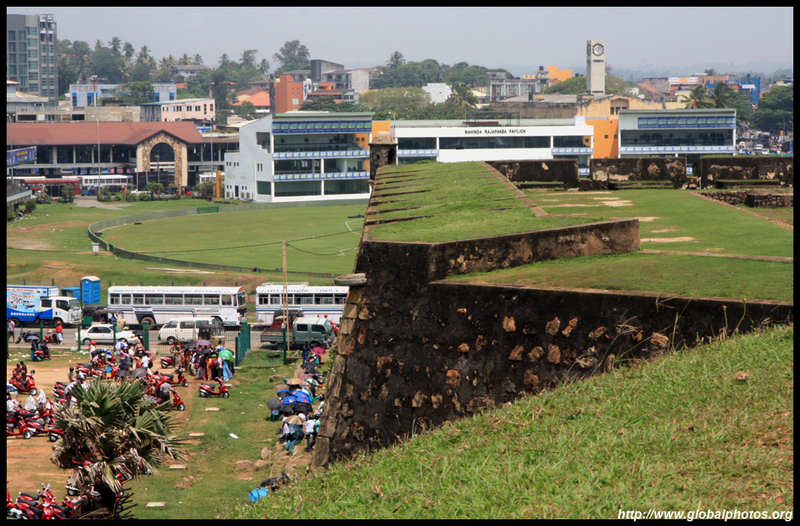 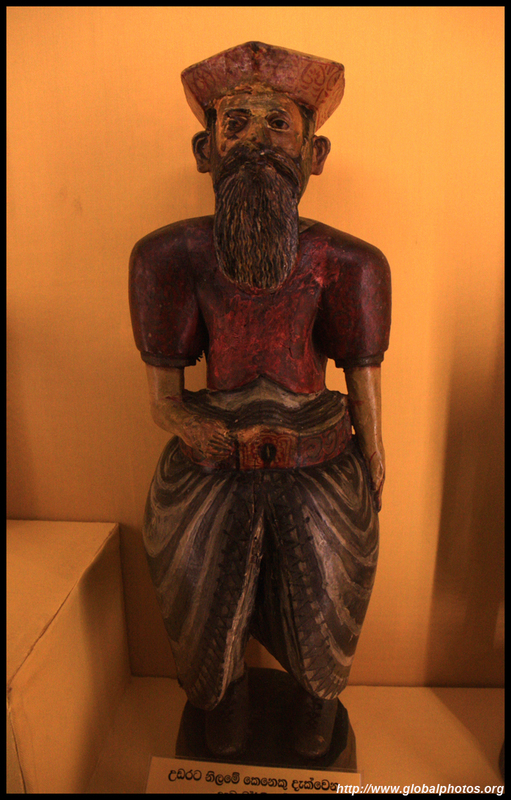 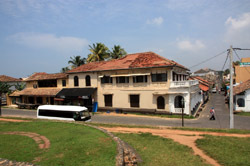 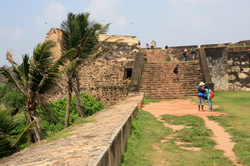 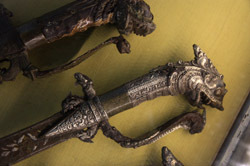 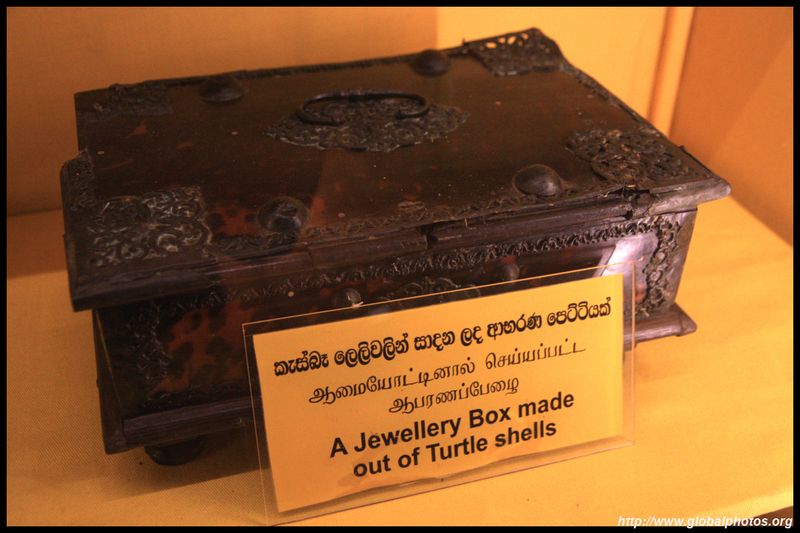 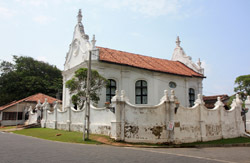 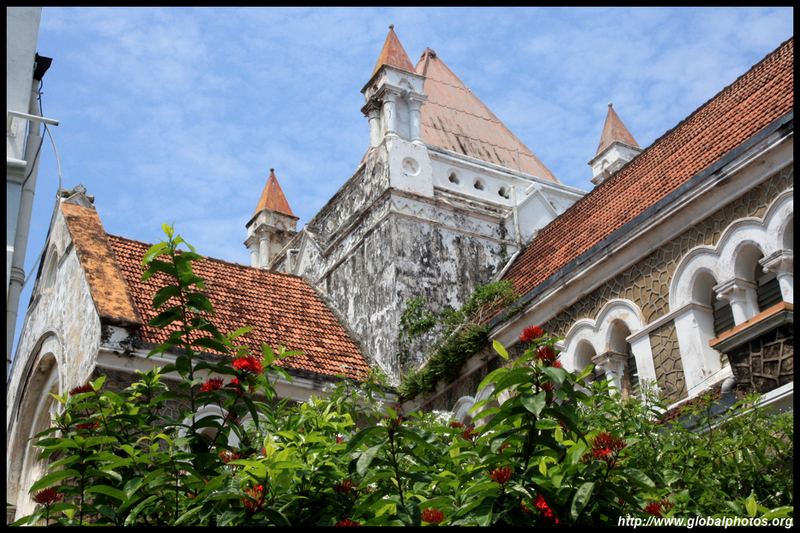 The Galle National Museum is located in the oldest Dutch building of the old fort and offers a good introduction to Sri Lanka's maritime links and interactions with both Western and Eastern cultures. 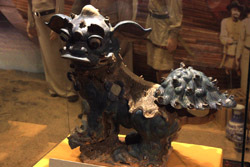 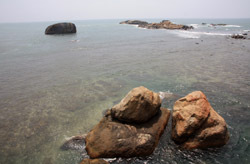 Chinese merchant ships reached these shores centuries ago. 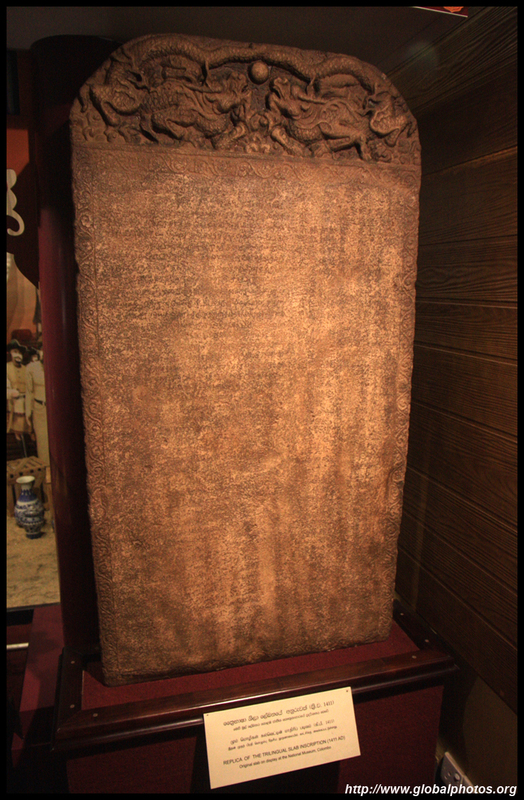 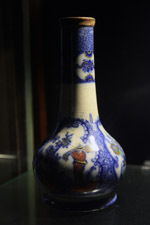 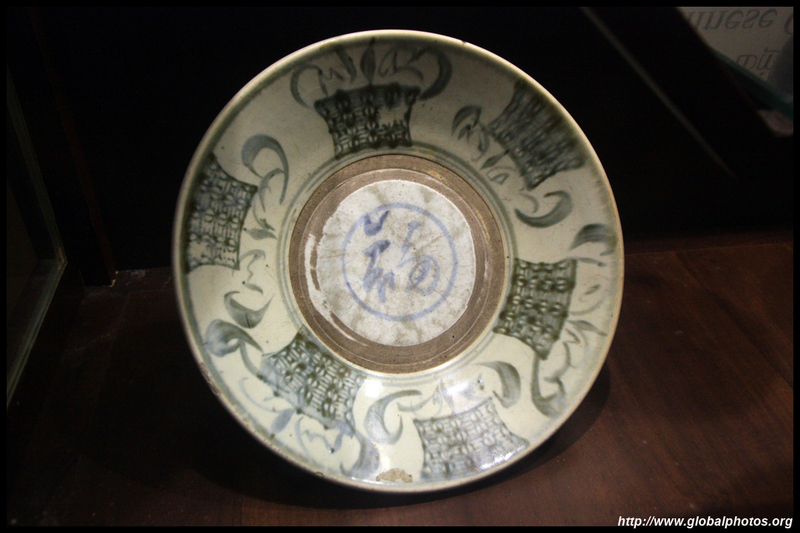 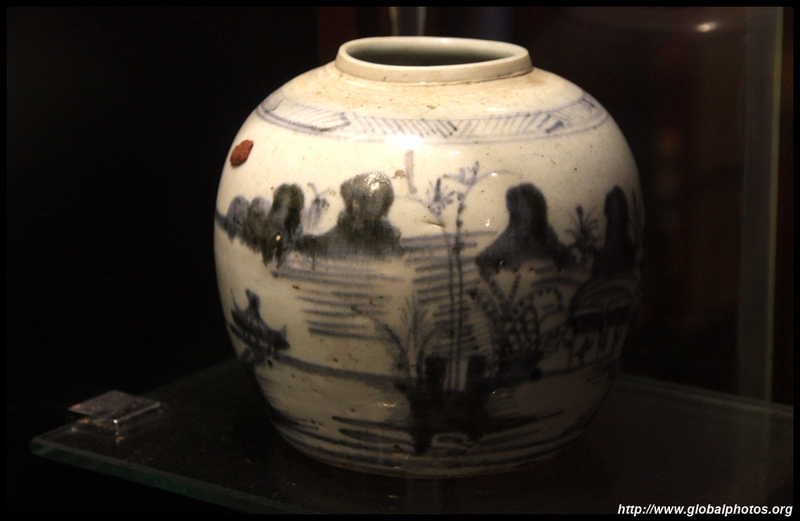 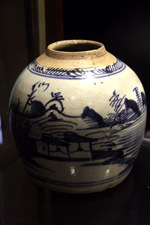 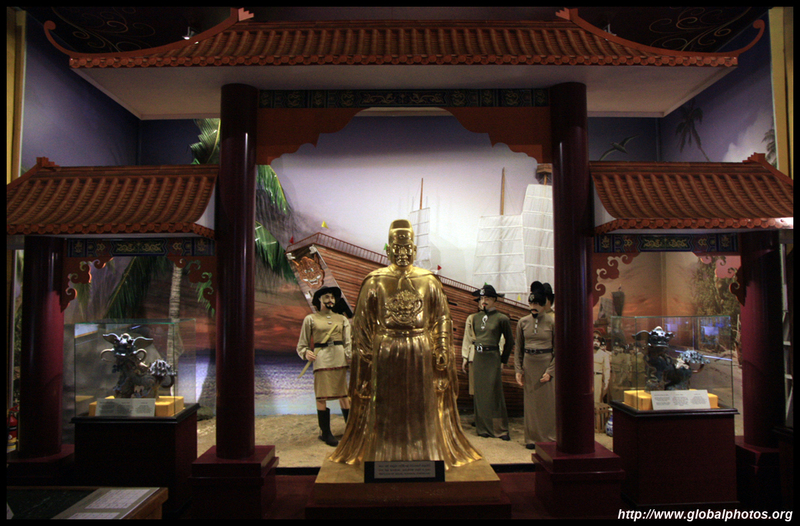 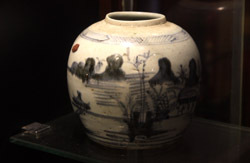 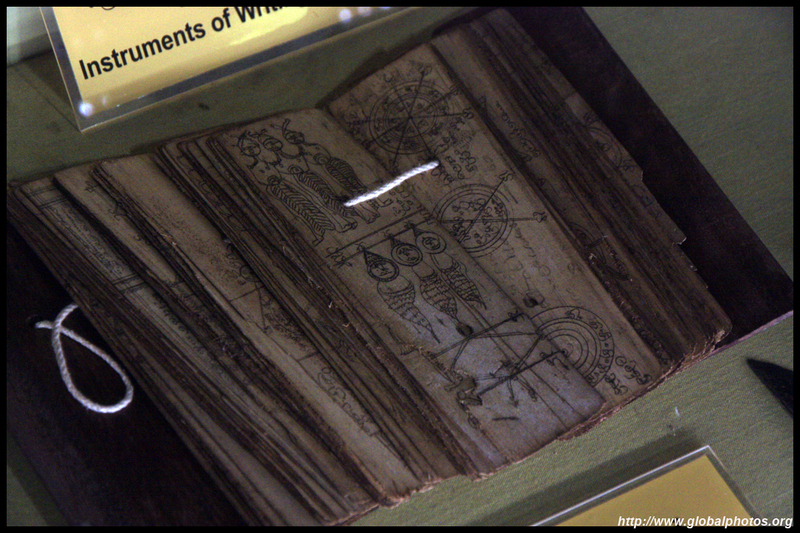 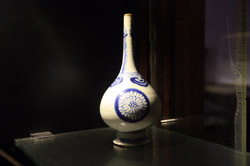 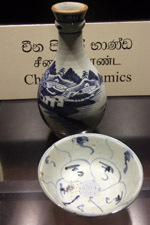 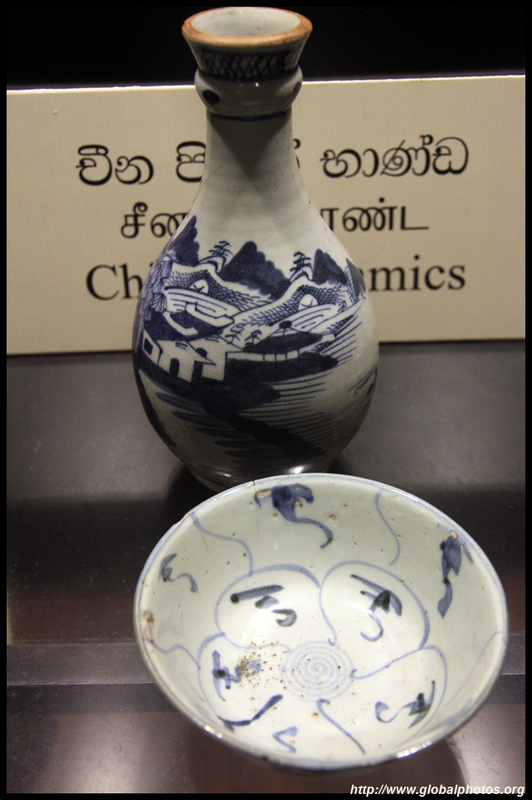 There is a section showcasing Chinese porcelain and also a replica of the slab describing Chinese explorers' visit in the 15th century. 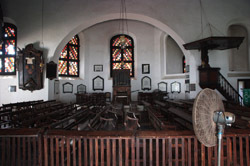 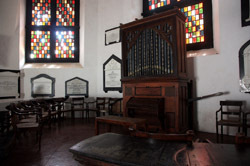 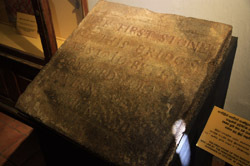 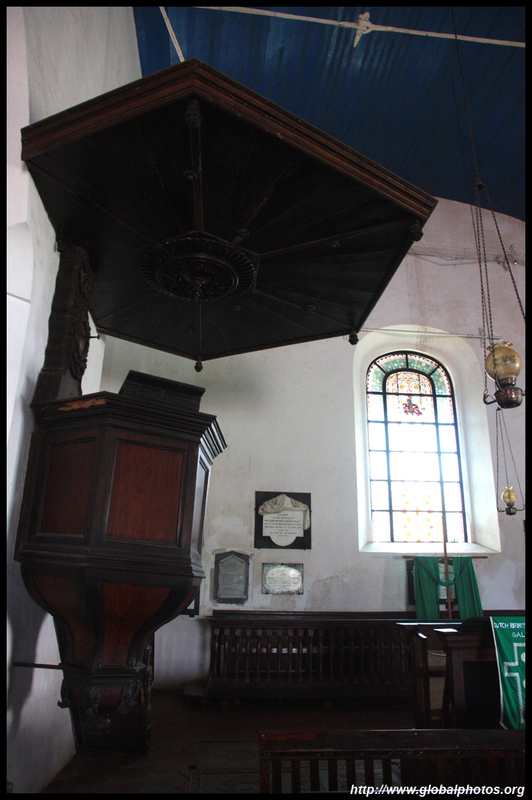 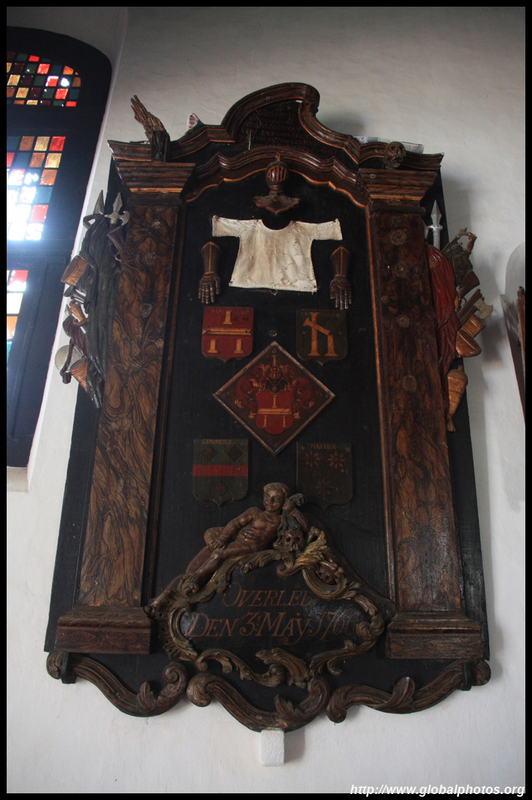 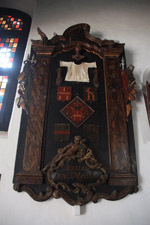 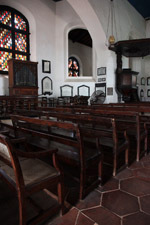 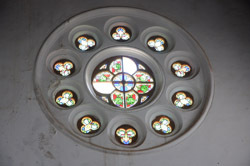 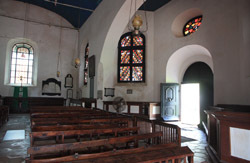 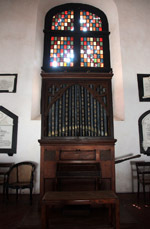 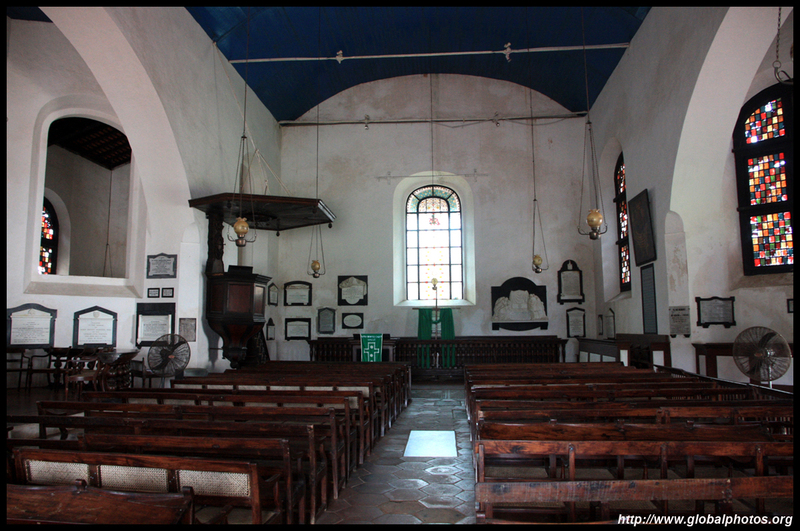 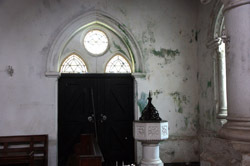 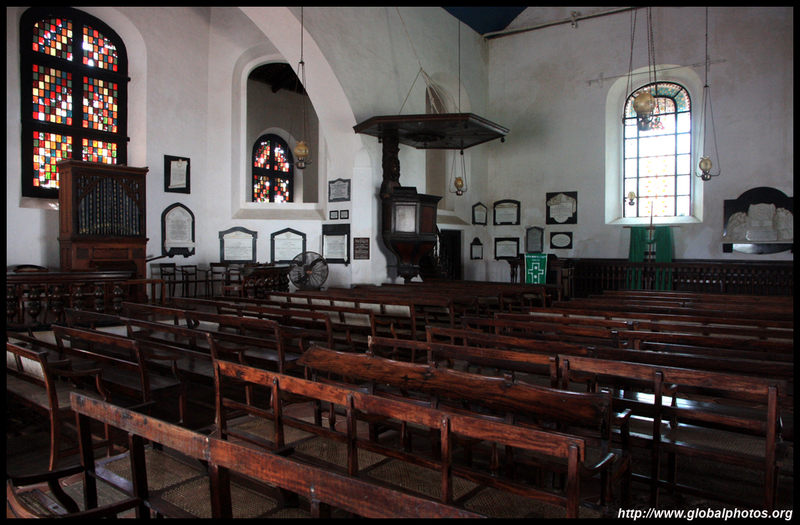 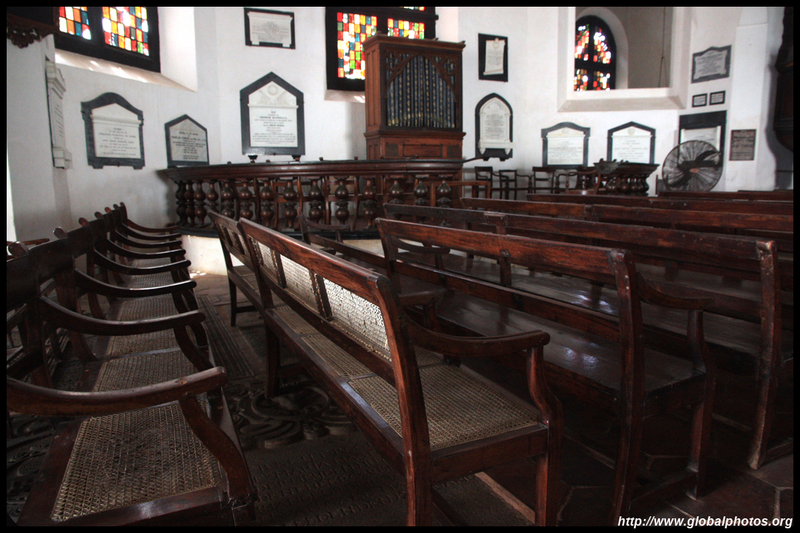 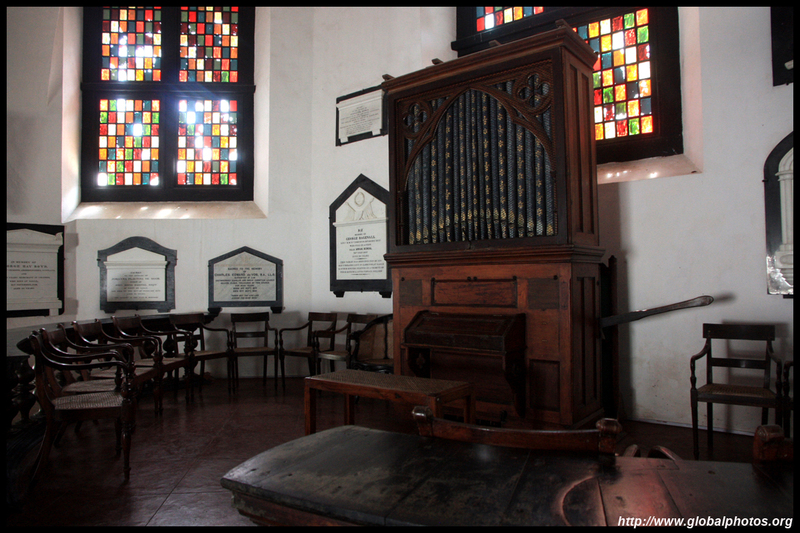 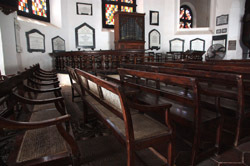 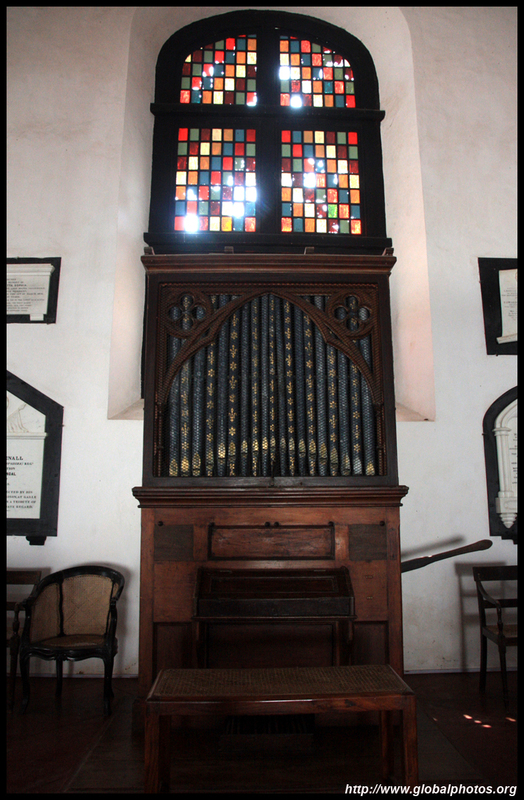 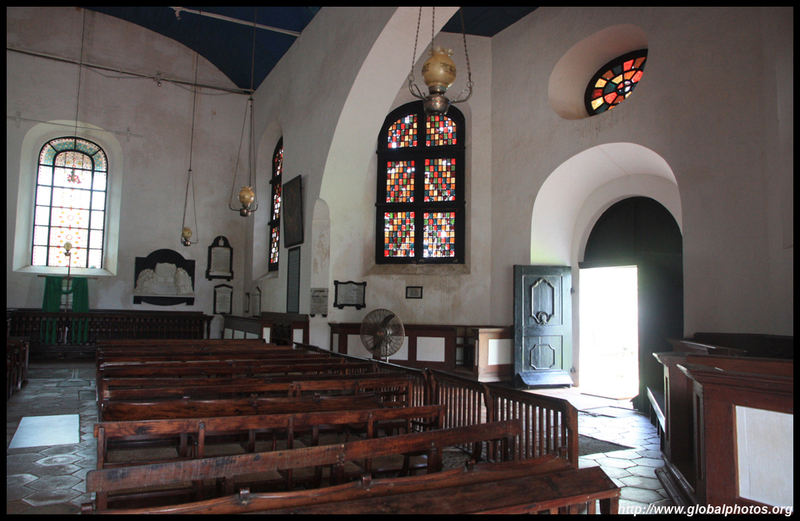 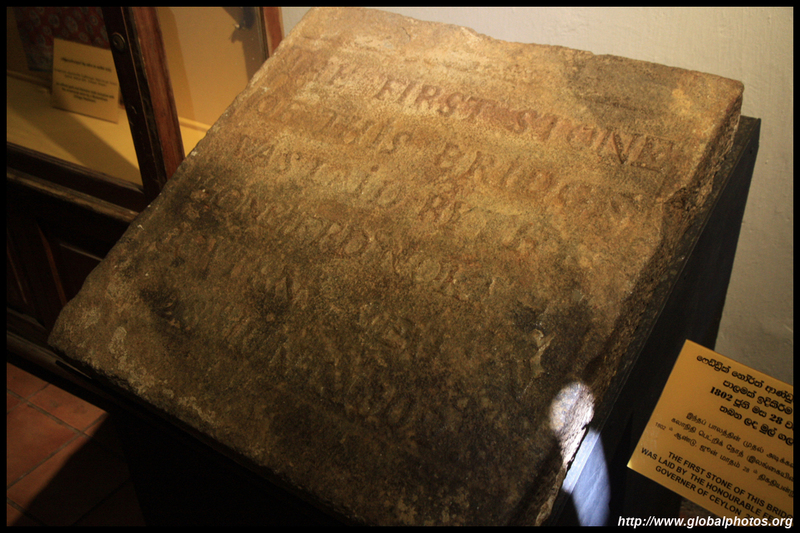 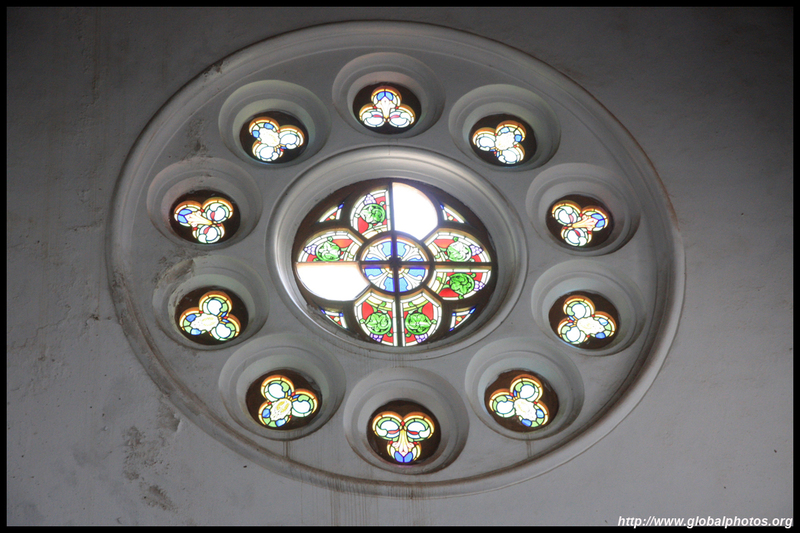 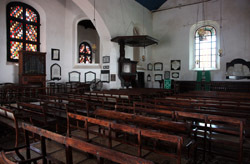 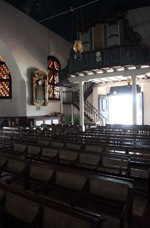 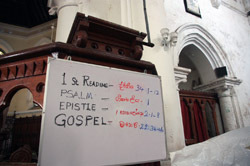 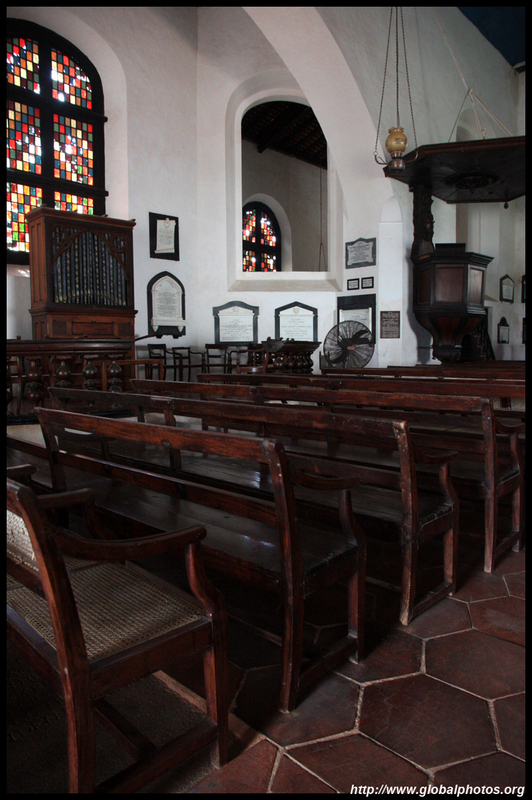 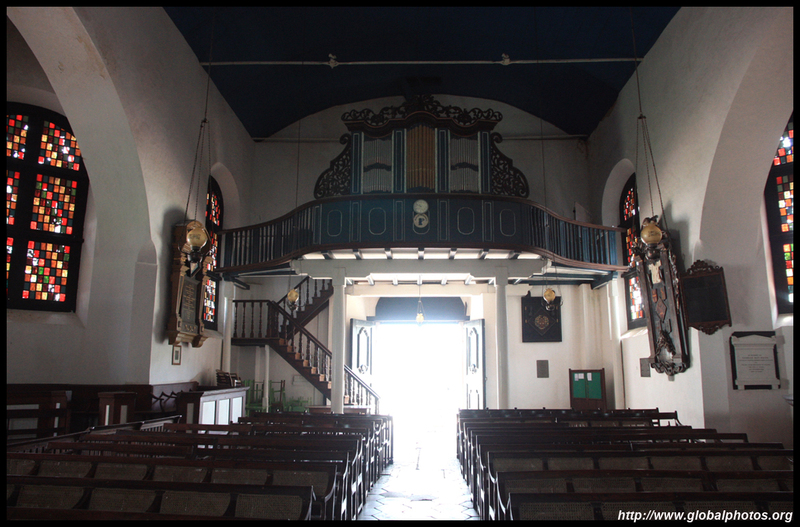 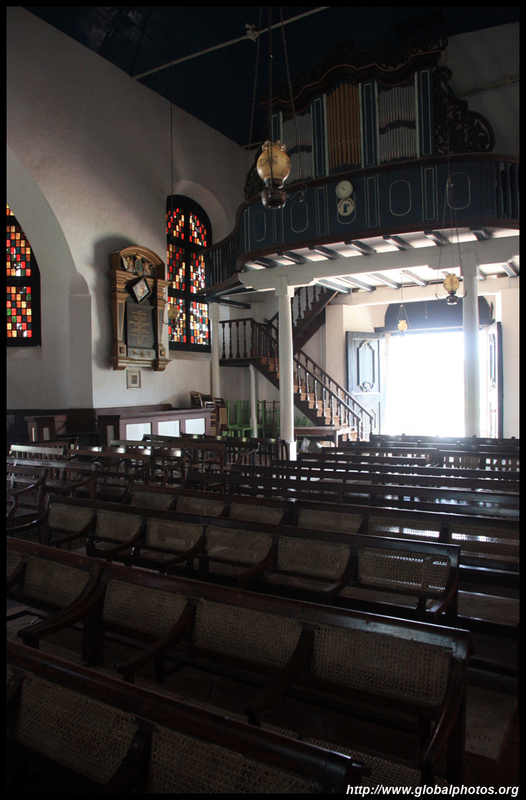 The Dutch Reformed Church is the oldest Protestant church in the country and dates from the 18th century. 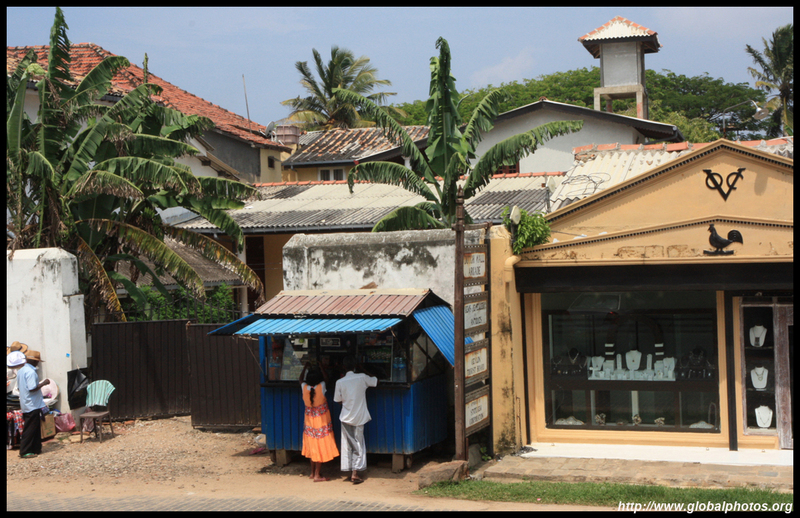 This dilapidated small building is a post office, where you can buy cheap postcards and mail them home. 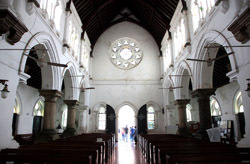 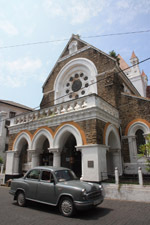 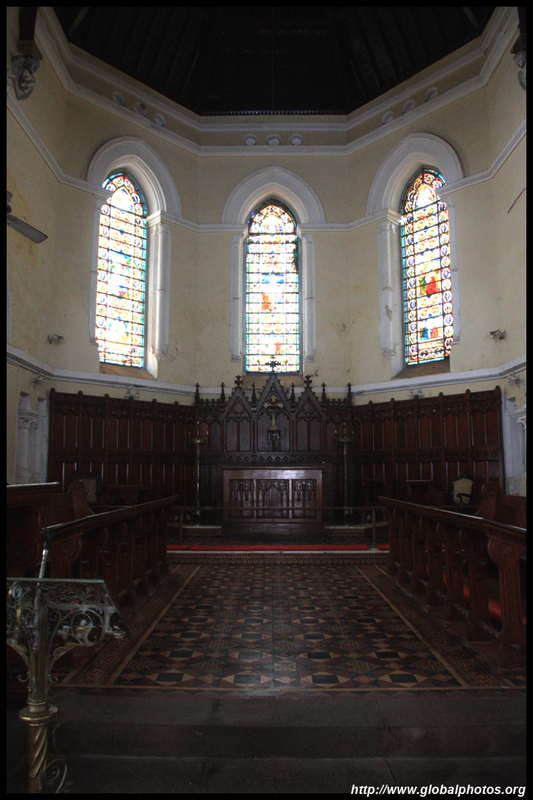 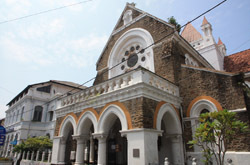 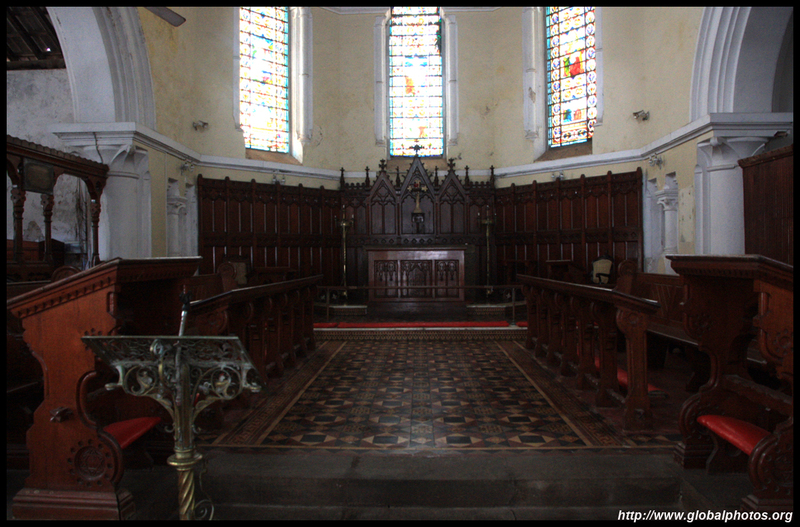 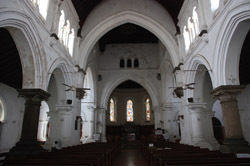 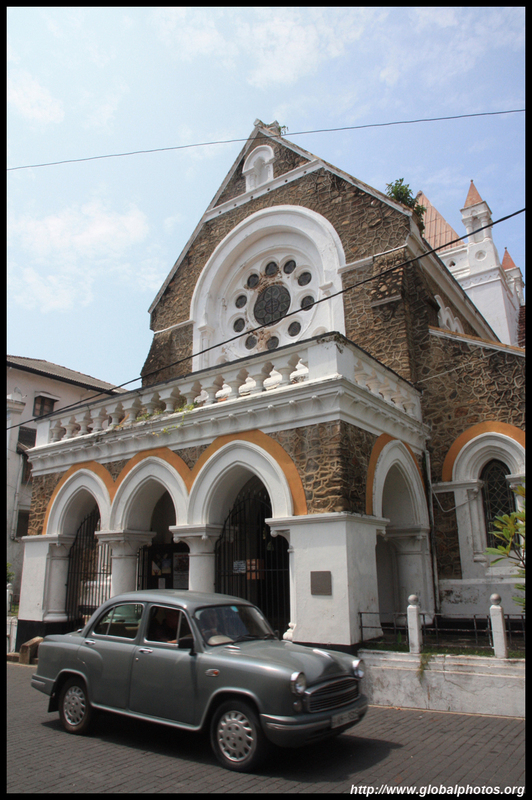 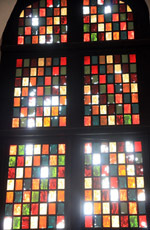 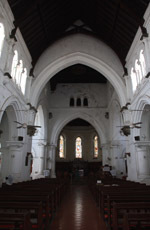 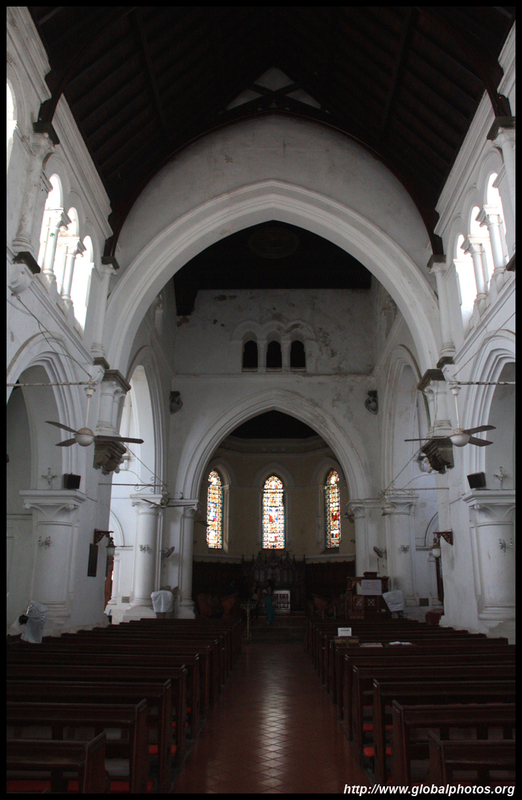 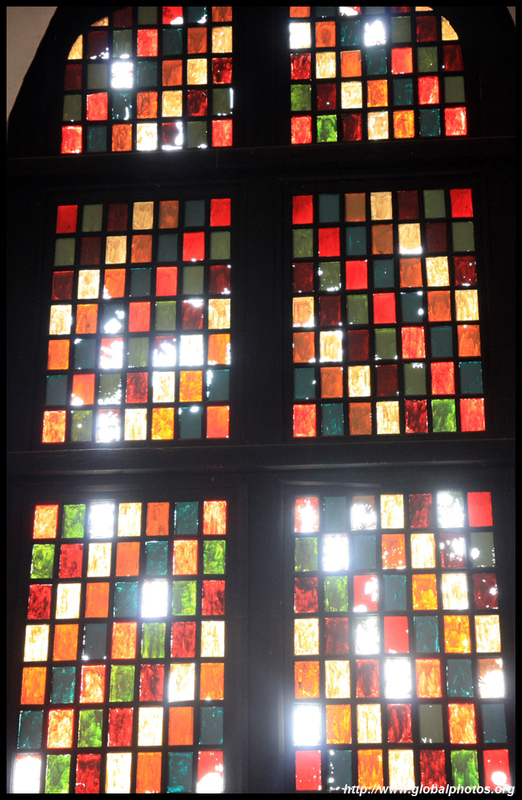 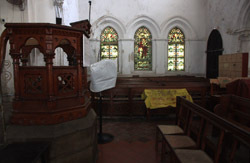 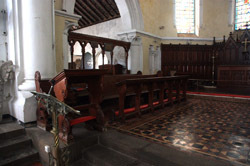 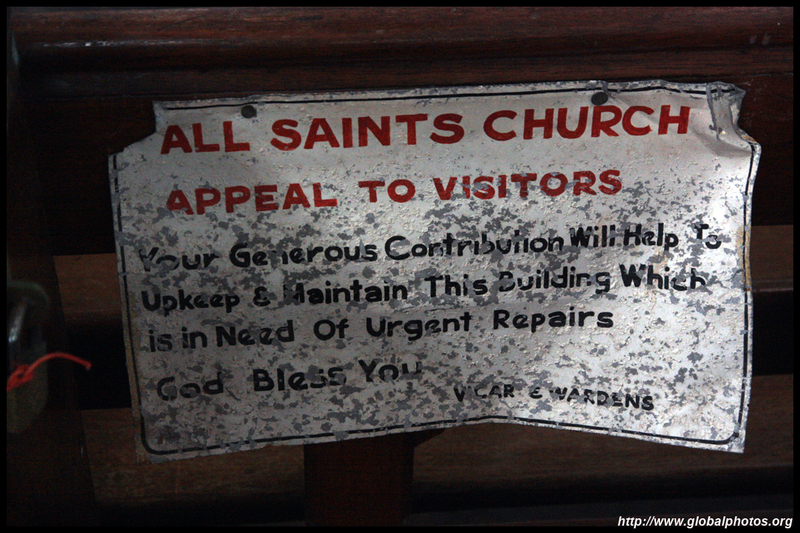 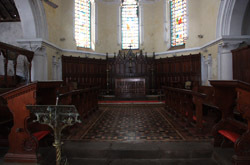 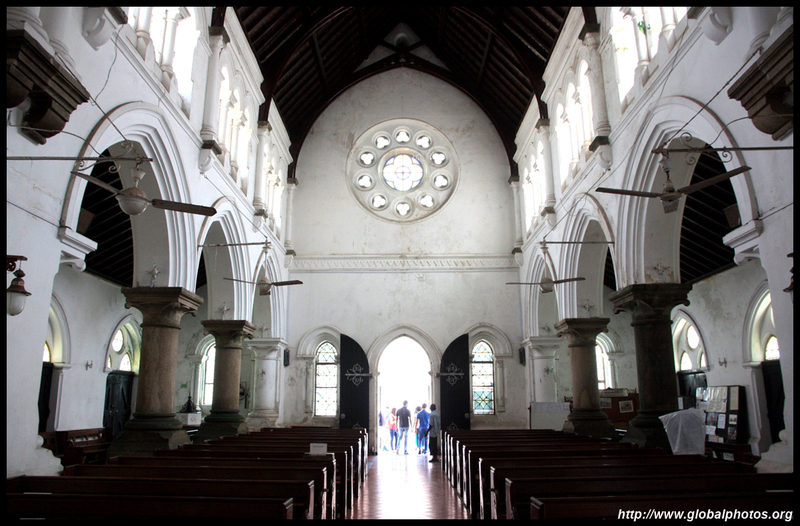 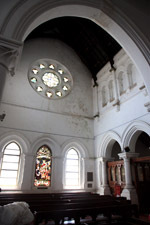 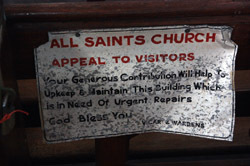 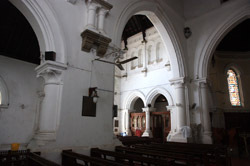 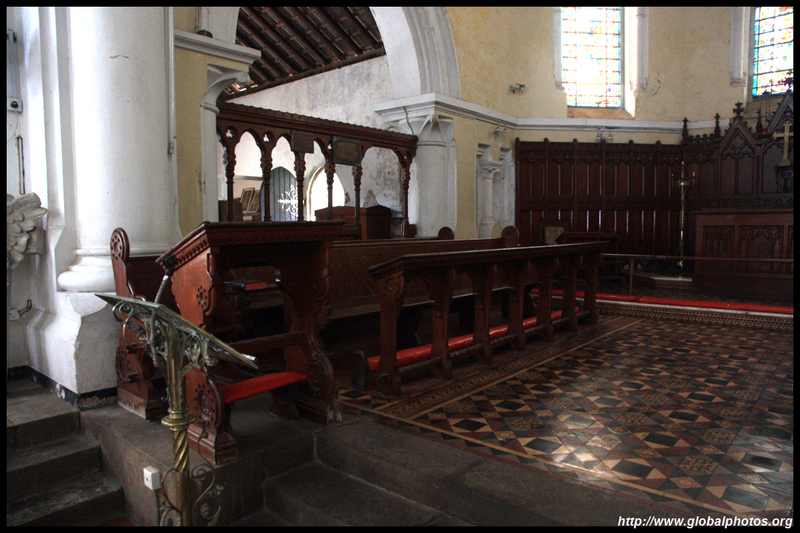 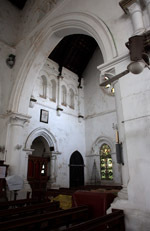 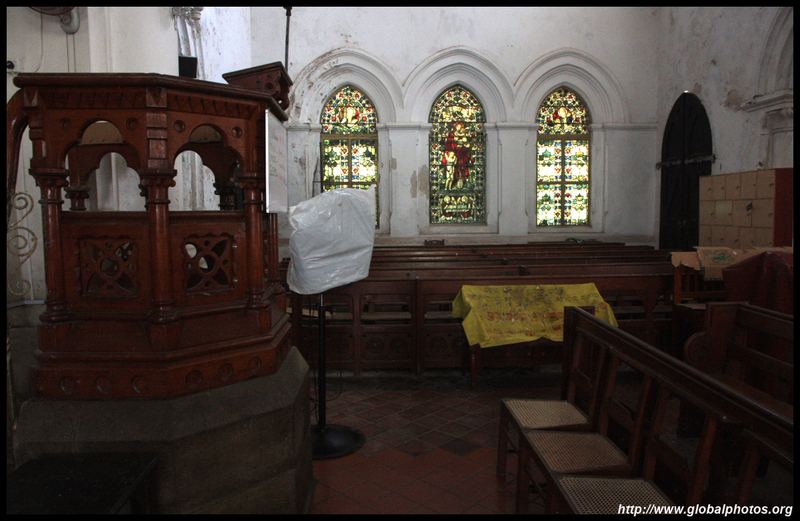 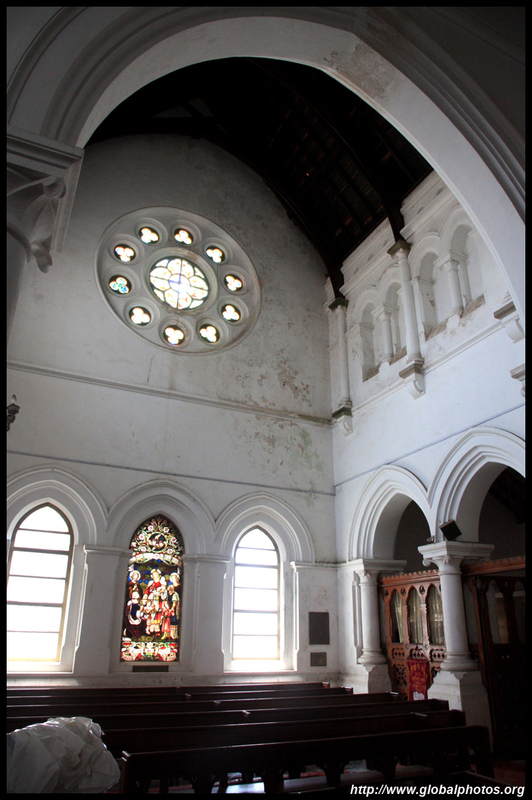 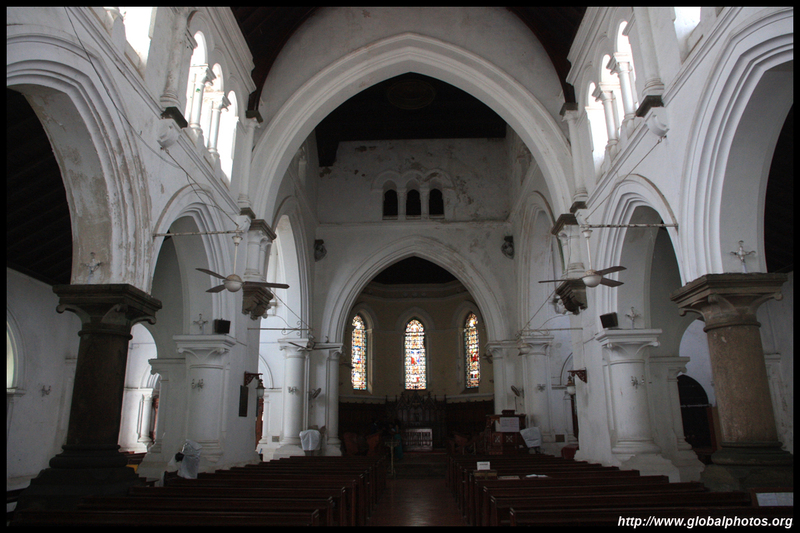 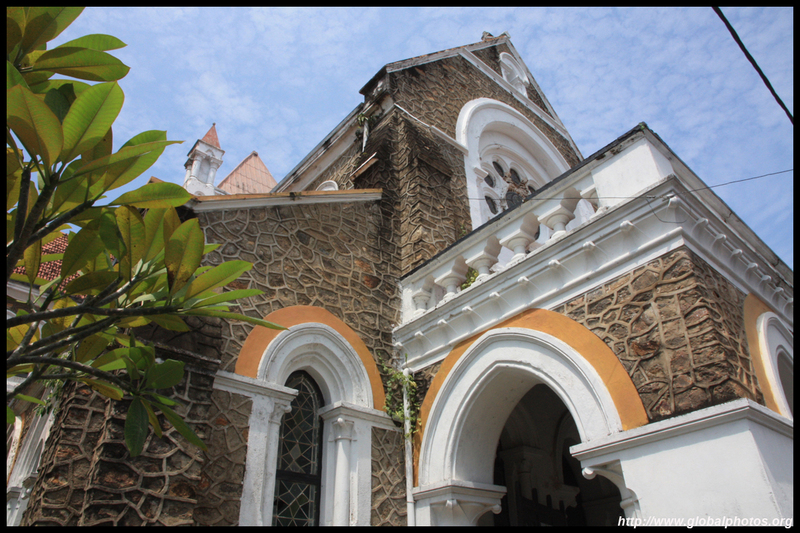 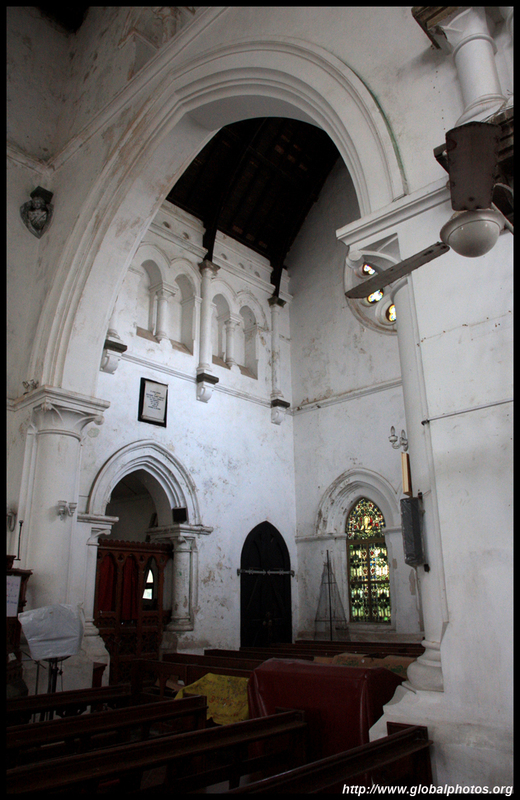 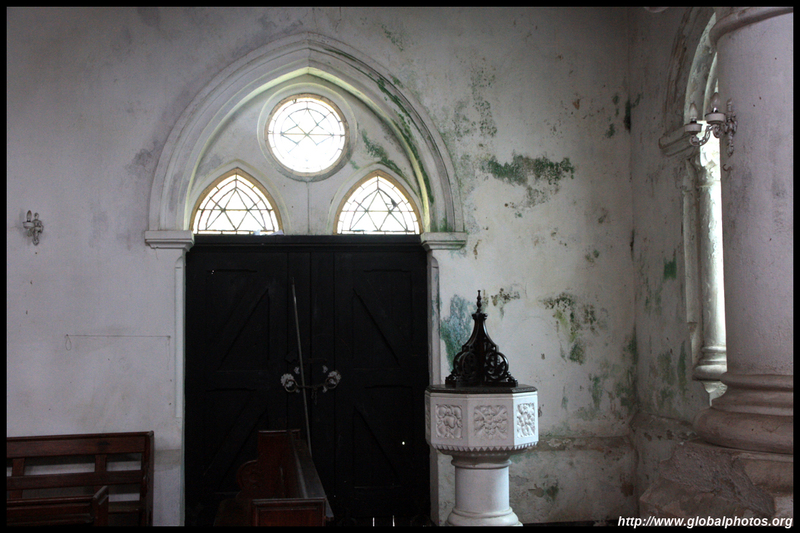 All Saints Church was built in the Victorian Gothic Revival style and was consecrated in 1871. 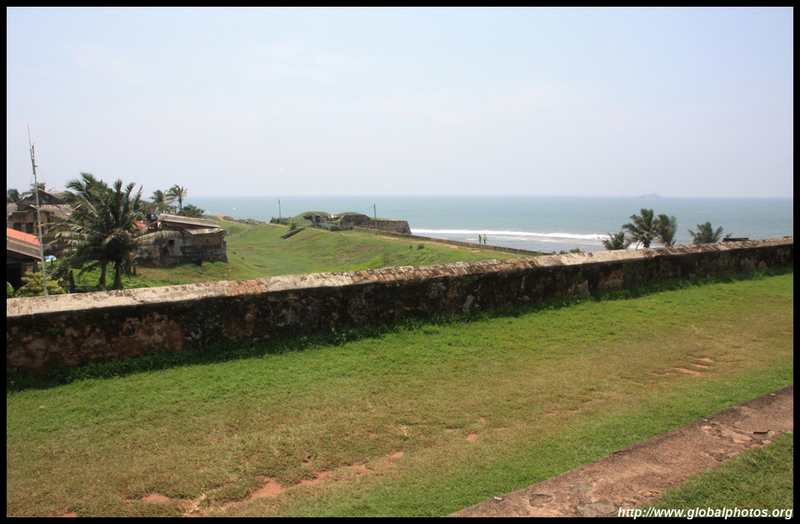 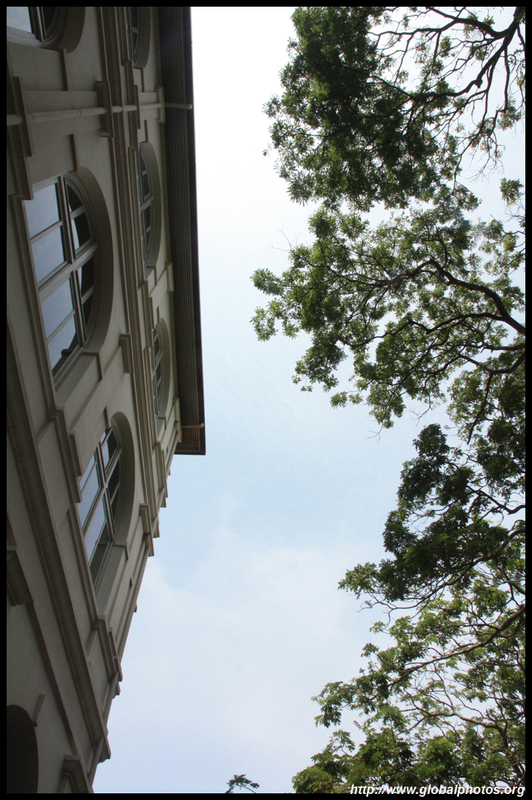 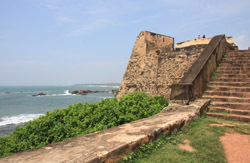 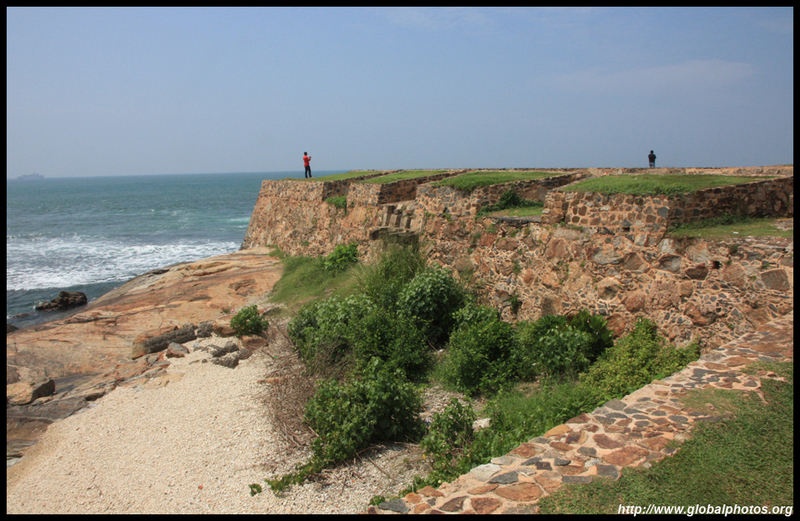 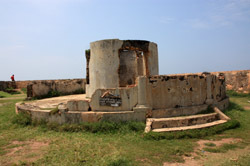 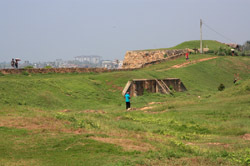 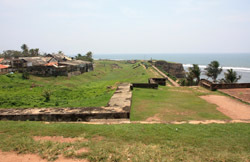 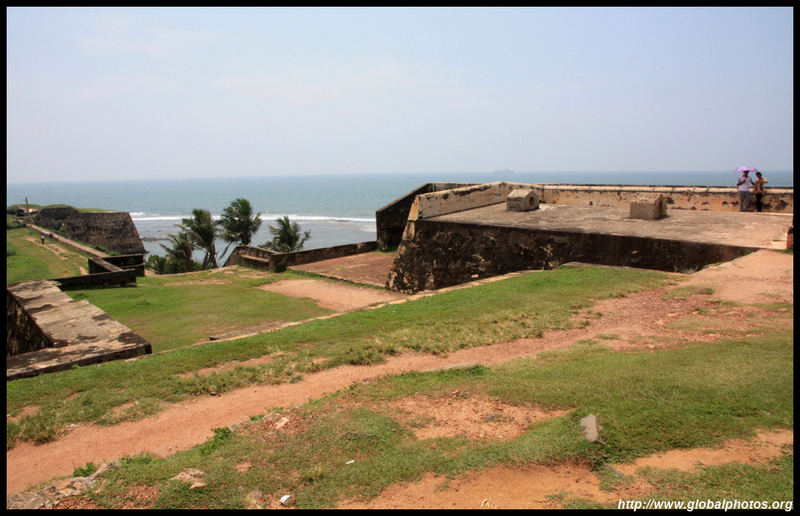 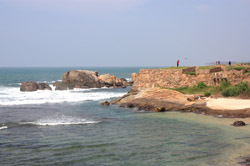 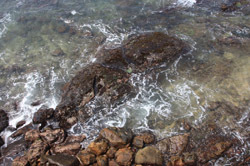 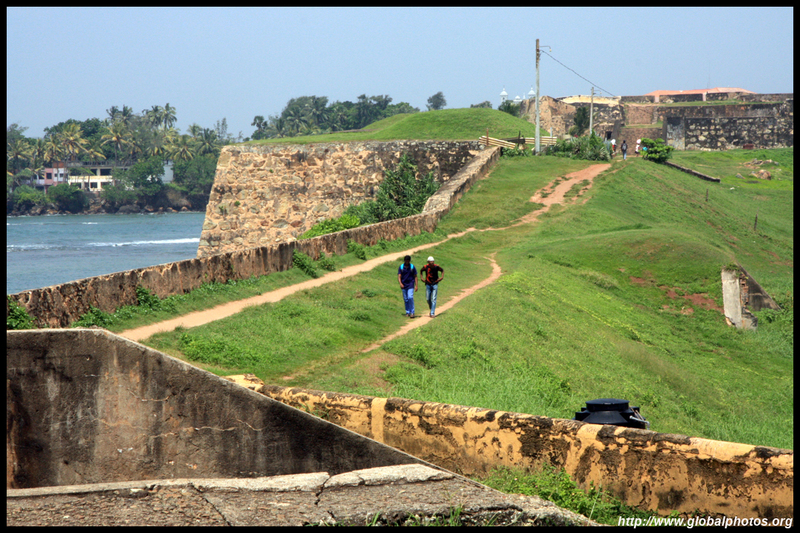 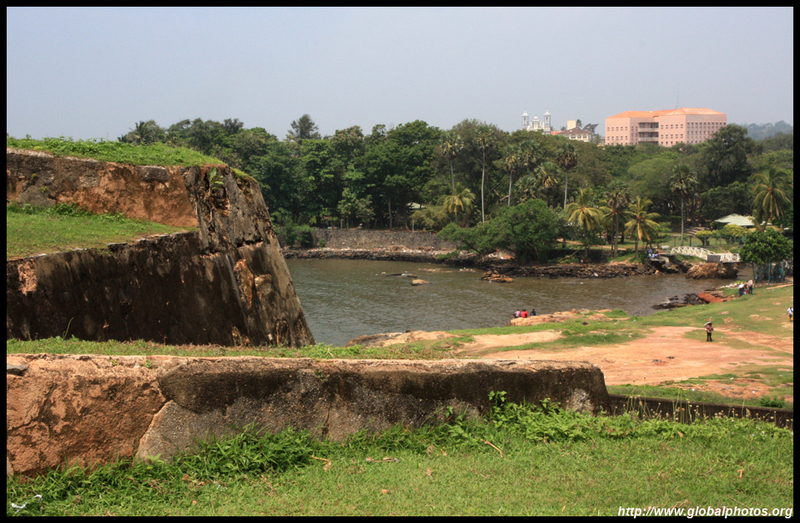 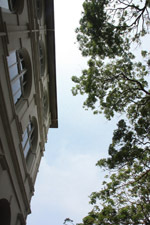 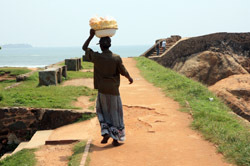 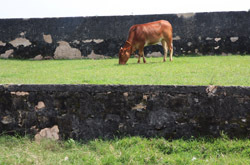 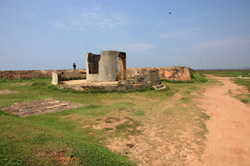 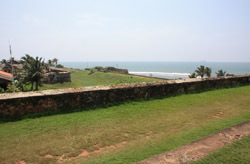 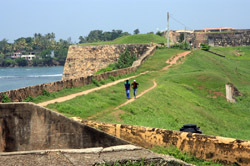 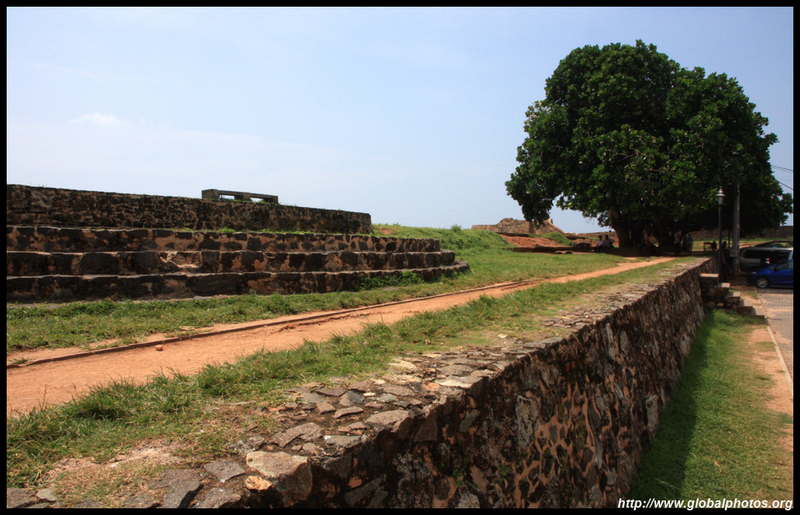 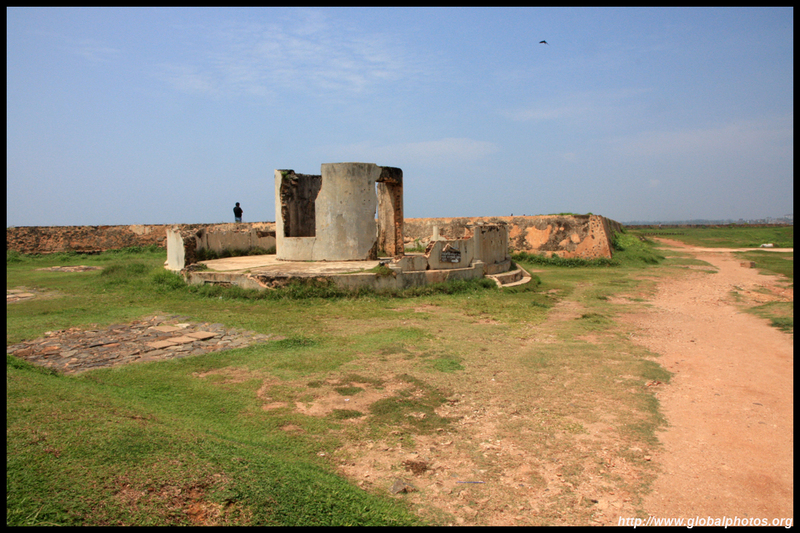 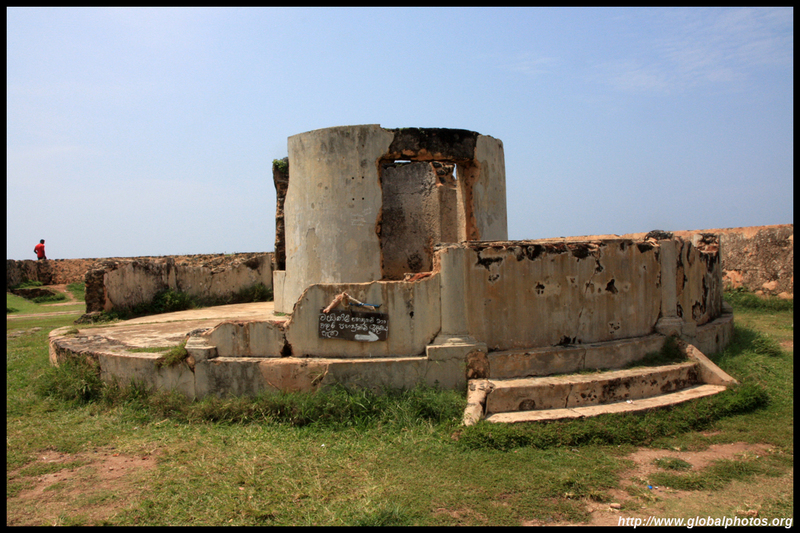 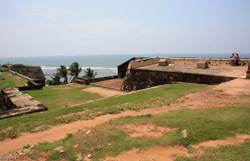 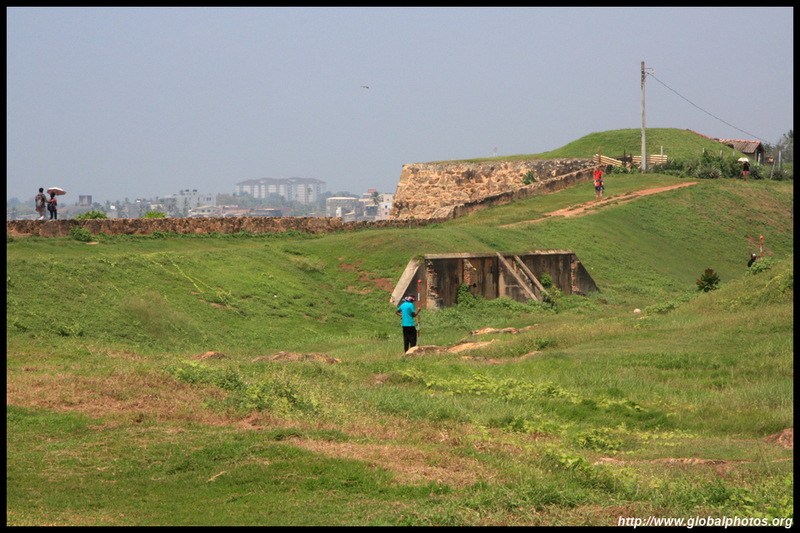 The fort's rampants are walkable today and offer lovely views of the ocean and the historic buildings within. 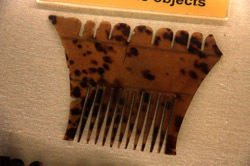 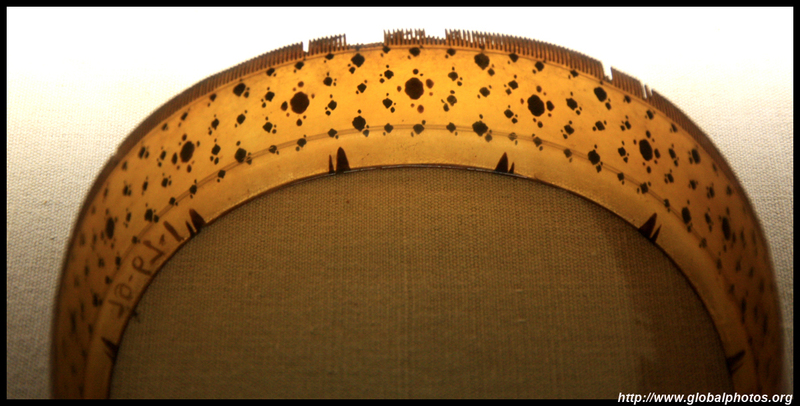 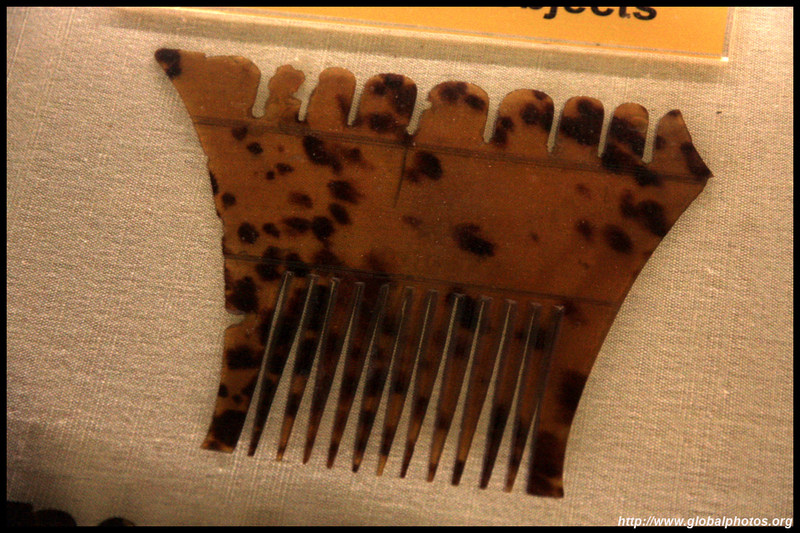 While the Dutch intended to use this to repel invaders, it also helped prevent major damage during the 2004 tsunami. 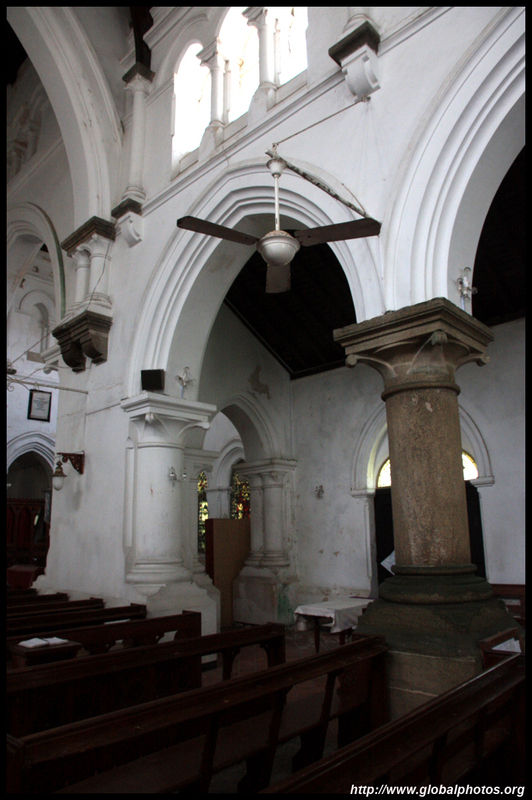 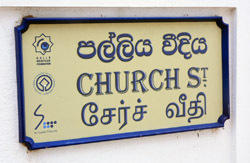 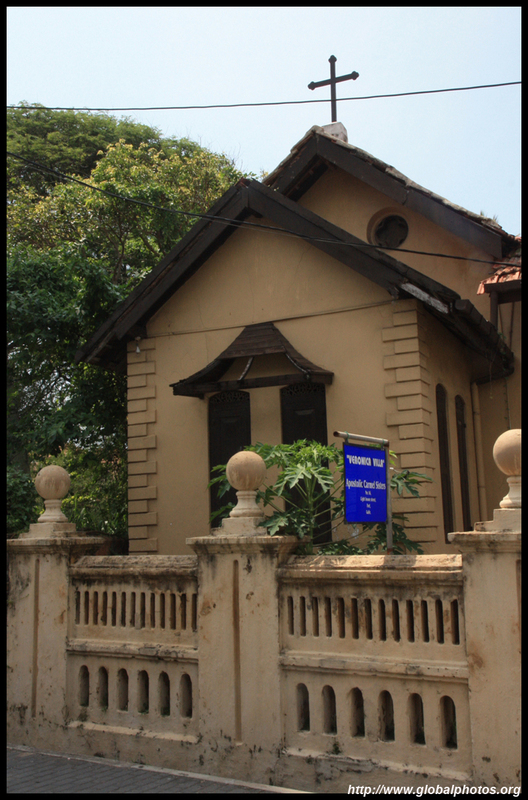 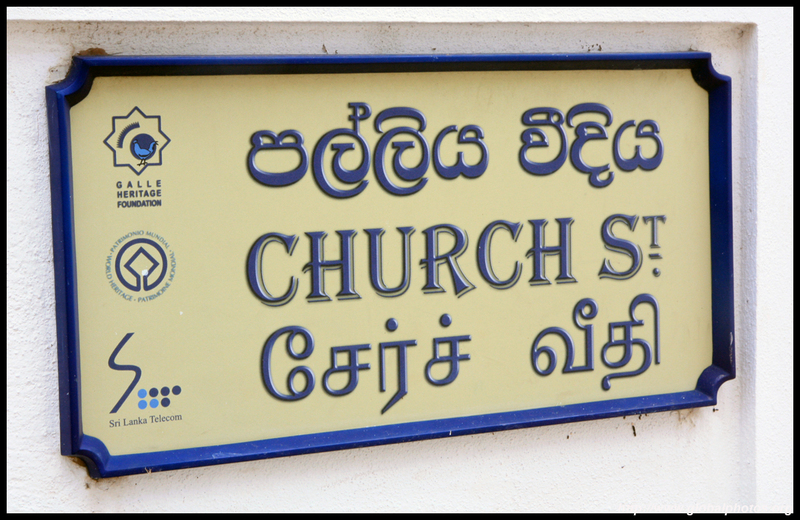 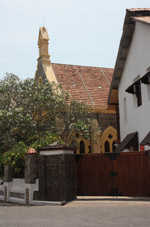 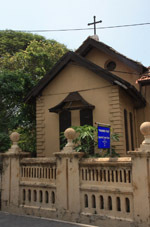 There is space for this mosque to co-exist with the Christian churches nearby. 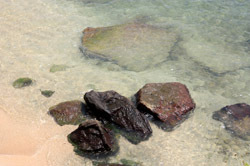 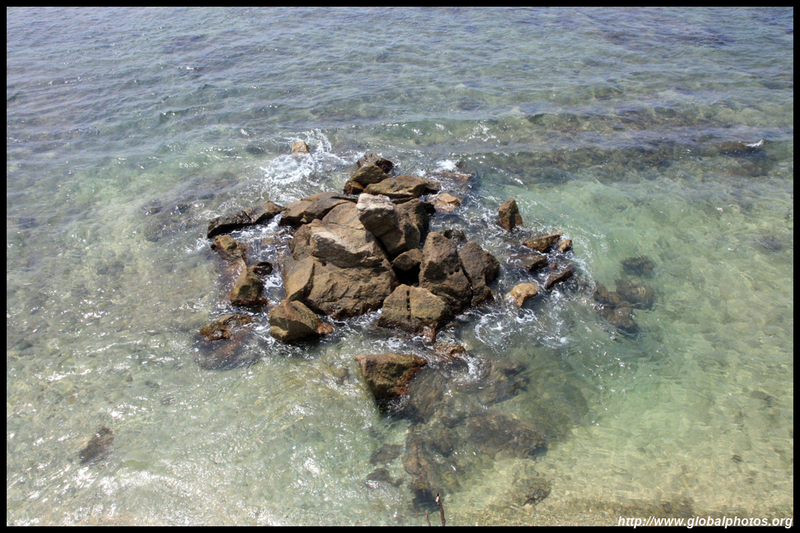 Beyond these rocks, an hour away by plane, is the tropical paradise called the Maldives. 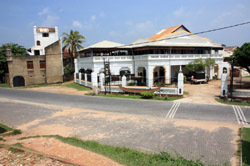 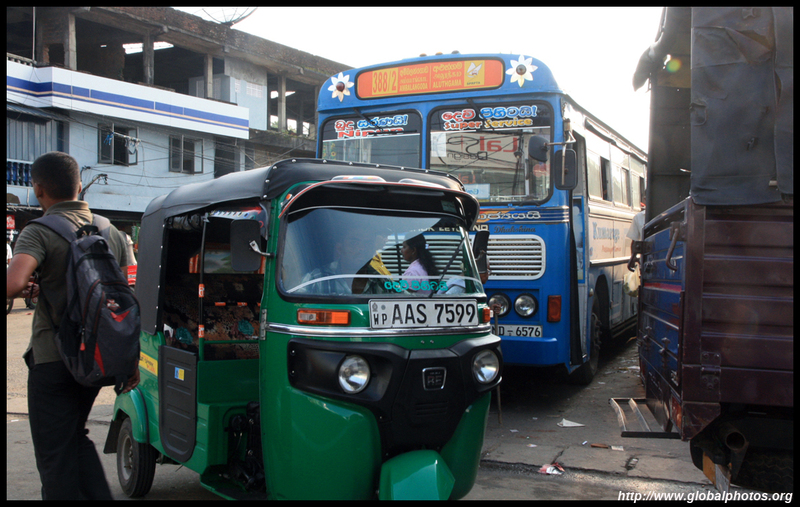 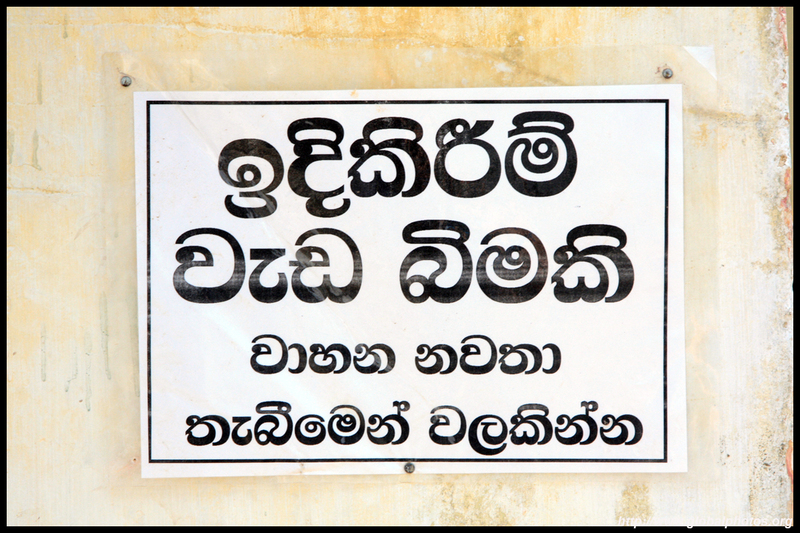 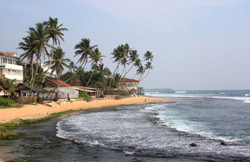 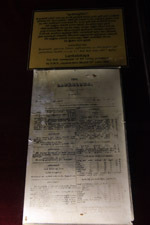 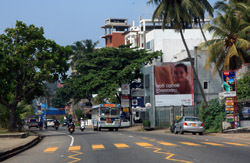 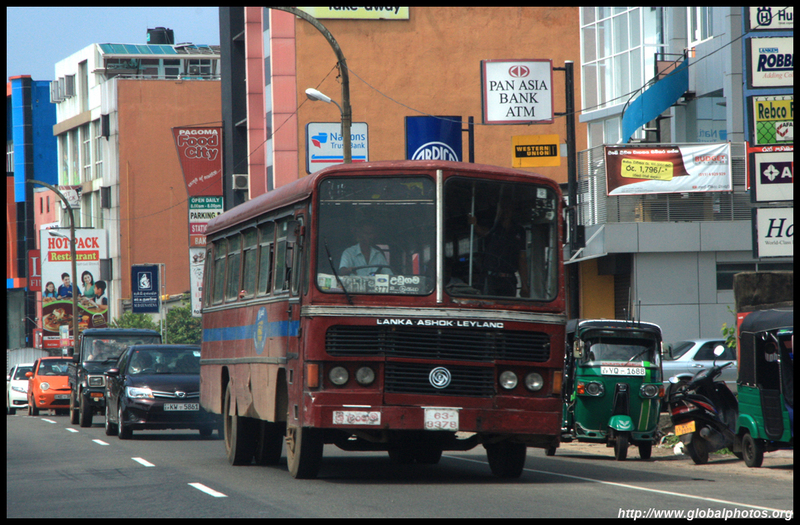 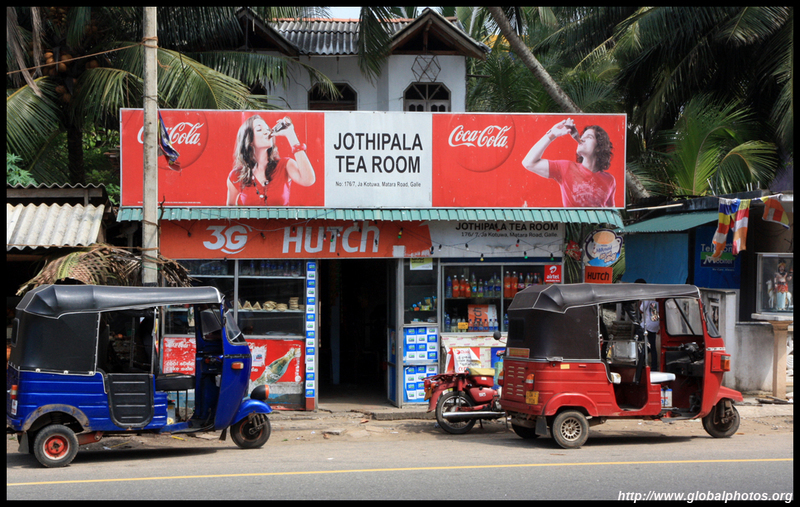 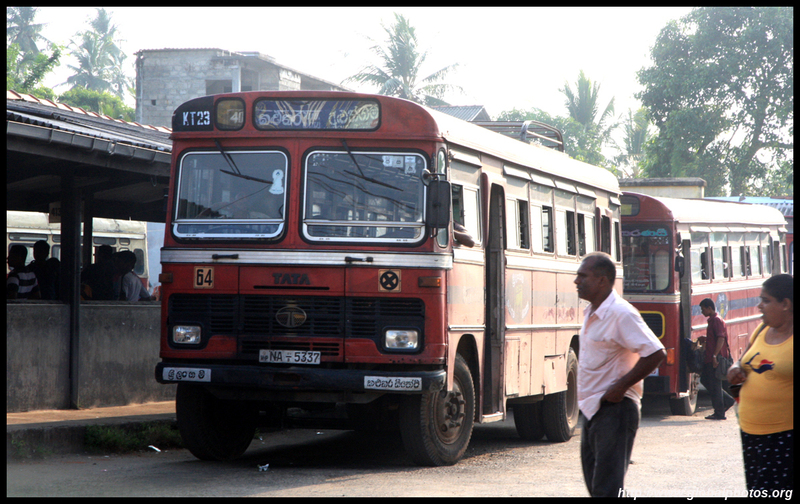 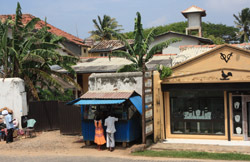 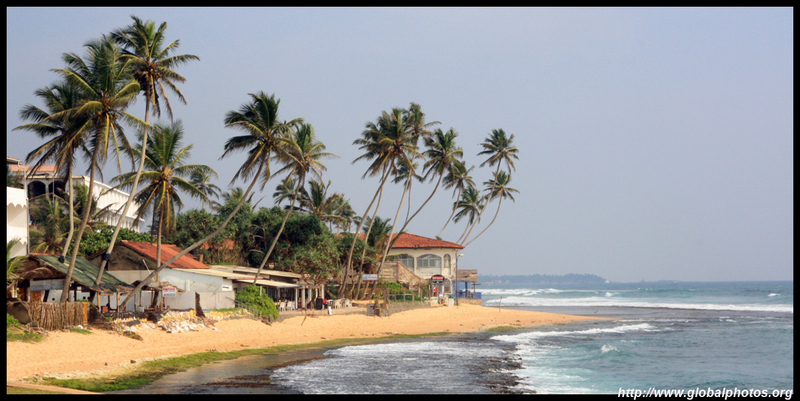 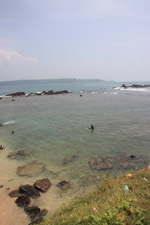 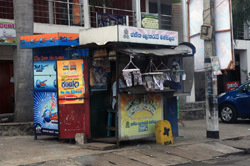 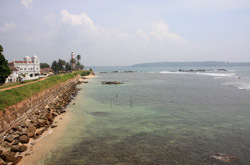 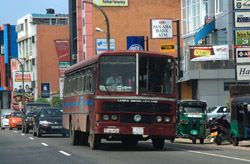 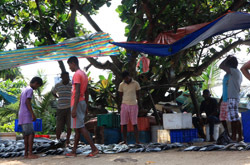 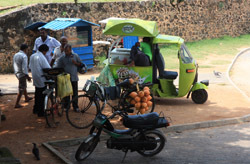 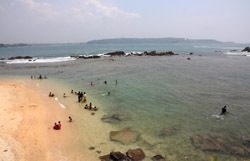 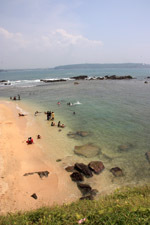 Backpackers can take a train from Colombo to Galle. 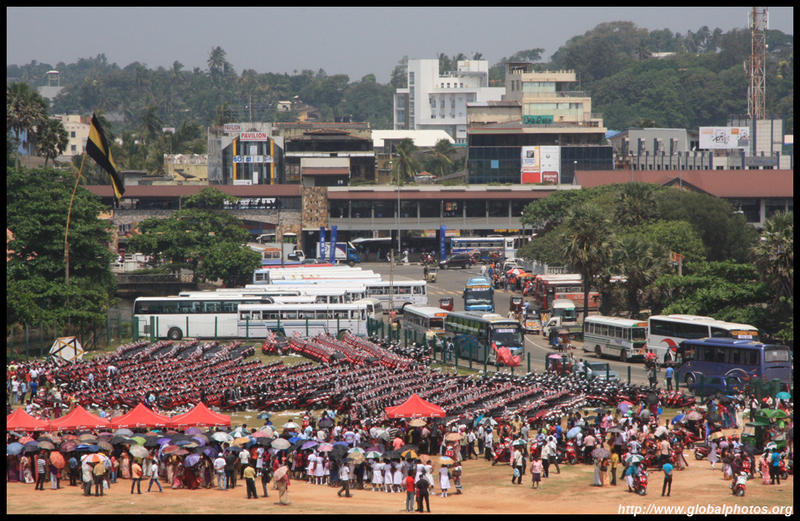 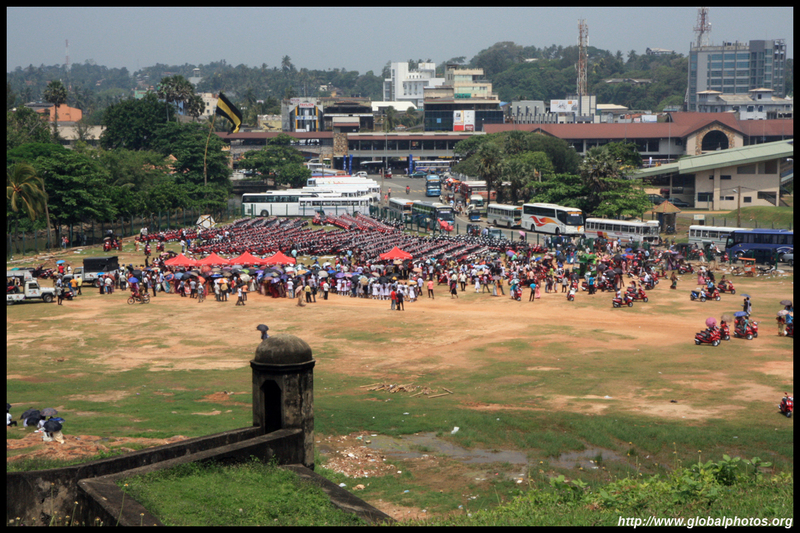 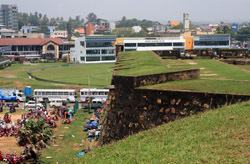 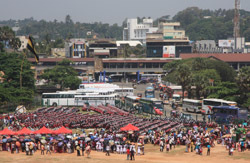 The train station is very near the old fort behind the buses in this photo. 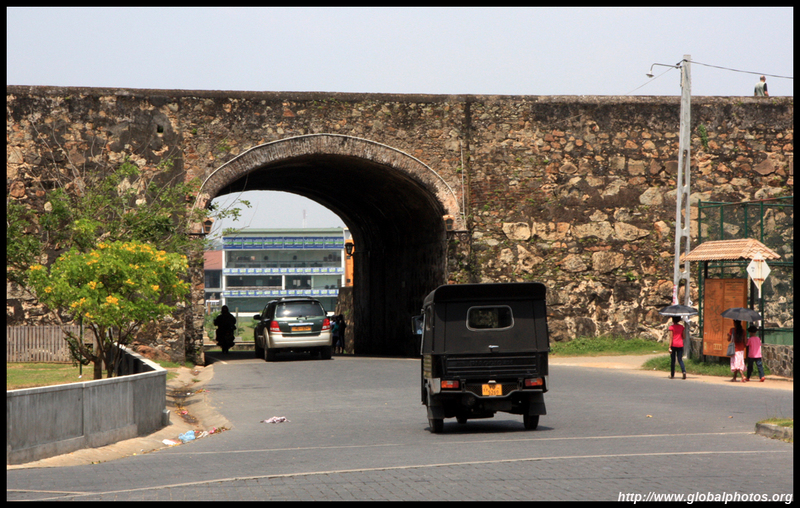 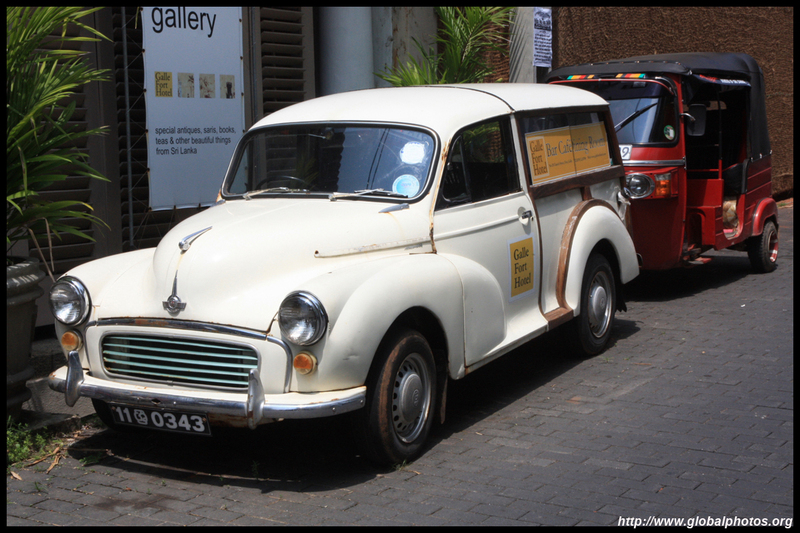 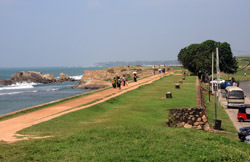 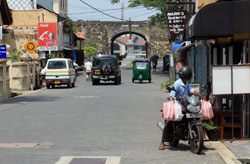 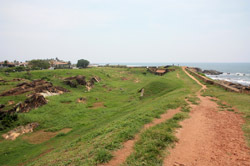 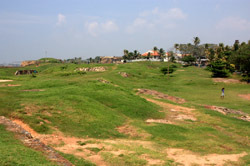 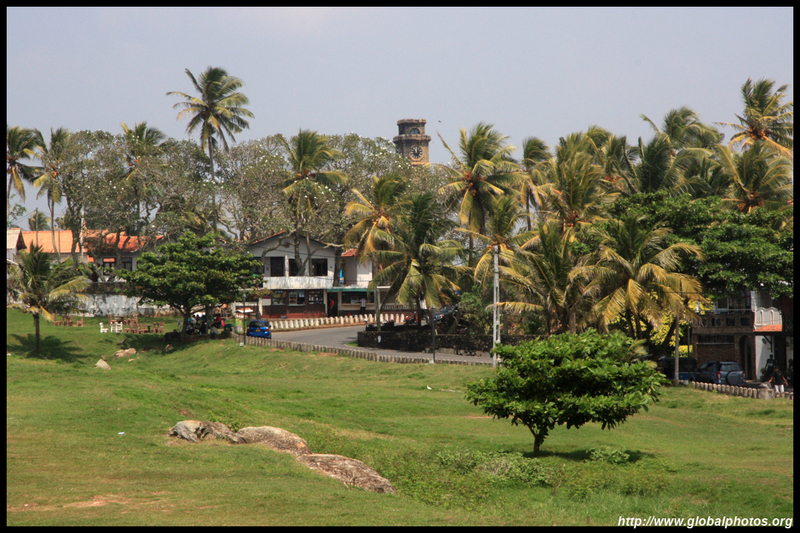 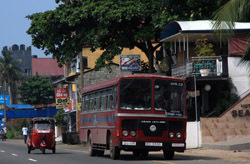 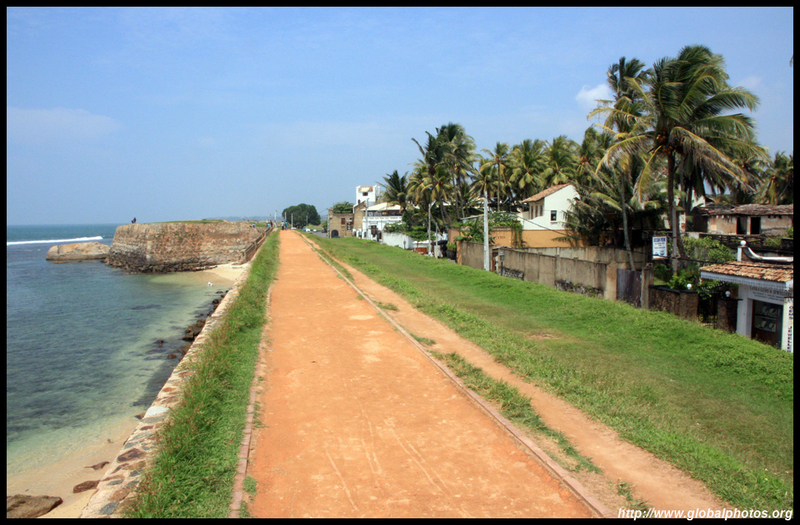 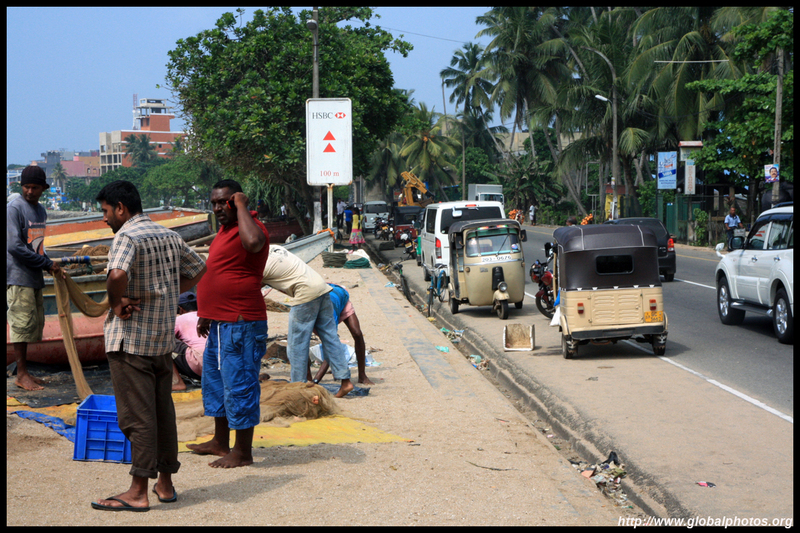 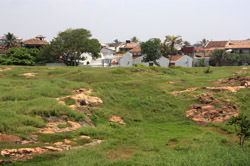 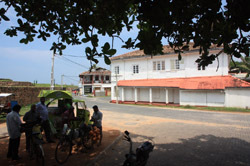 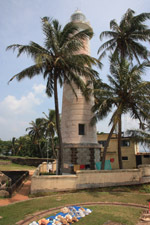 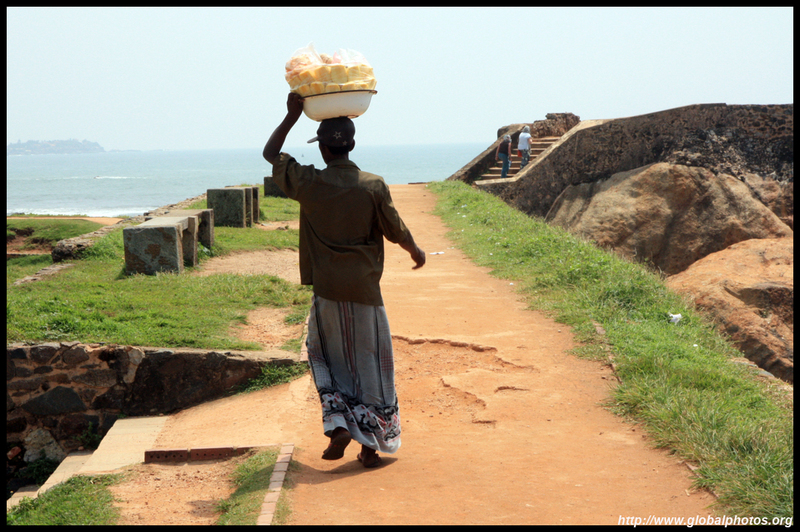 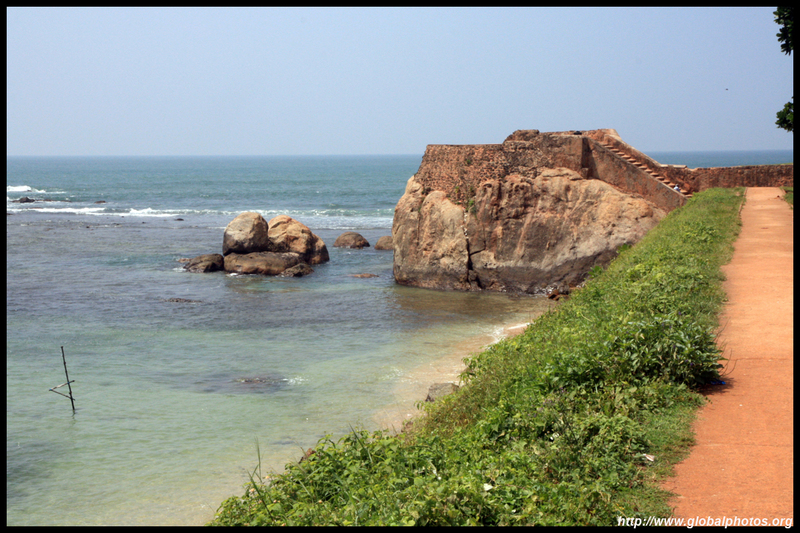 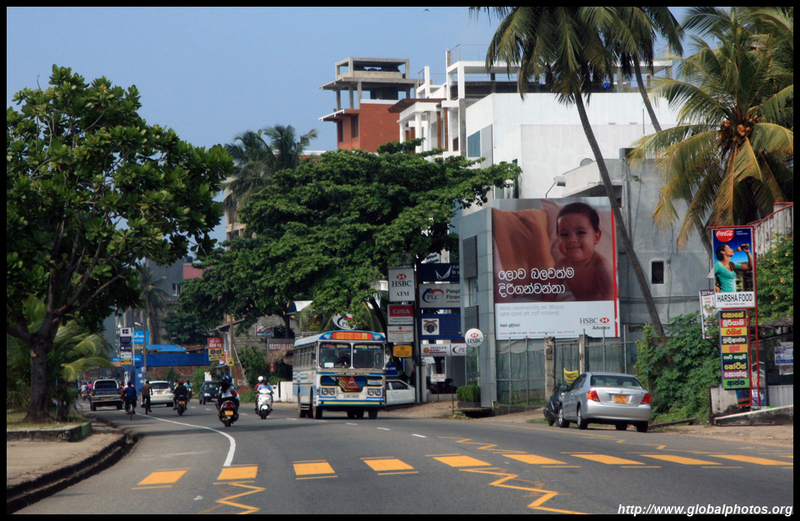 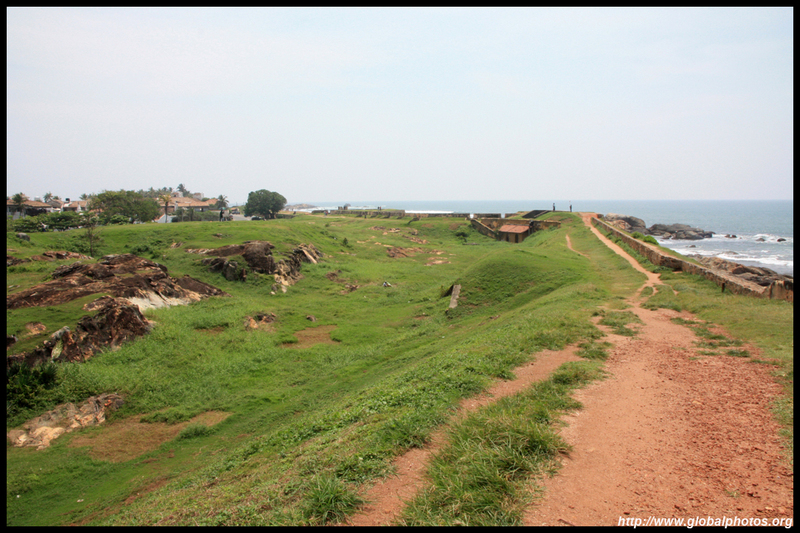 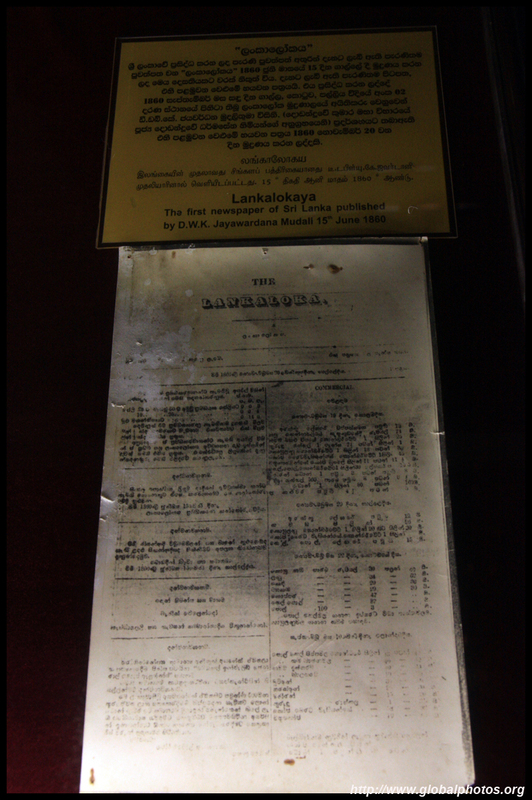 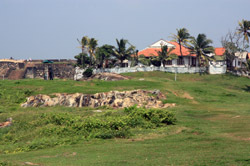 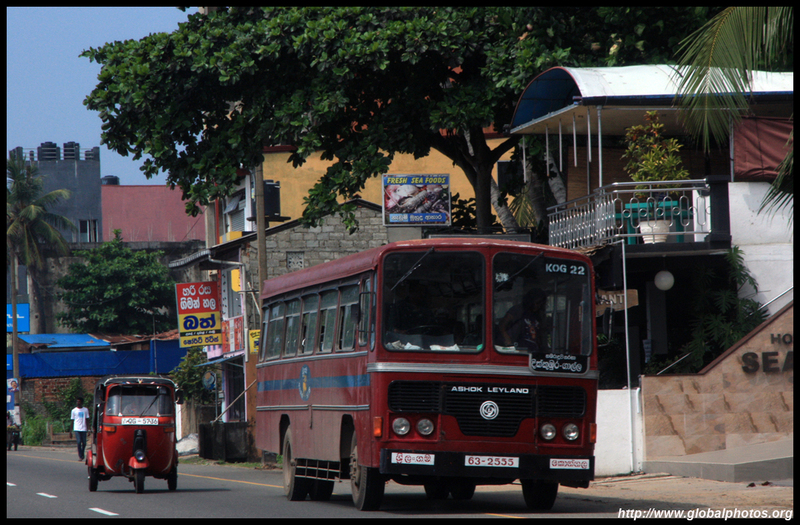 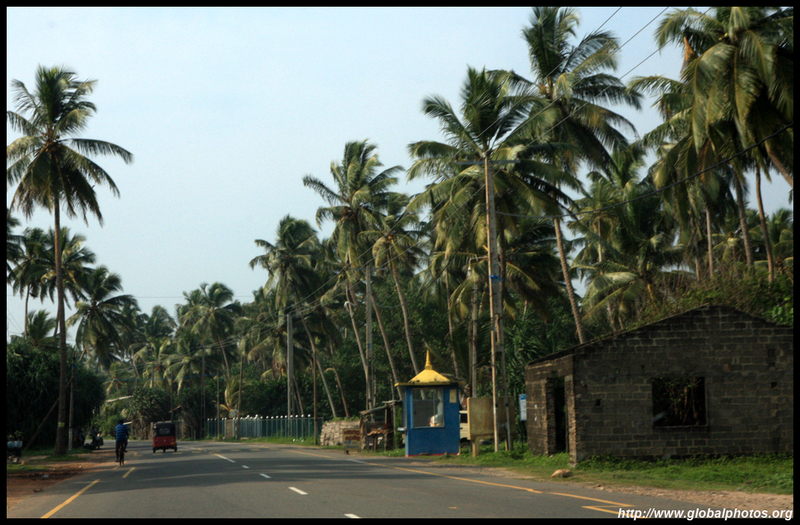 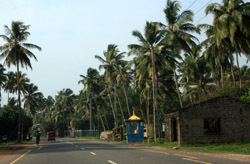 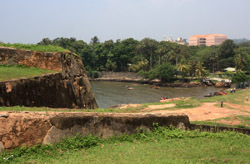 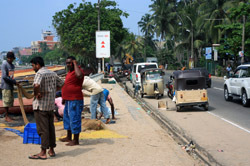 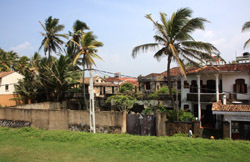 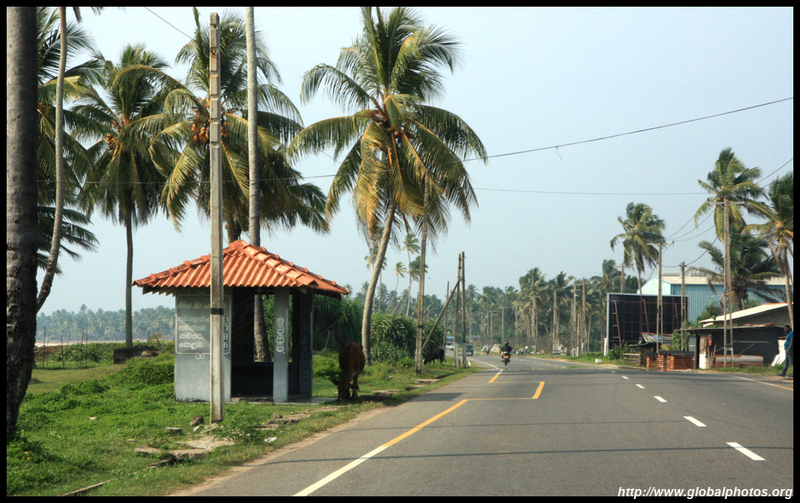 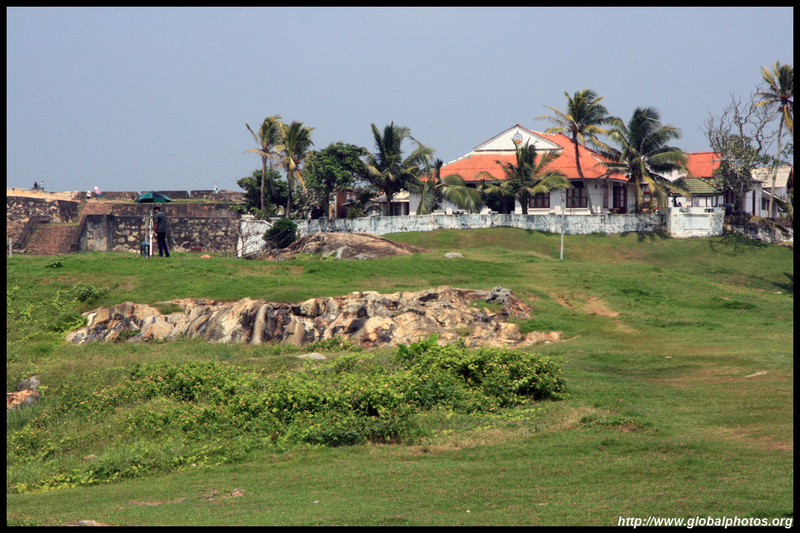 Before the modern highway was built, drivers took the coastal road from Colombo. 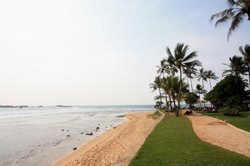 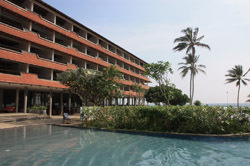 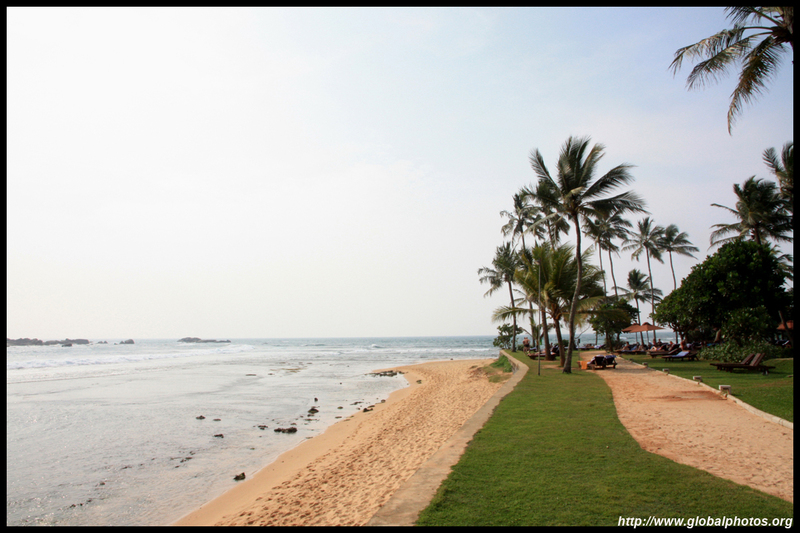 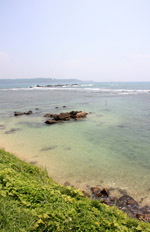 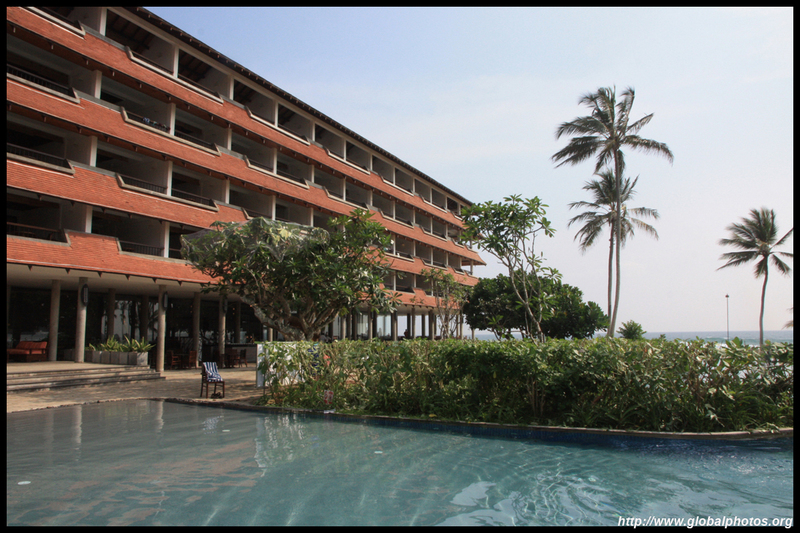 Hikkaduwa has a nice oceanside resort that offers more sea views. 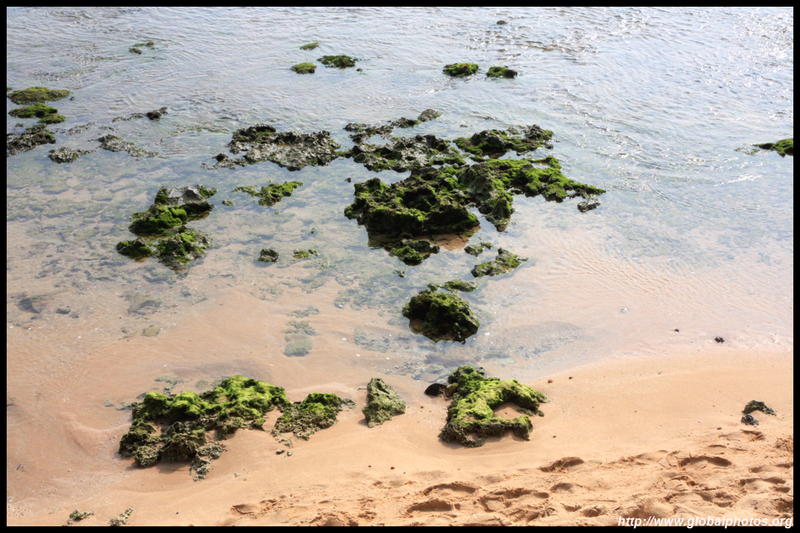 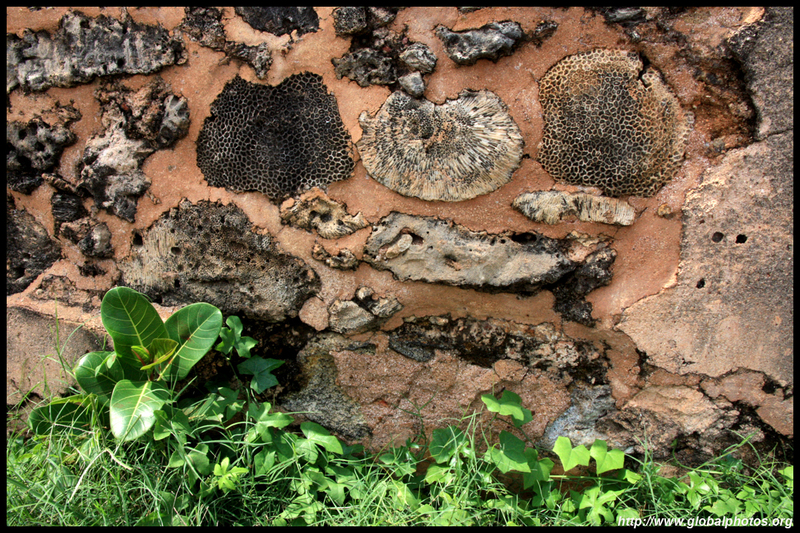 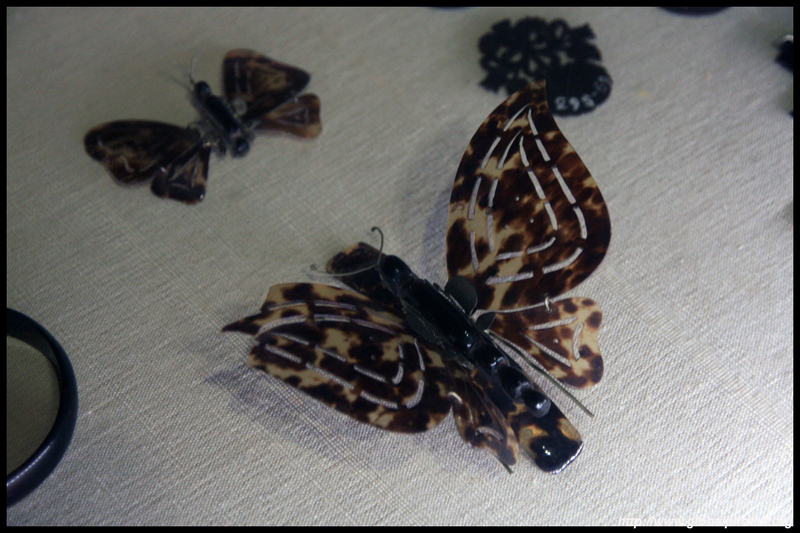 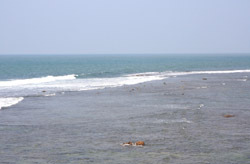 Unfortunately, the corals have been decimated by the tsunami. 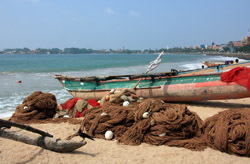 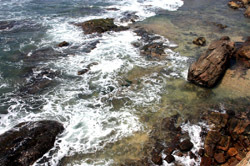 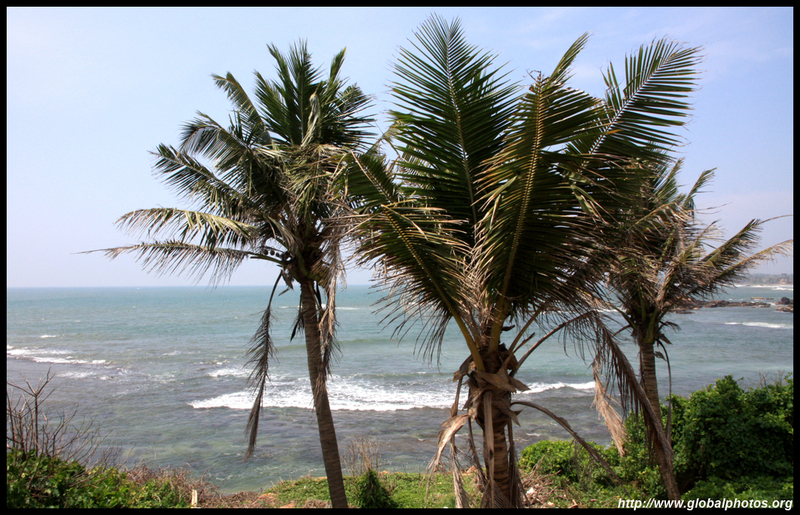 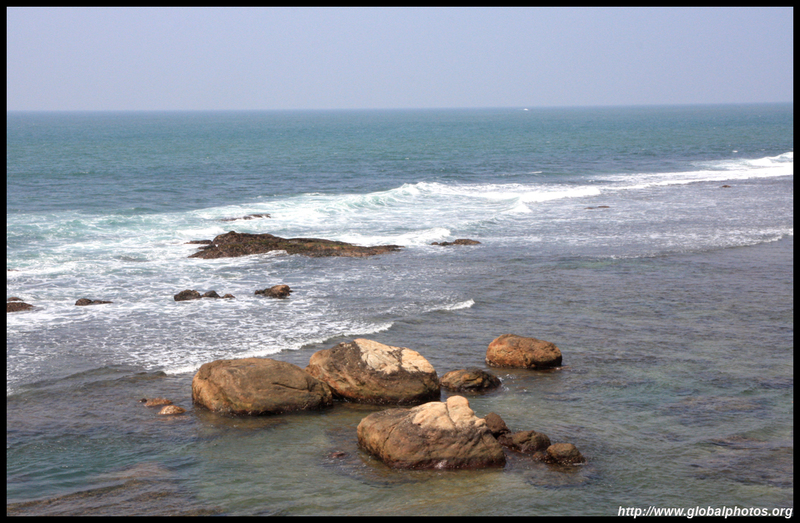 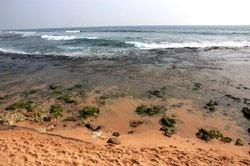 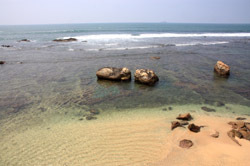 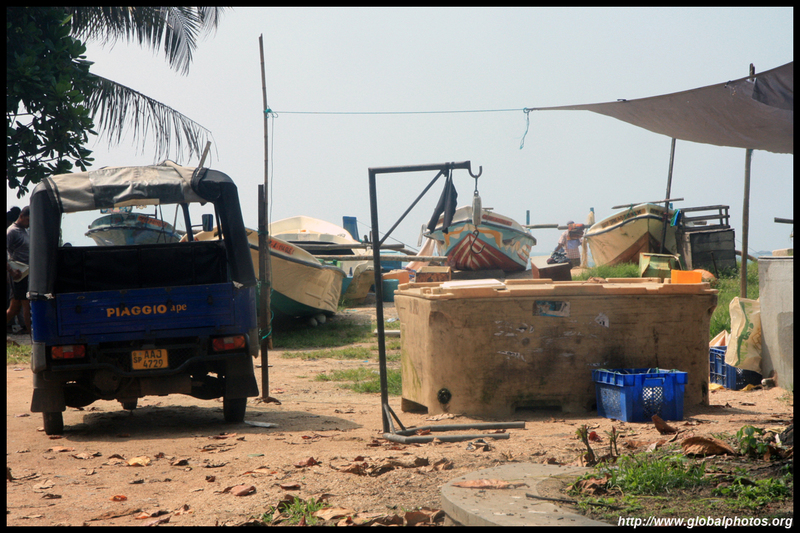 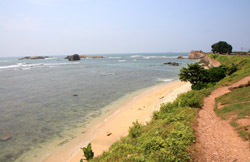 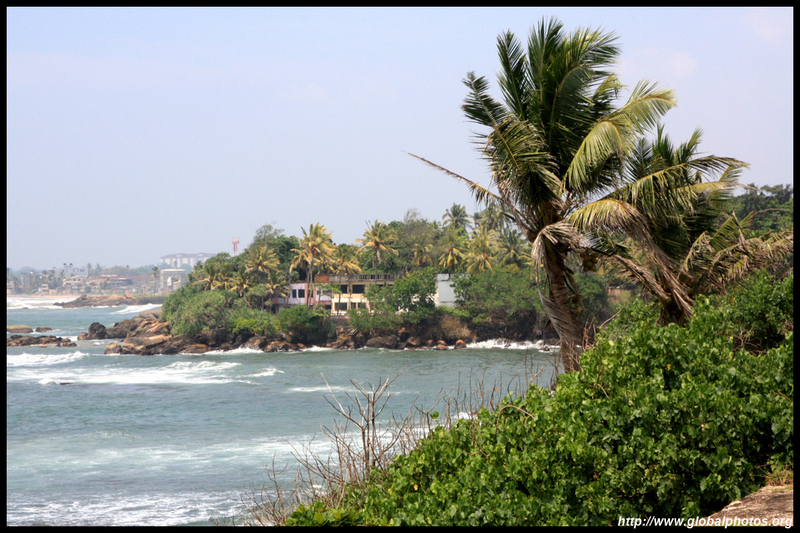 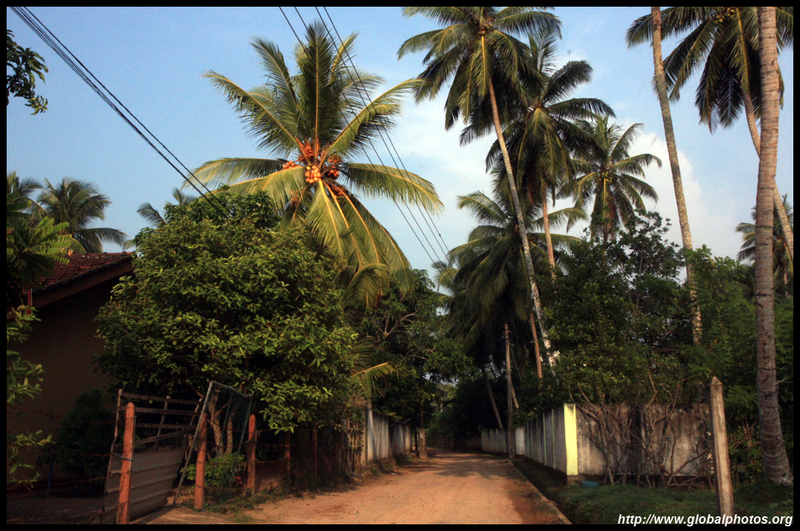 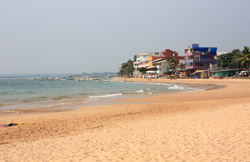 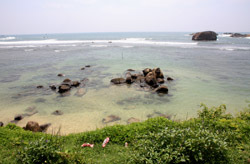 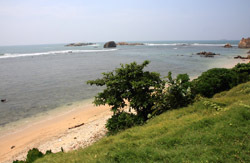 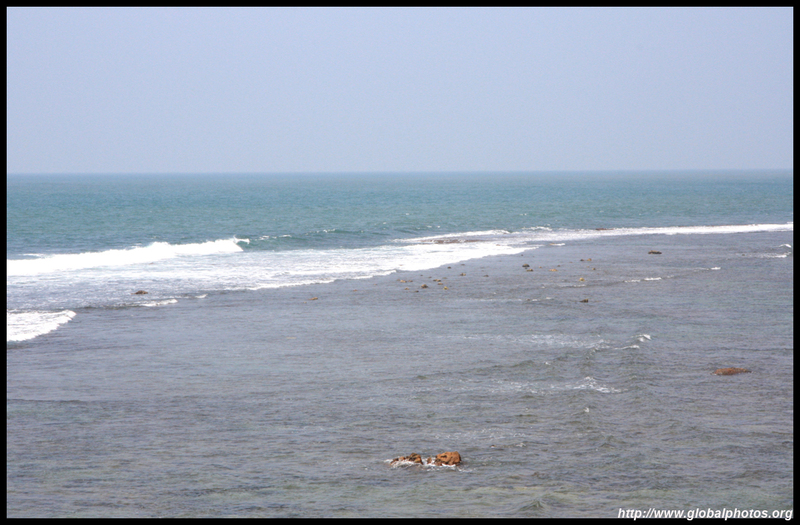 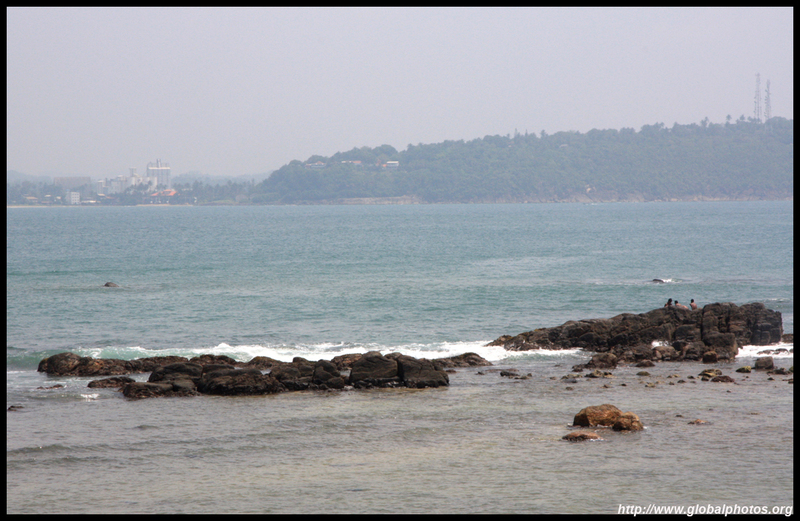 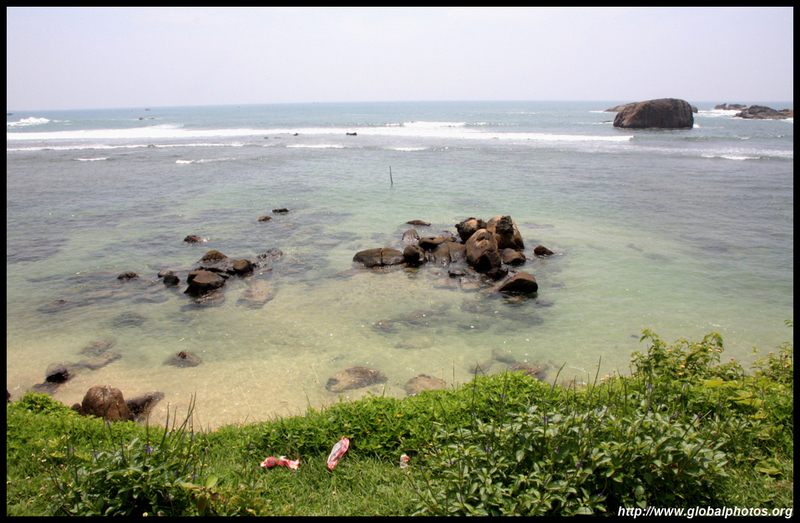 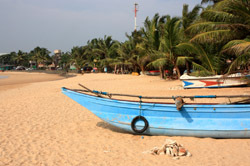 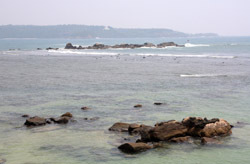 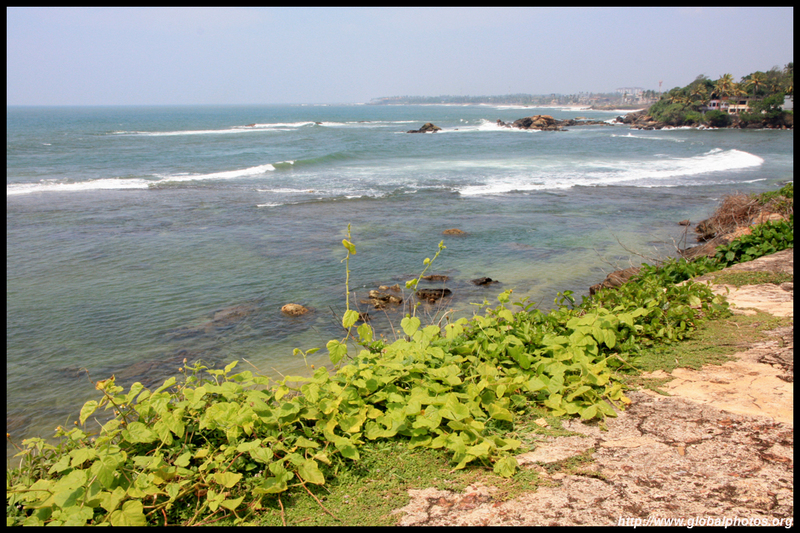 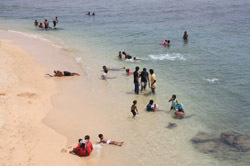 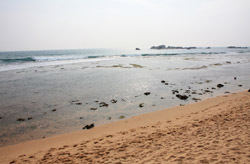 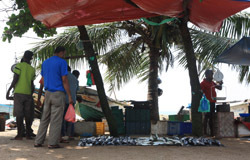 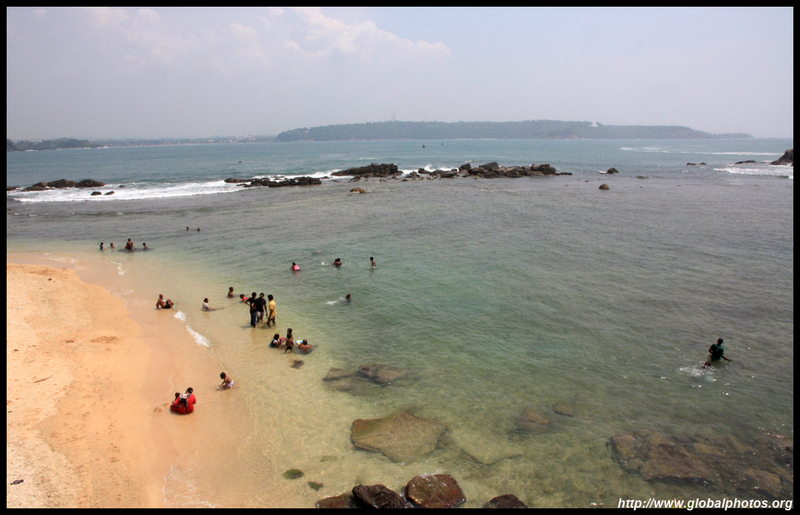 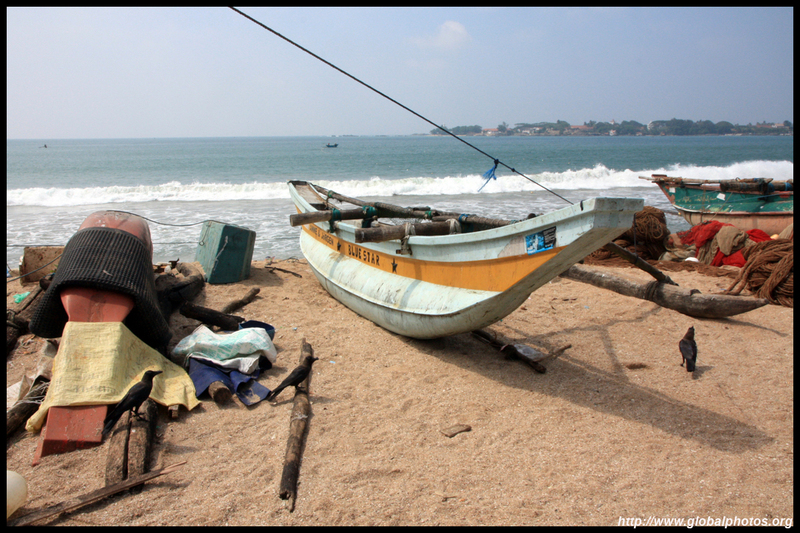 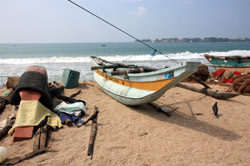 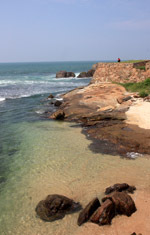 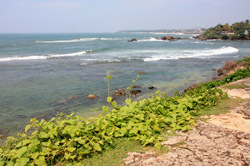 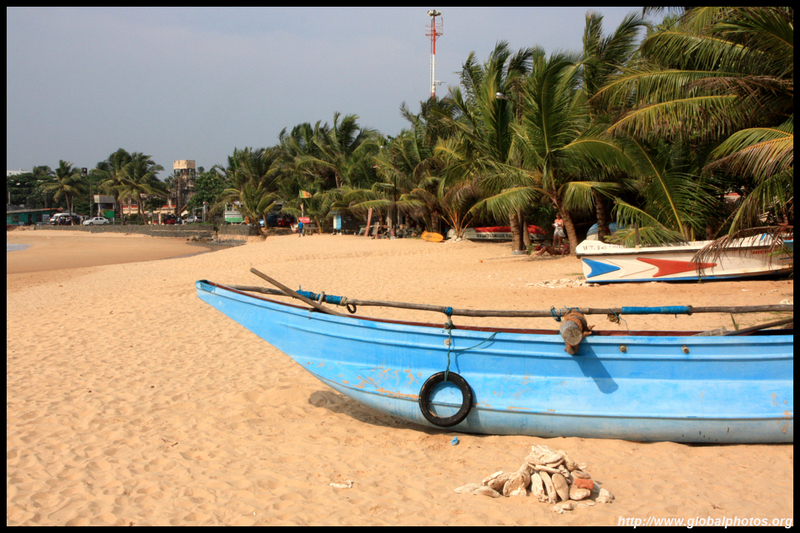 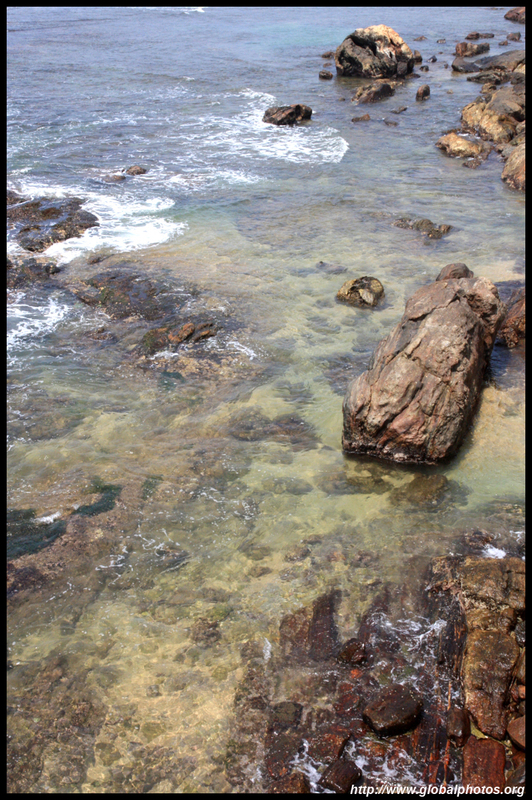 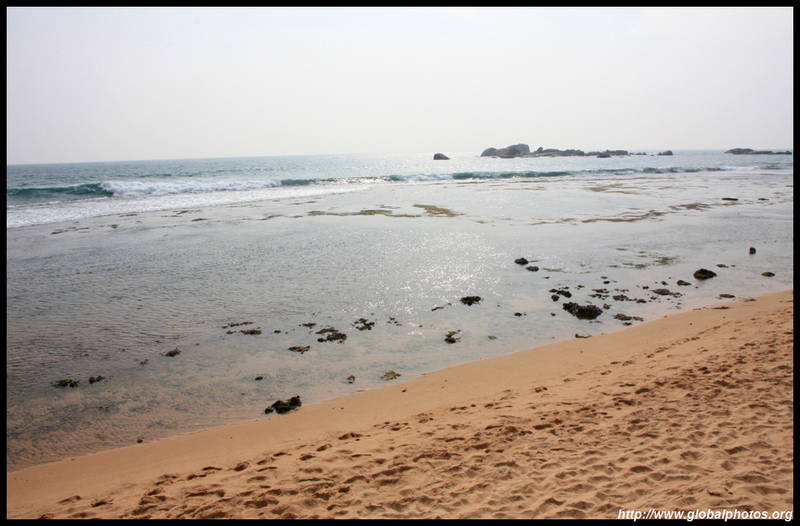 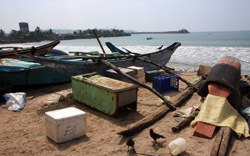 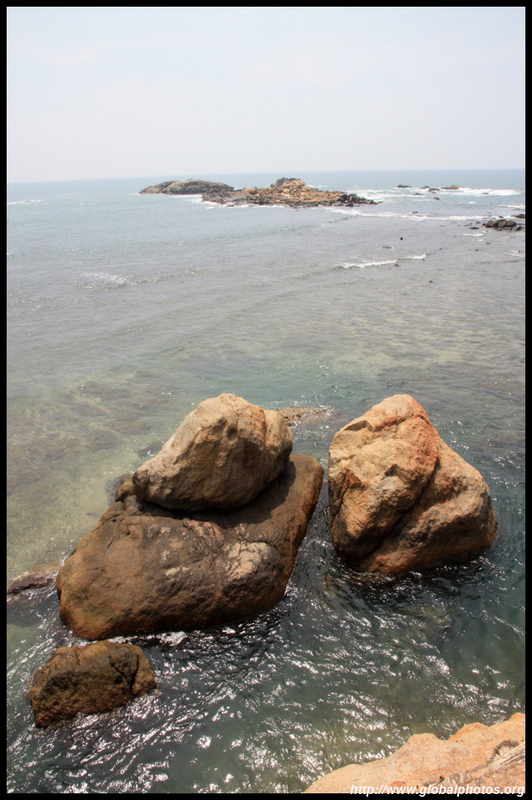 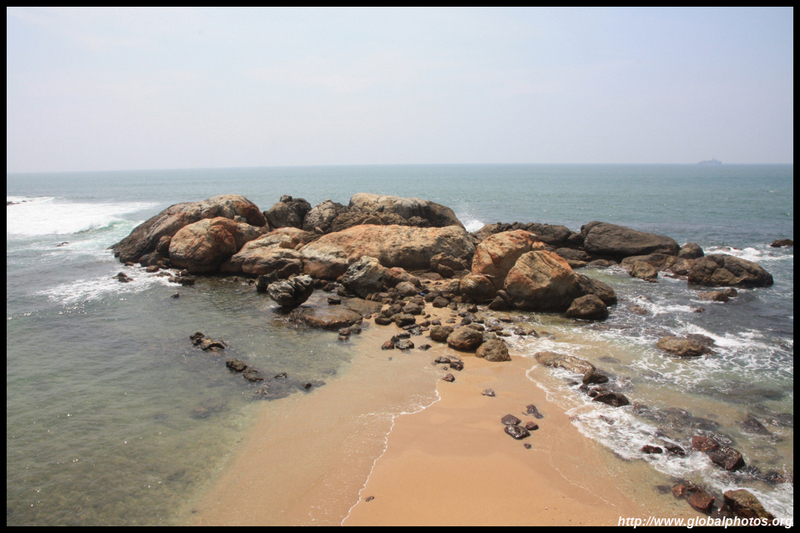 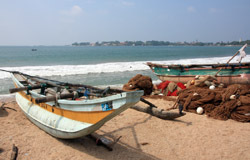 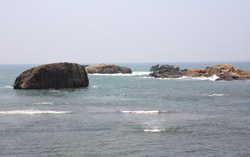 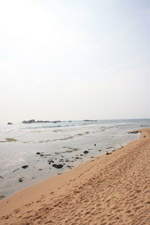 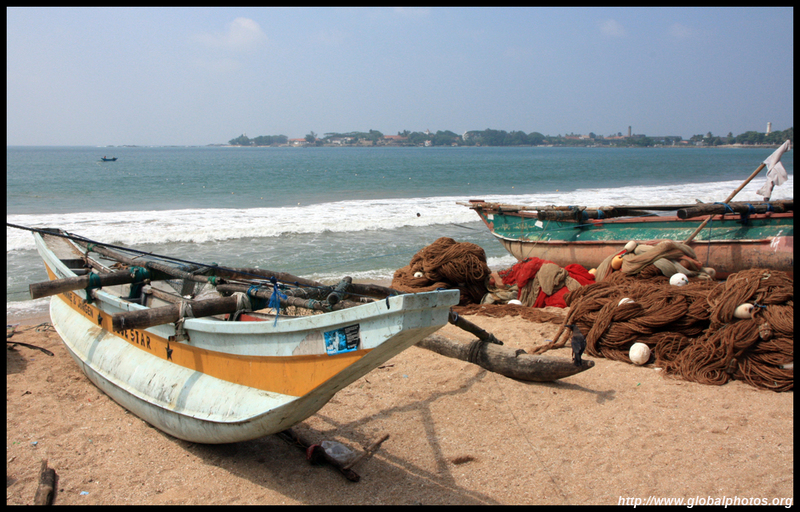 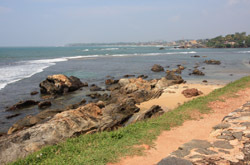 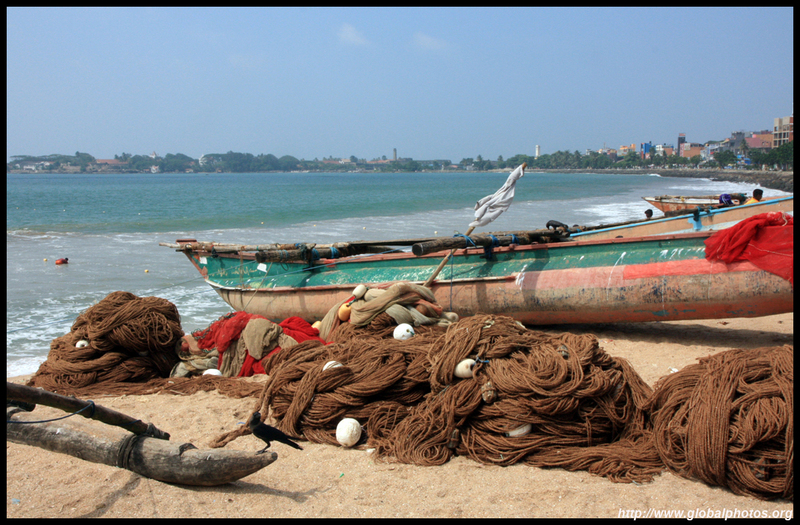 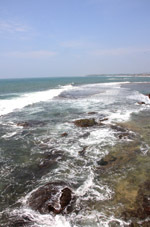 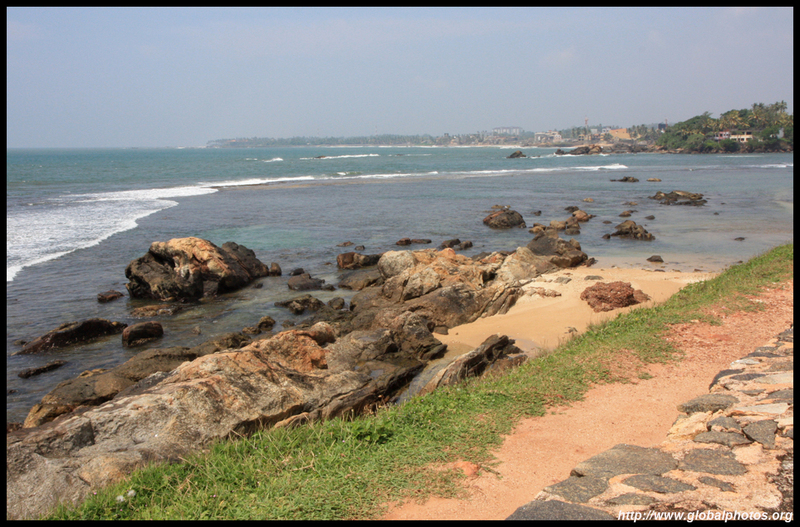 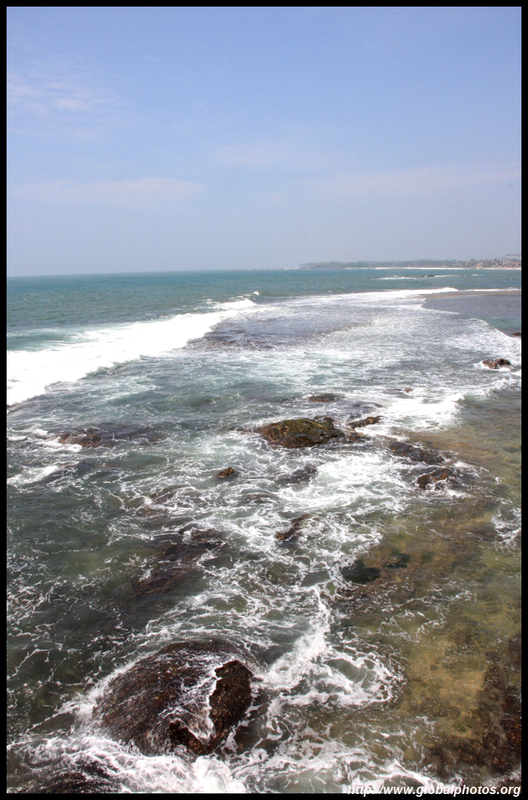 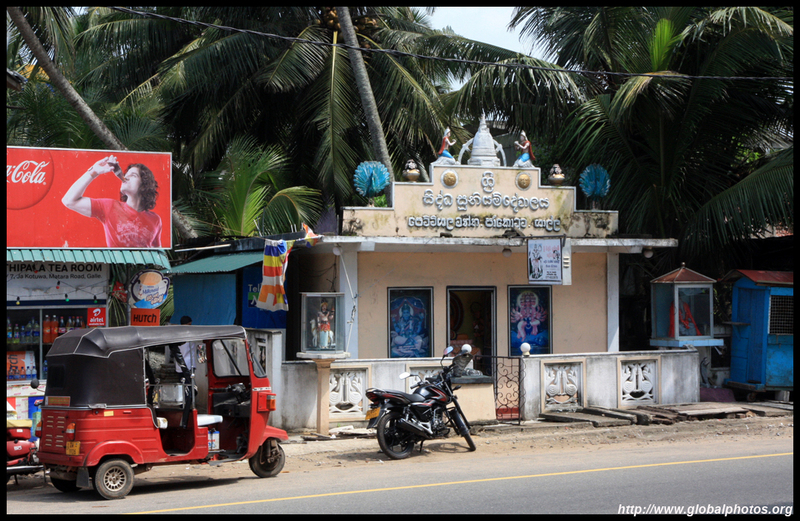 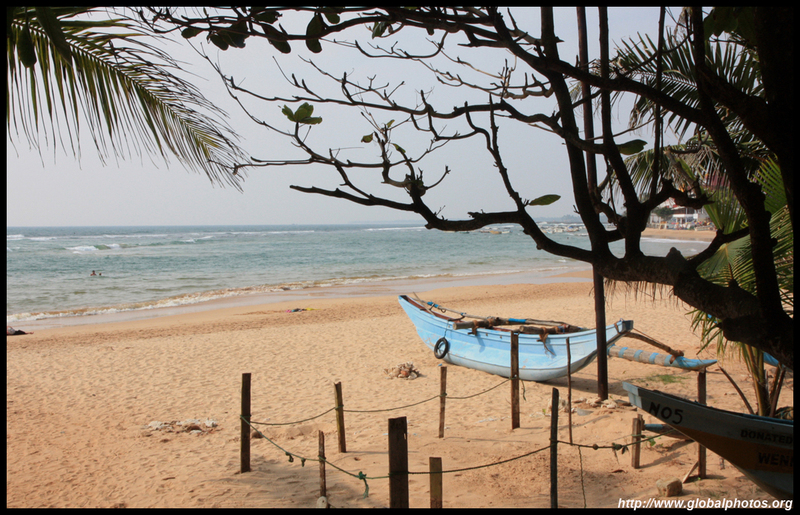 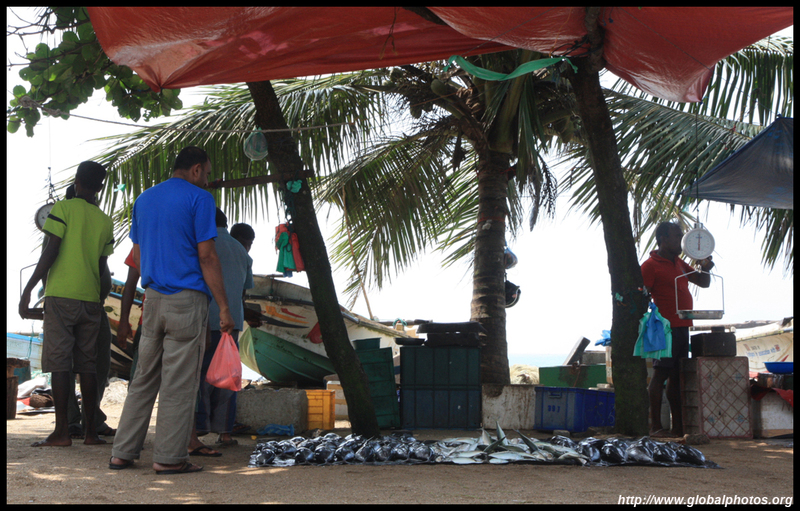 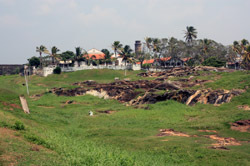 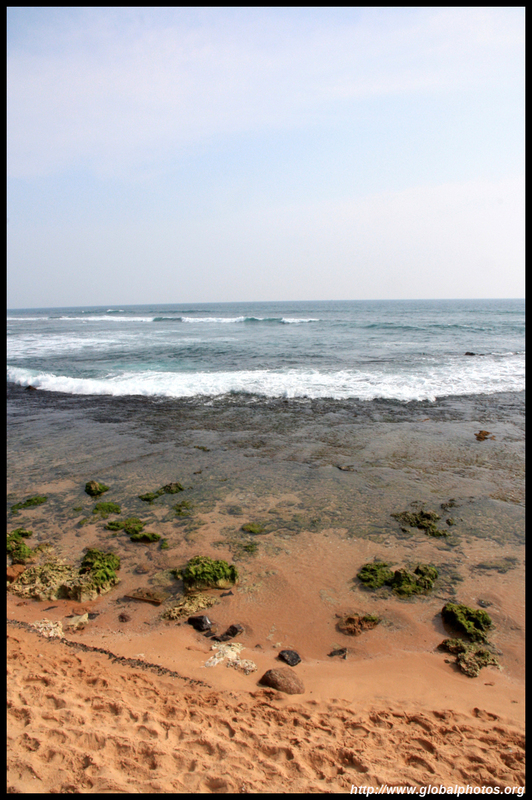 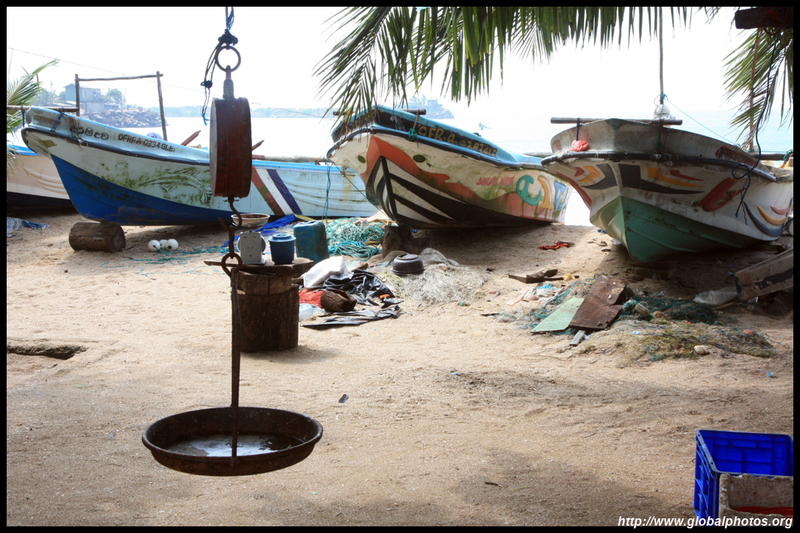 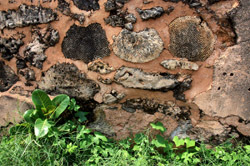 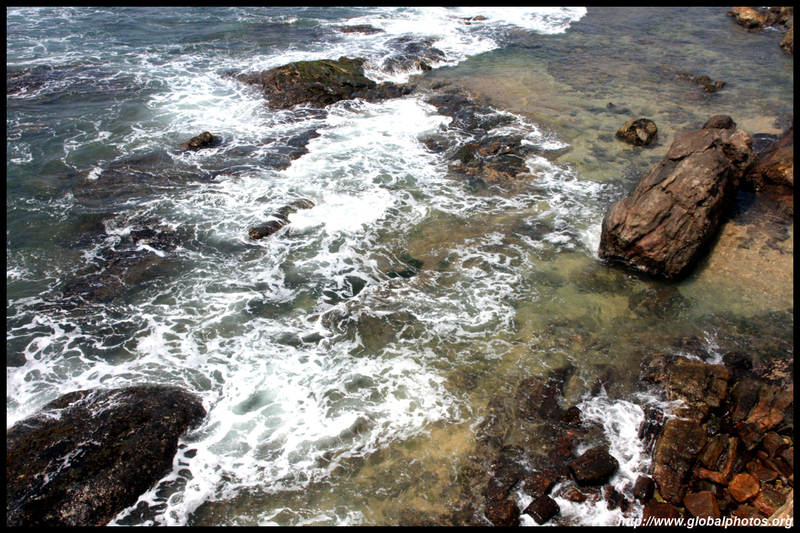 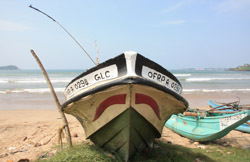 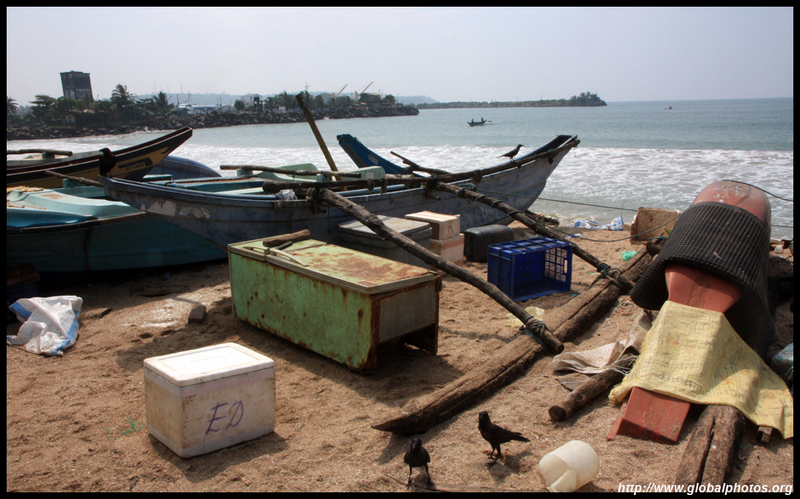 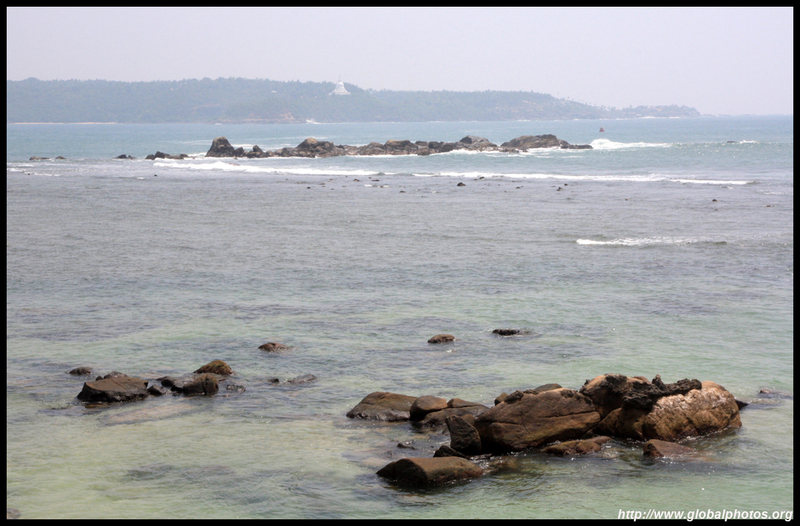 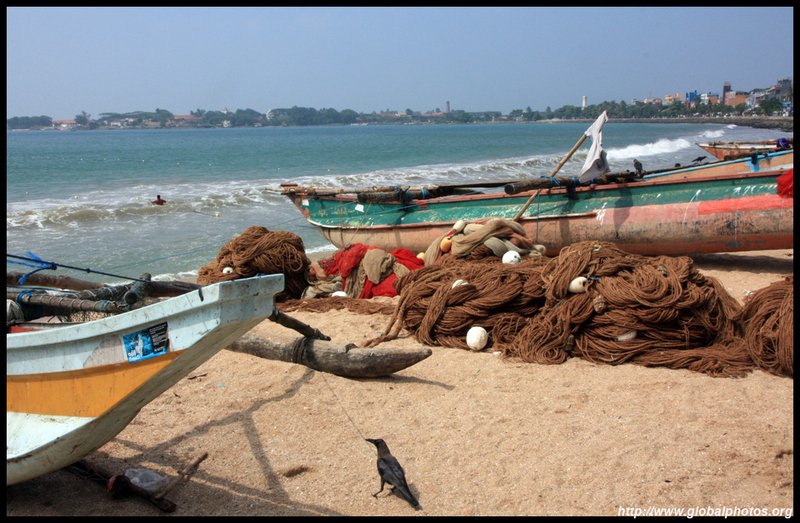 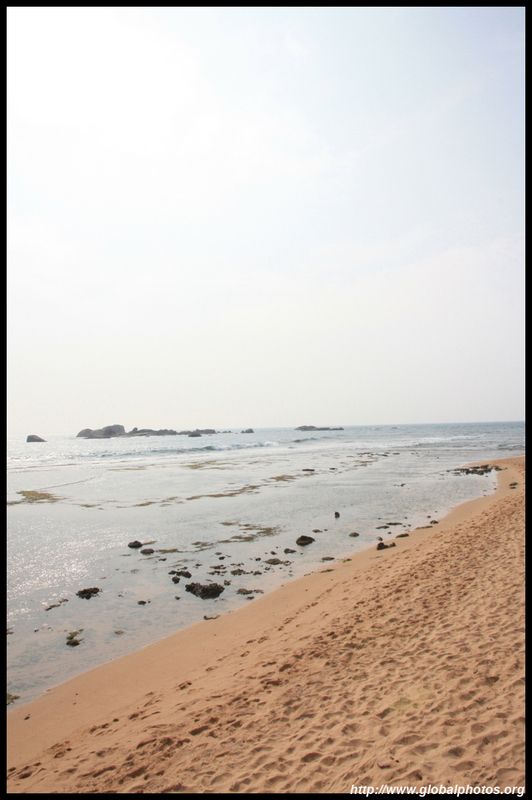 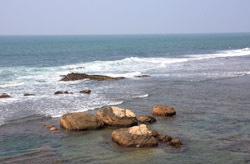 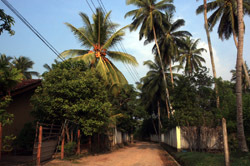 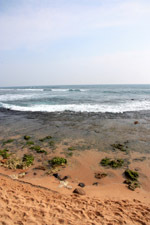 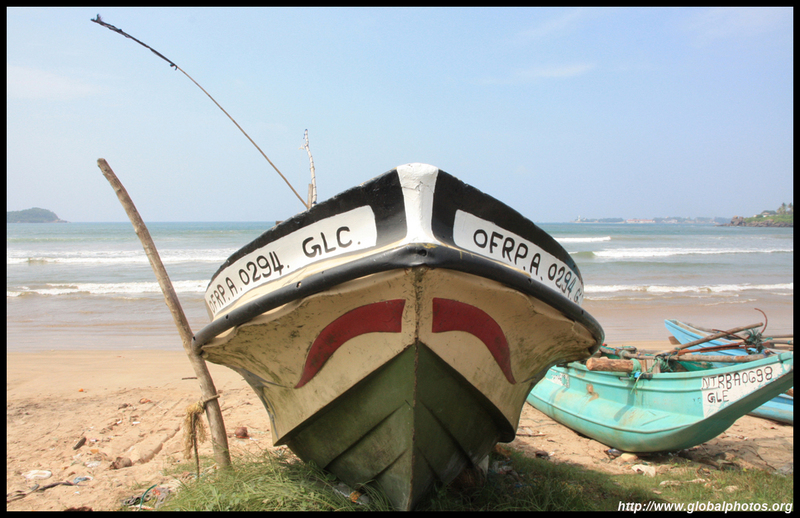 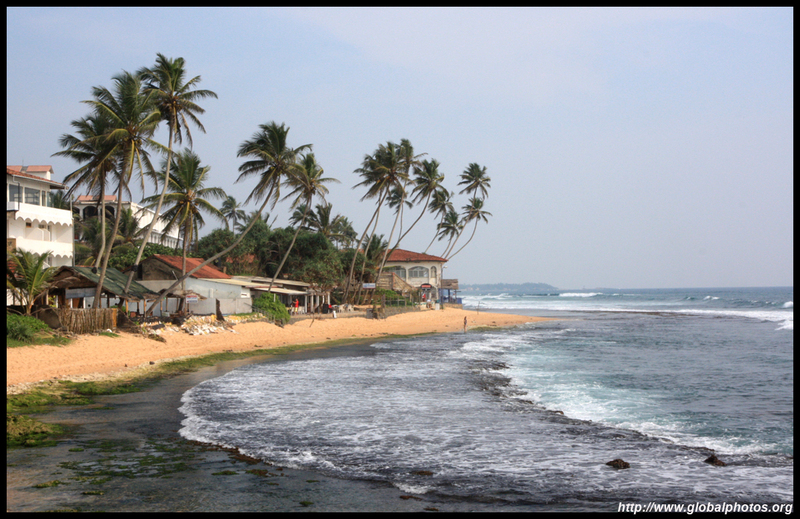 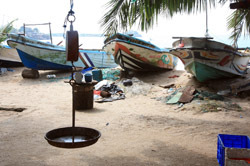 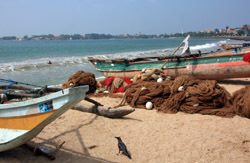 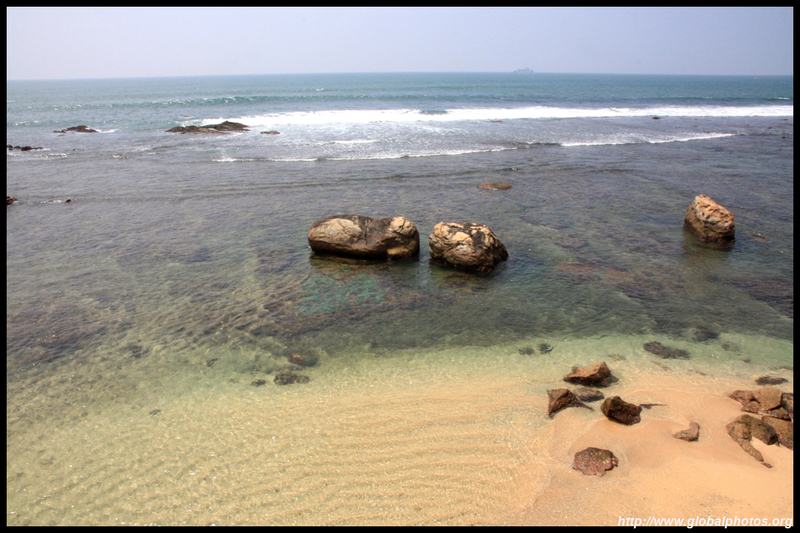 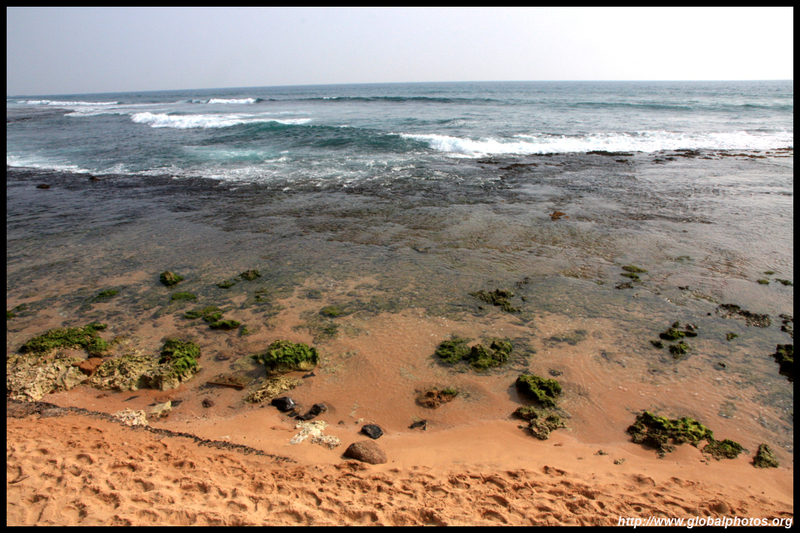 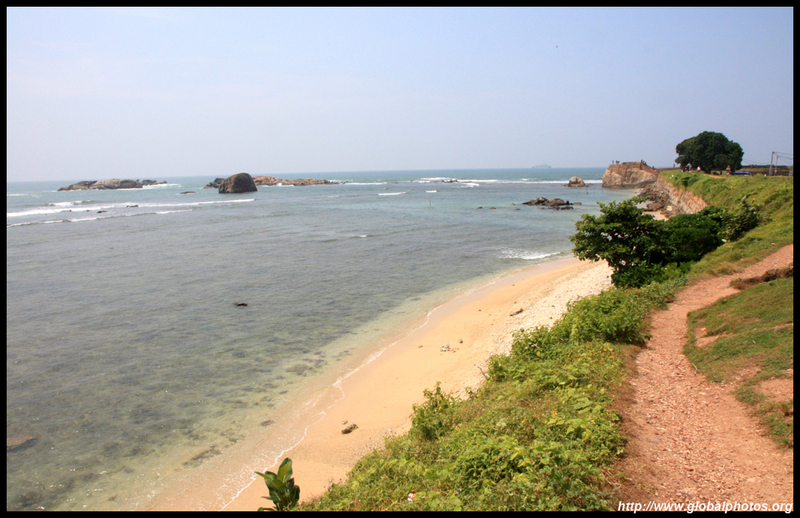 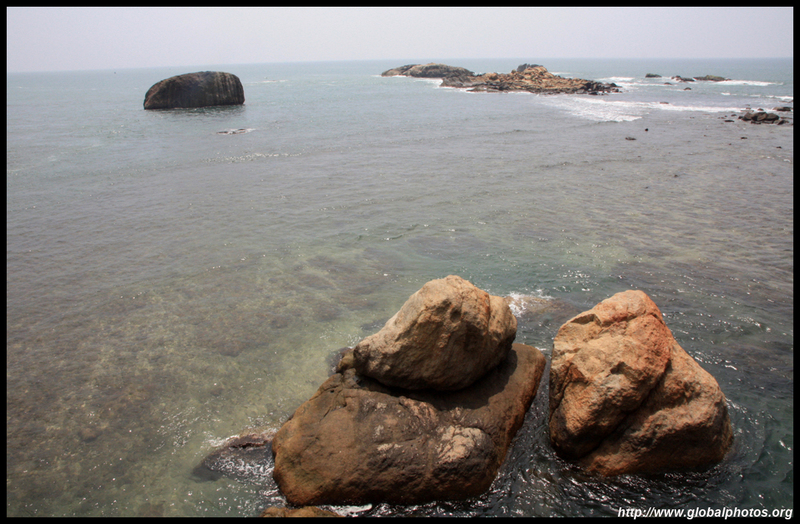 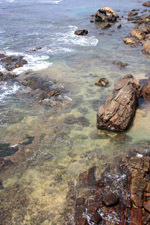 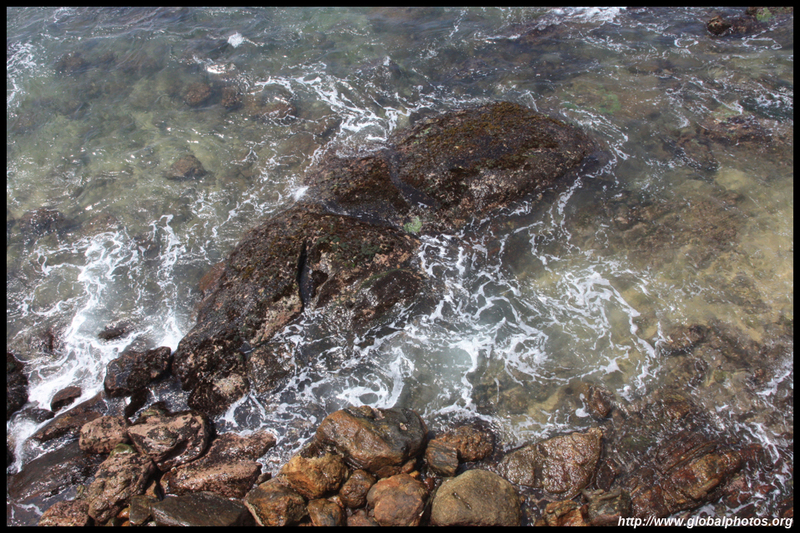 The 2004 tsunami wrecked havoc on this part of Sri Lanka's coastline. 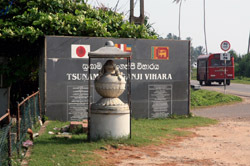 A memorial has been built to commemorate the victims. 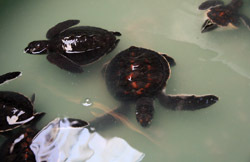 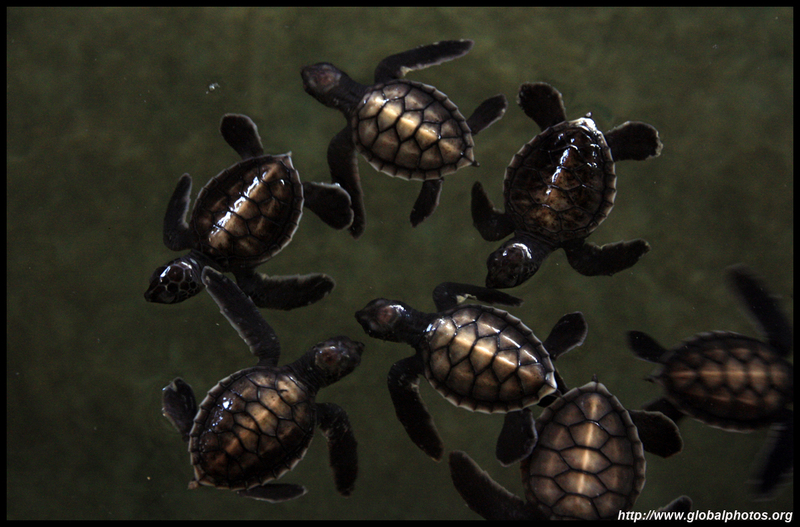 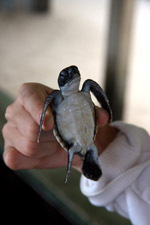 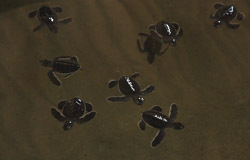 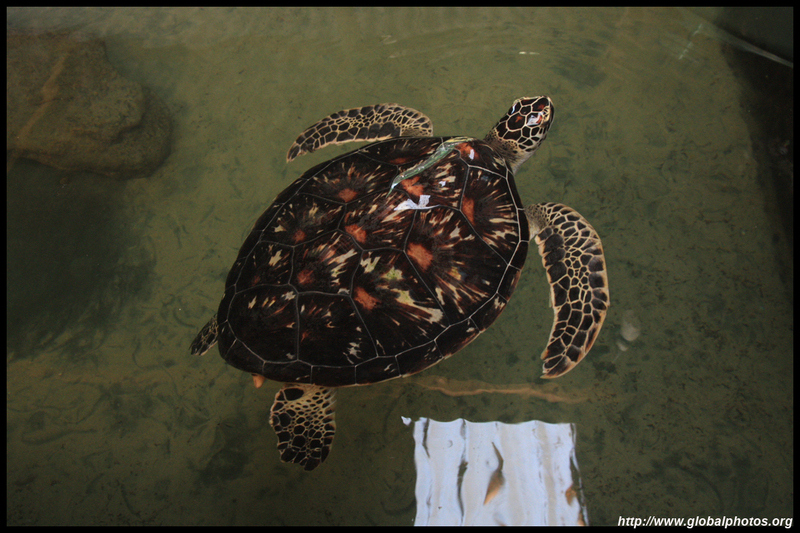 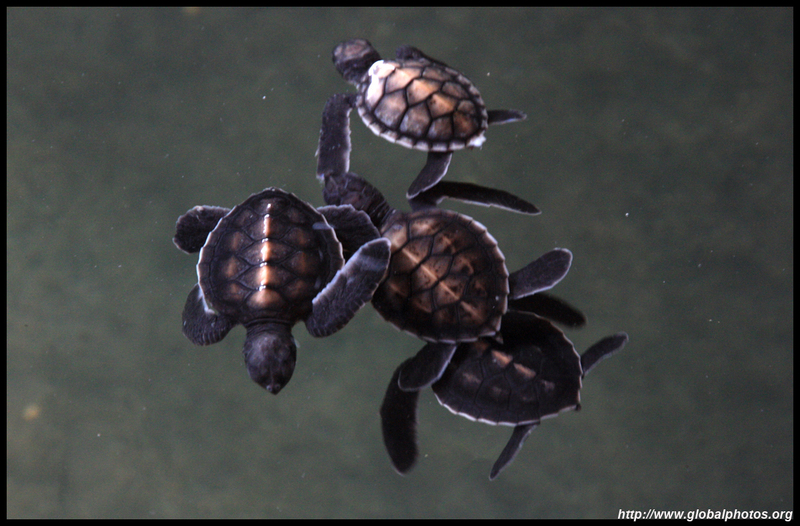 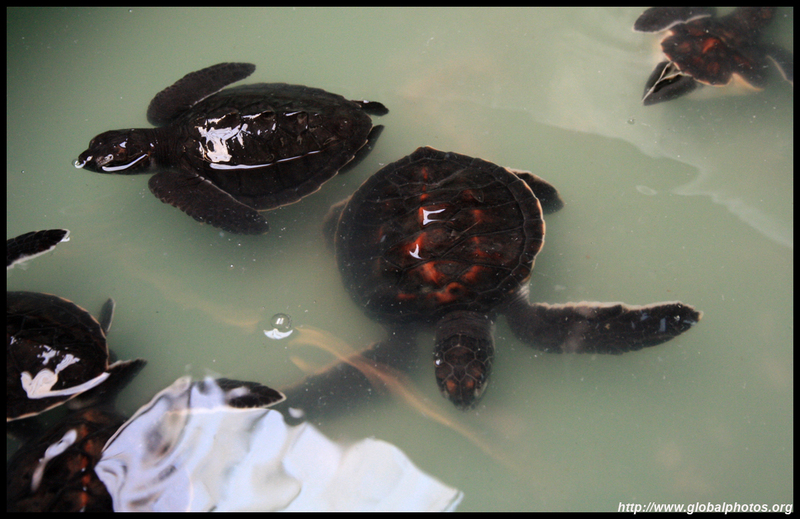 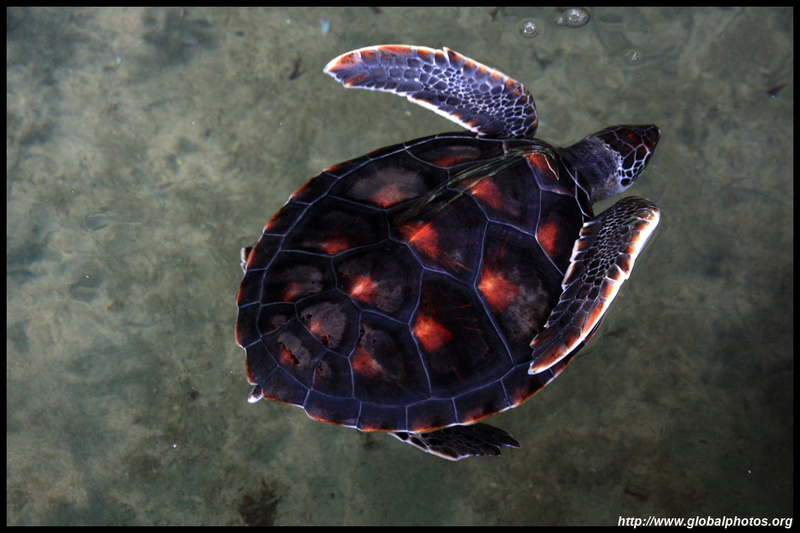 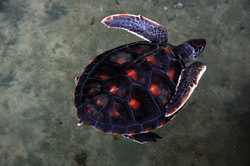 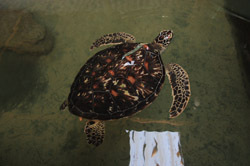 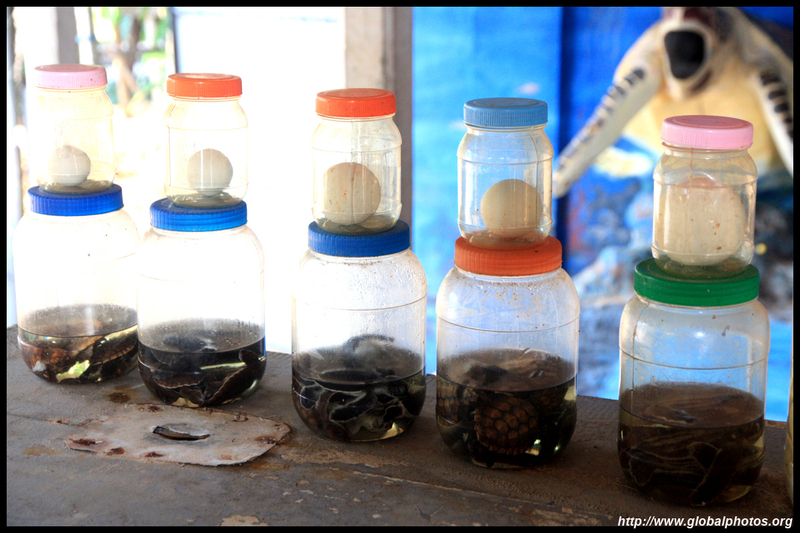 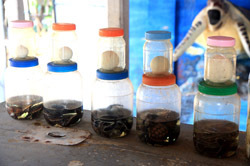 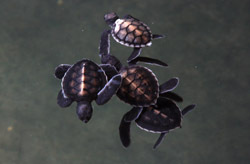 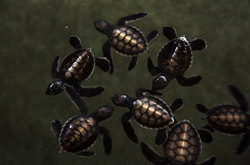 Visiting a turtle conservation centre appears to be on every trip itinerary to these coasts. 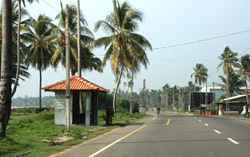 Then it is a long drive up the 2-lane road back to Colombo. The scenery is quite nice as the road hugs along the coast for part of the way. 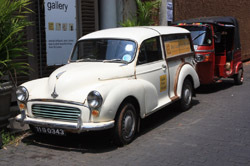 Traffic is heavy but you get to see lots of ancient vehicles in action.